(ca. 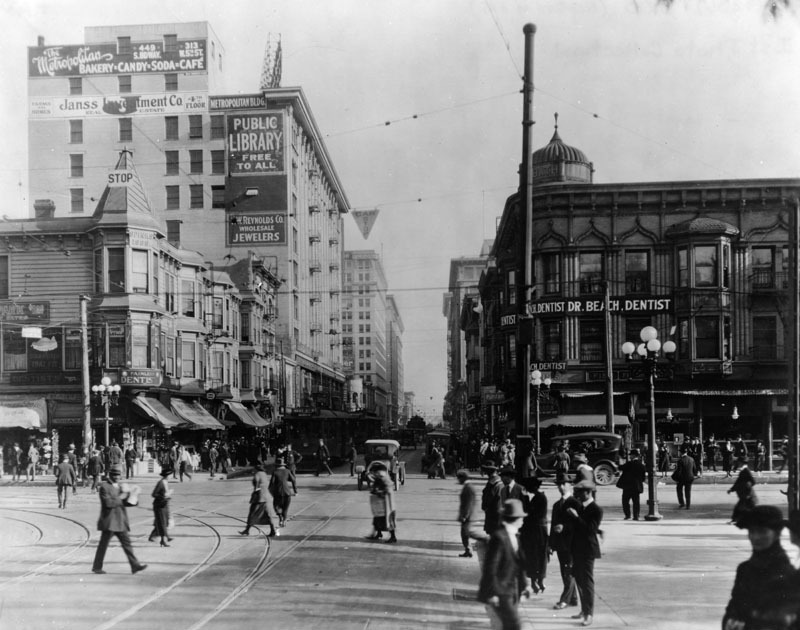 1917)^^ - Intersection of Main, Spring, and 9th streets in downtown Los Angeles circa 1917. 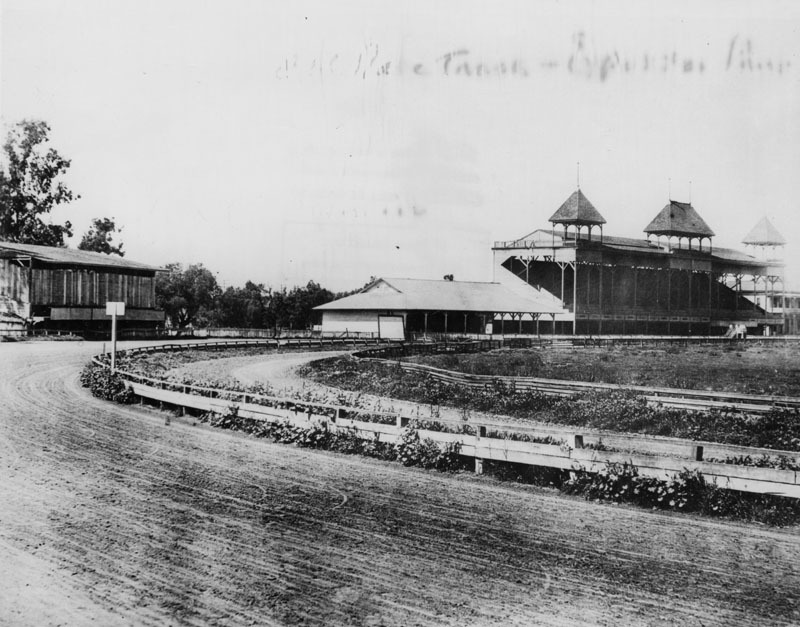 Note the elevated kiosk at the corner. 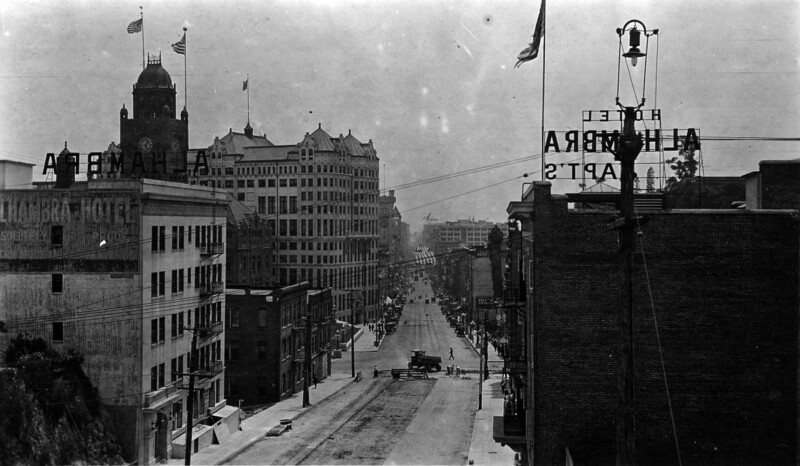 (1917)^ - Looking north up Spring Street (left) and Main Street (right) from 9th Street in downtown Los Angeles. (ca. 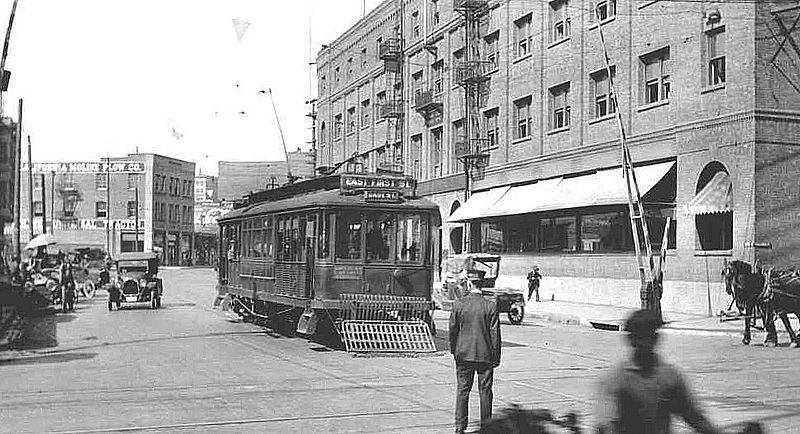 1918)*^ - The Los Angeles Railway's P Line trolley crossing Alameda Street at 1st Street in Little Tokyo as it heads for Boyle Heights in circa 1918. (ca. 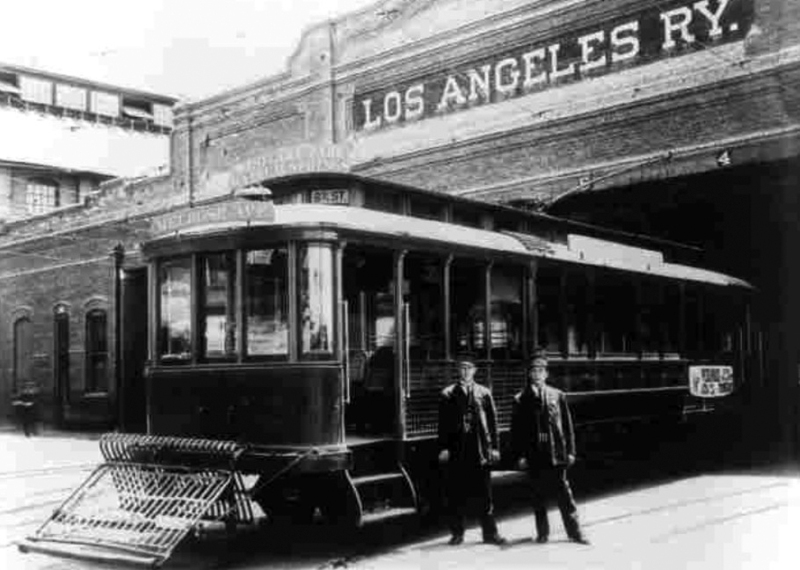 1909)^## – View showing a Los Angeles Railway streetcar at the MTA Division 1 located on Central Avenue between 6th and 7th streets. This site is still in operation. (ca. 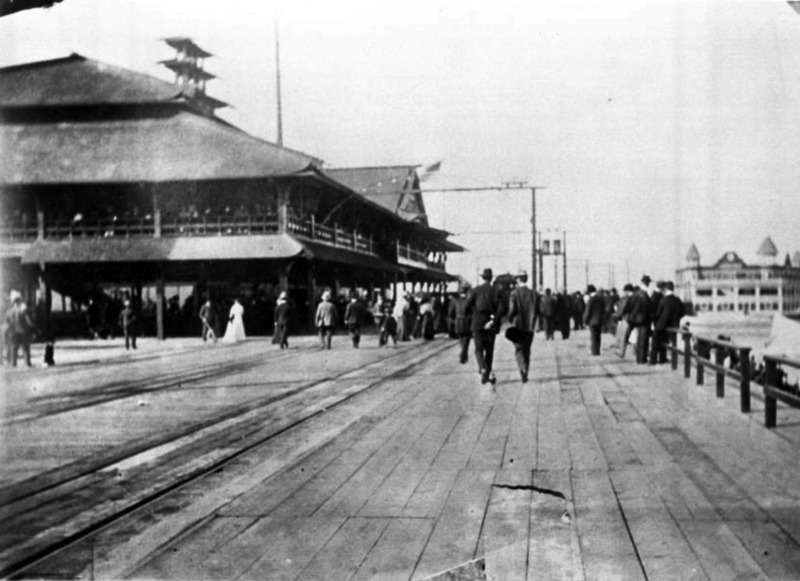 1914)^^ - View looking east on Fifth Street as it ends at the Southern Pacific Railroad Arcade Depot on Central Avenue. 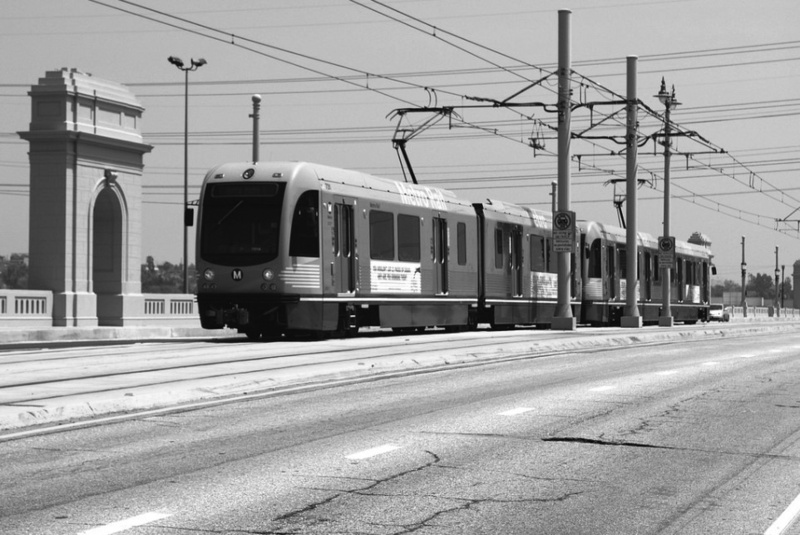 Two streetcars are parked in front of the railroad building on tracks that intersect with more tracks in the foreground. 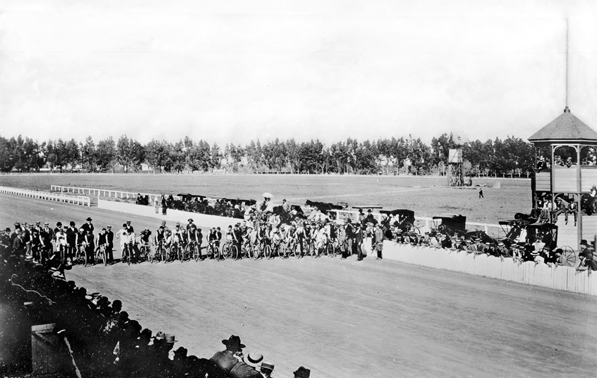 Several horse-drawn vehicles are visible, as well as many pedestrians making their way along the sidewalks that border the streets. 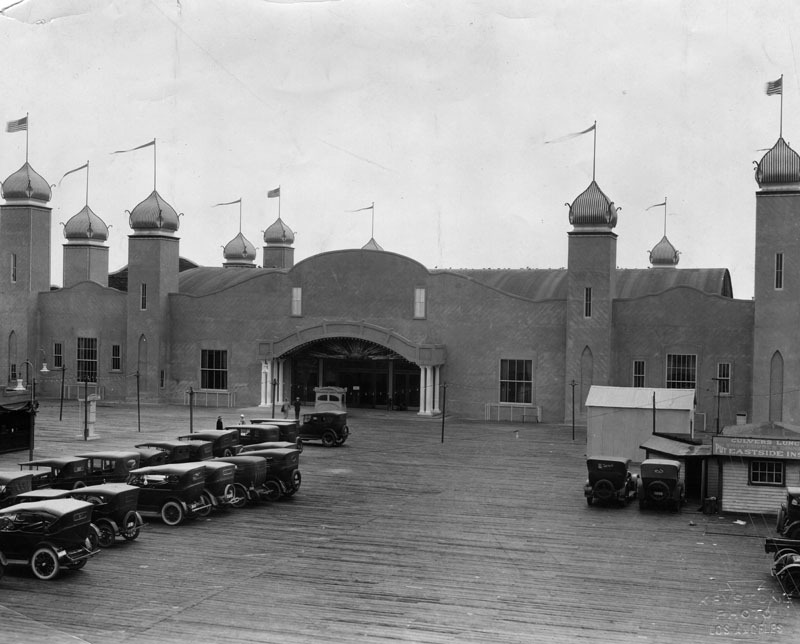 The ‘Arcade Depot Palm’ is seen standing near the center of the building. Amazingly, the original Arcade Depot Palm is still alive. 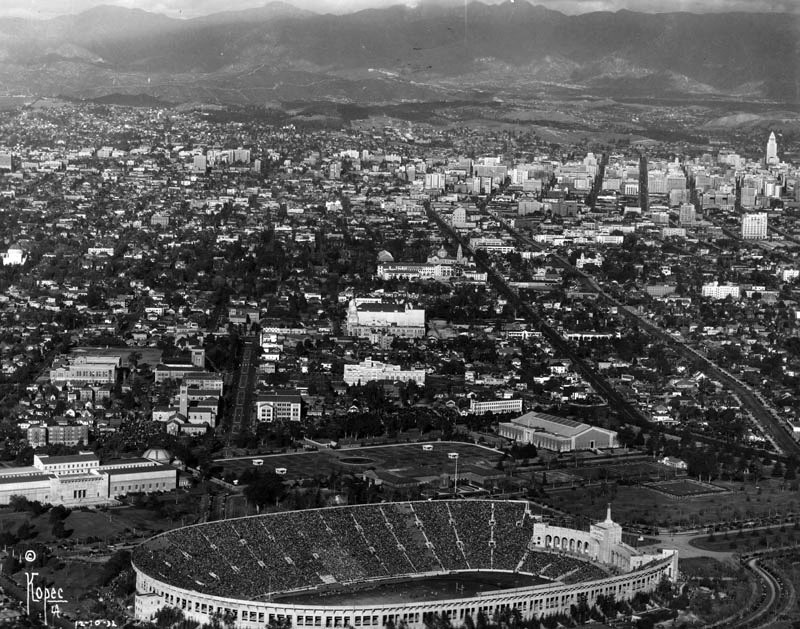 It was replanted at a location in front of the Los Angeles Coliseum where it stands today. 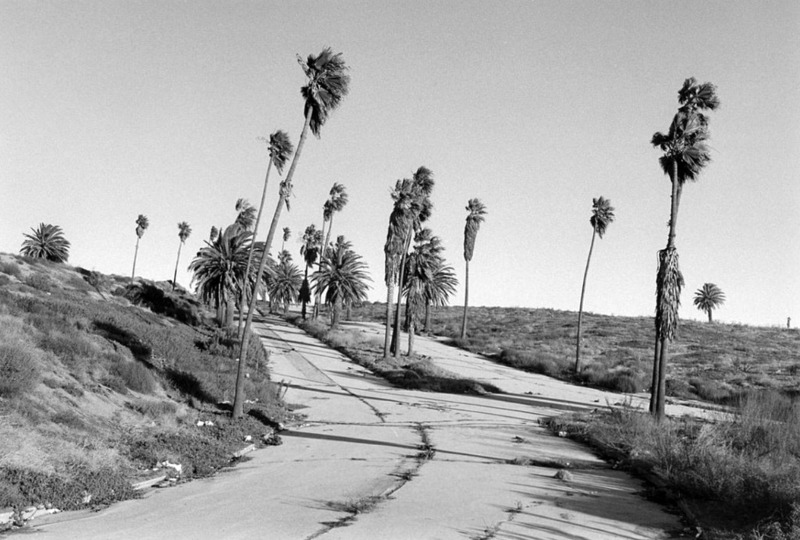 It along with the Longstreet Palms are considered to be the oldest trees in the City of Los Angeles. 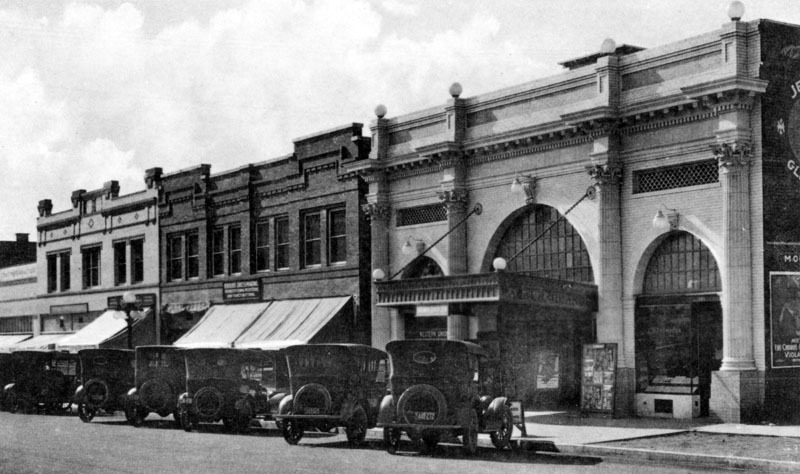 Click HERE to see more on the Arcade Depot and the old Arcade Depot Palm. (ca. 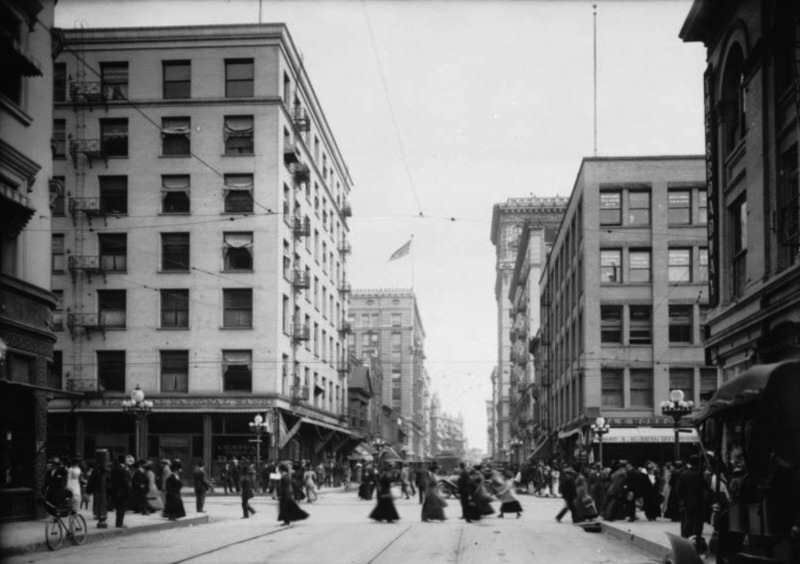 1920)^ - View showing two women attempting to cross the street in front of Court Flight Cable Railway. 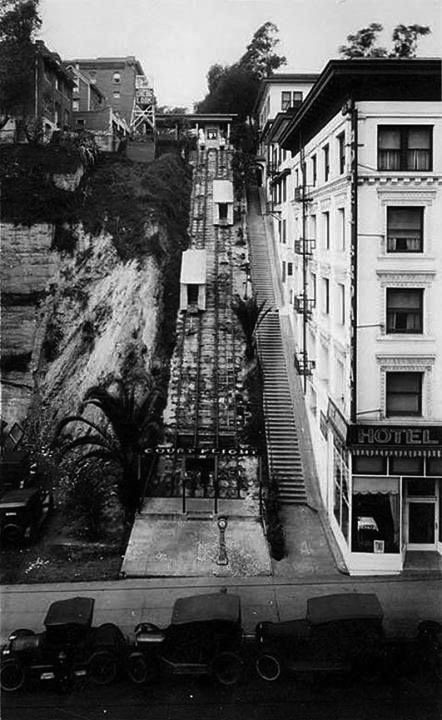 In the background can be seen the Court Flight's two cable cars passing each other on the tracks. To the right is a restaurant on the ground level of the New Hotel Broadway. On the left, behind the two men on the sidewalk, is a sign that reads: "AUTOS WASHED, POLISHED, & GREASED". (ca. 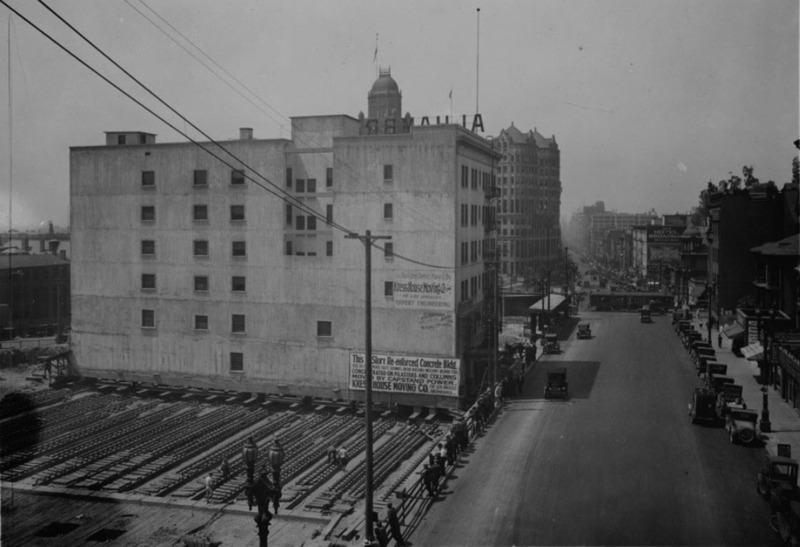 1920)^ - Court Flight Cable Railway, located next to the New Hotel Broadway, located at 205 North Broadway, opposite the Hall of Records and County Courthouse. Construction material can be seen stacked on the curbside. 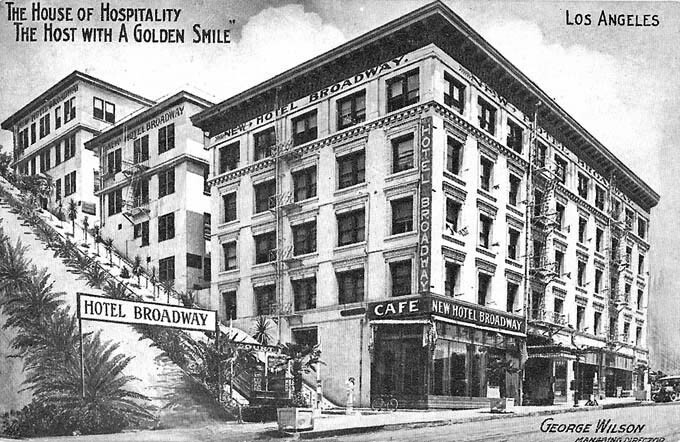 (1916)^*^# - Postcard view of the New Hotel Broadway adjacent to Court Flight. Card reads: "The House of Hospitality, The Host with A Golden Smile" - George Wilson, Managing Director. (ca. 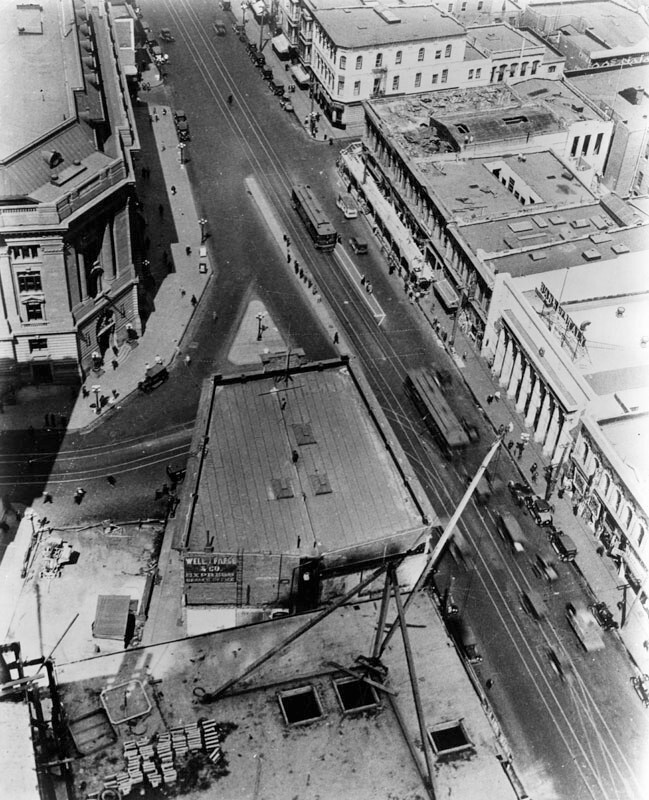 1920s)#**^ – View looking down toward Court Flight showing two cable cars about to pass each other. 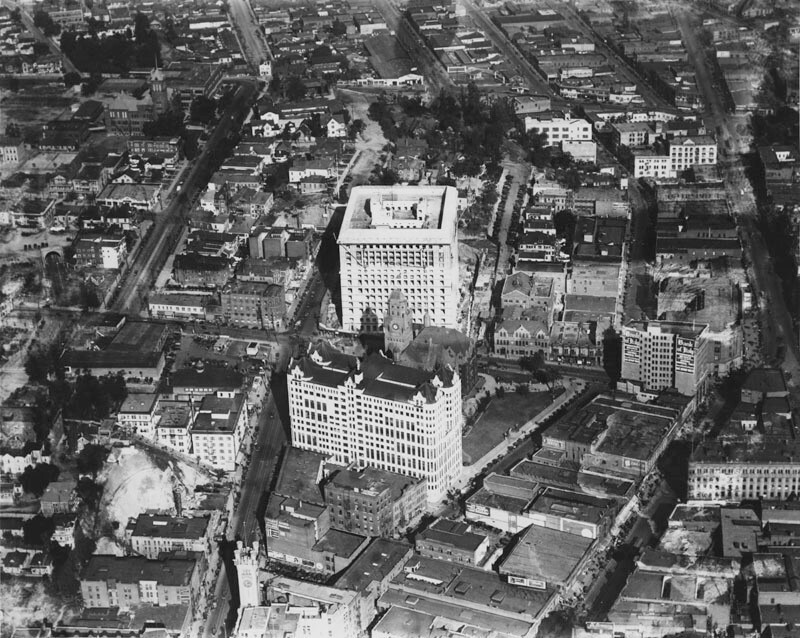 The Hotel Broadway is seen on the right. 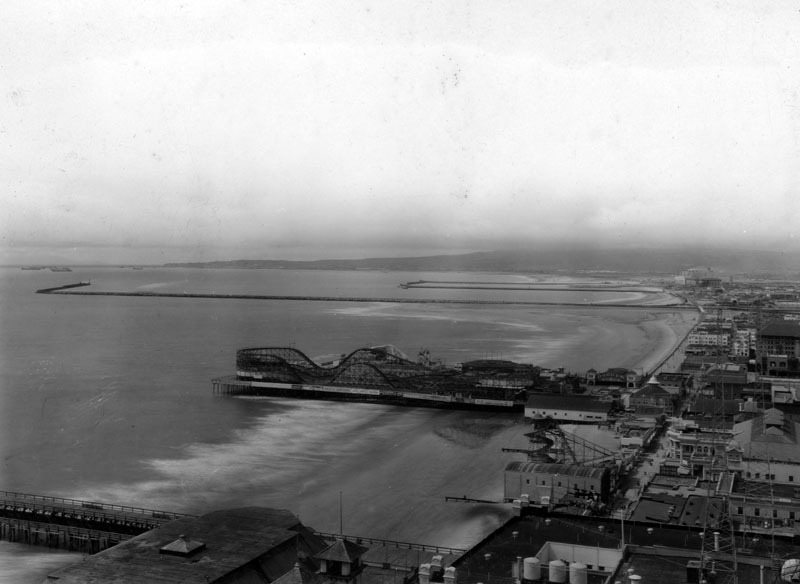 Note the observation tower in the upper-left. 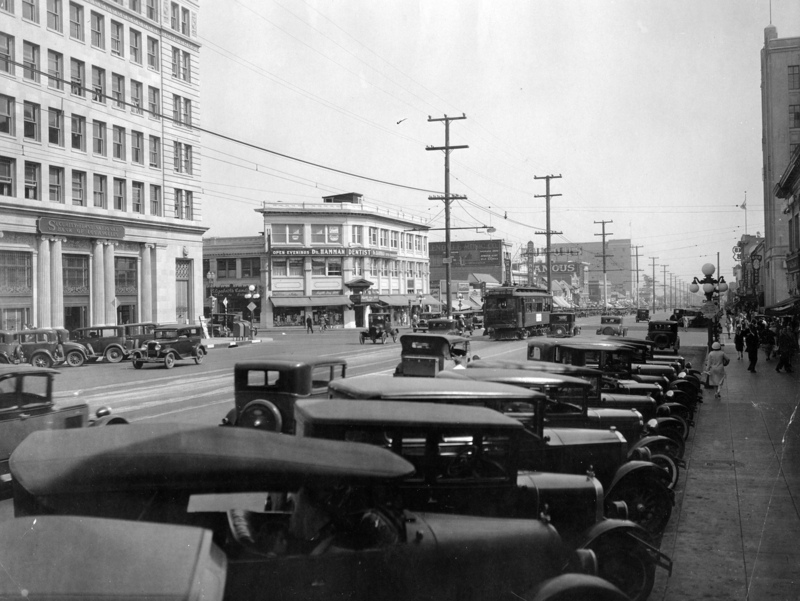 (1920s)^ - Cars parked in front of Court Flight Cable Railway on North Broadway at Court Street. 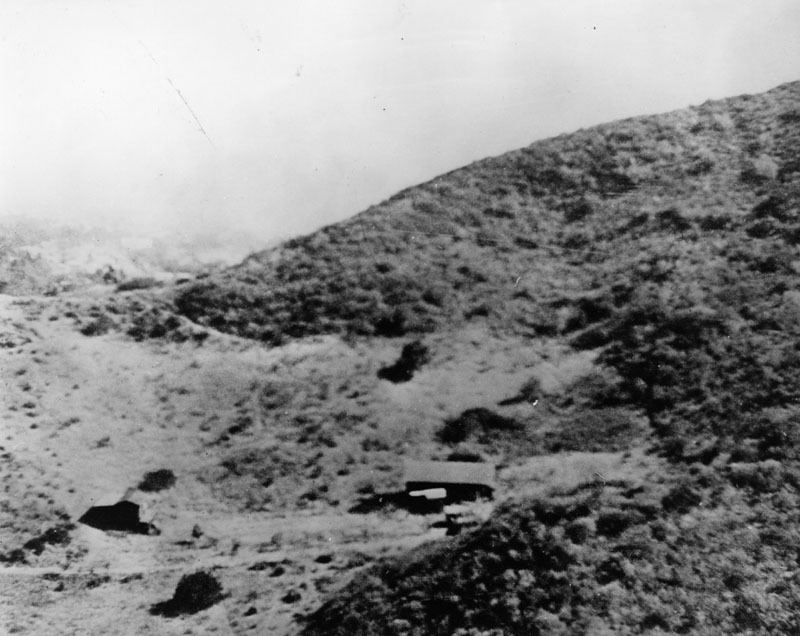 An observation tower can be seen at the top of the hill. 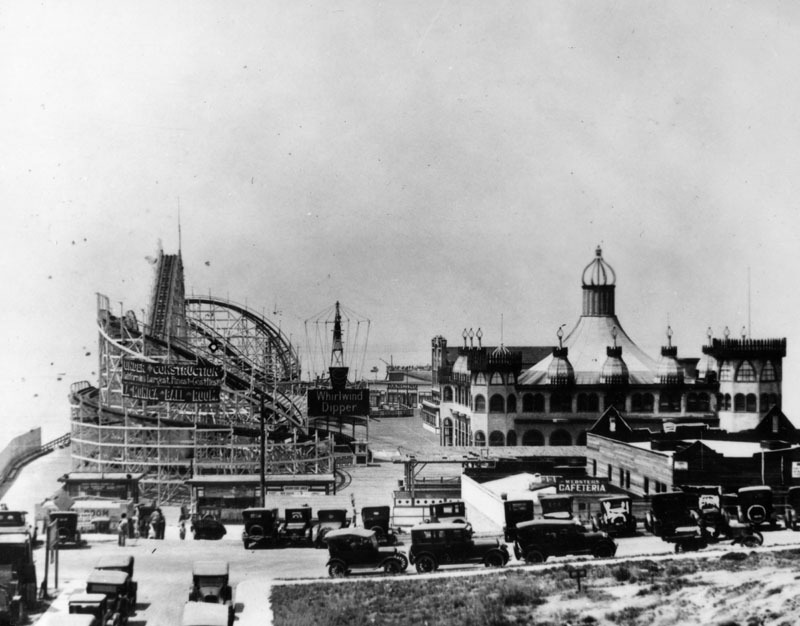 Sign on tower reads: "ONE BIG LOOK". (ca. 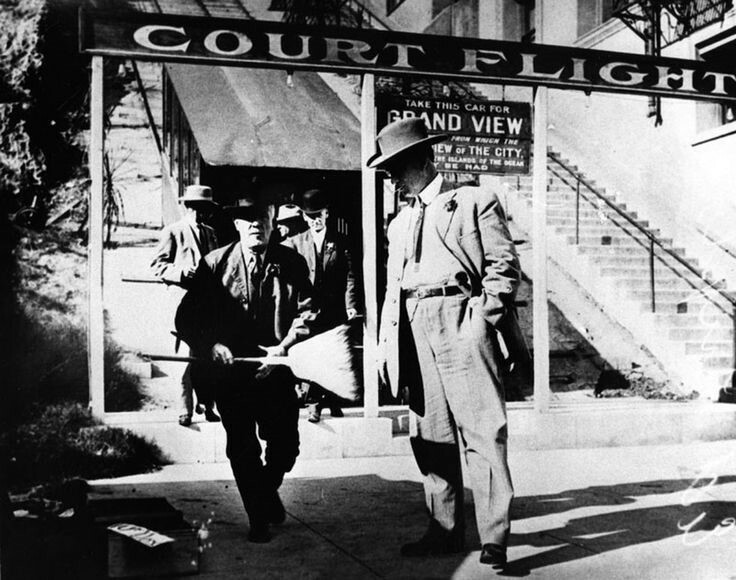 1920)^ – View showing passengers disembarking Court Flight at its base. 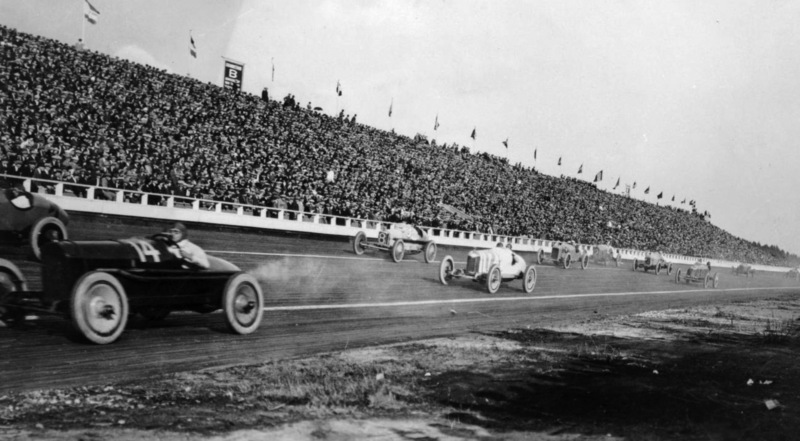 Sign behind the man in foreground reads: "TAKE THIS CAR FOR GRAND VIEW". 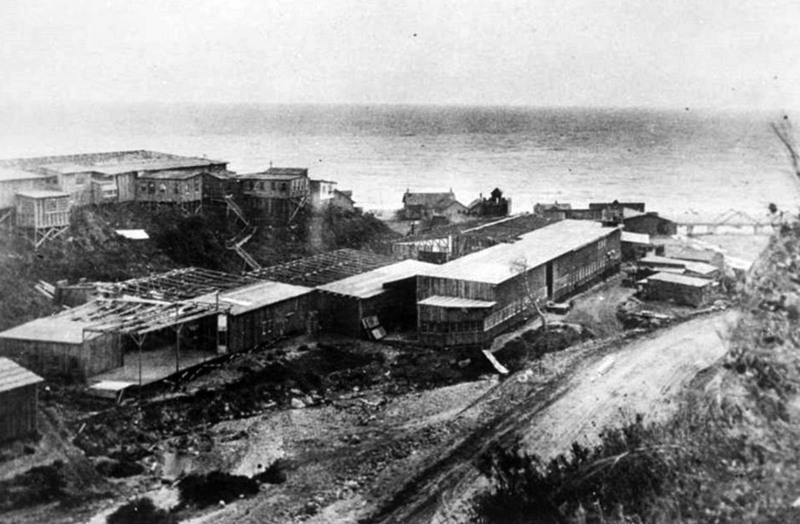 (Early 1900s)^ - View looking west to the Hall of Records and other nearby buildings. 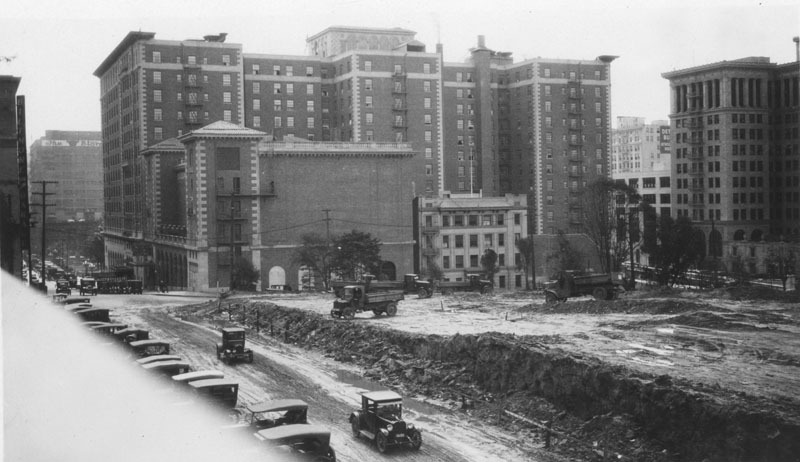 Constructed between 1909 and 1911 to the cost of over a million dollars, the 12-story original Hall of Records at 220 N. Broadway was demolished in September, 1973. 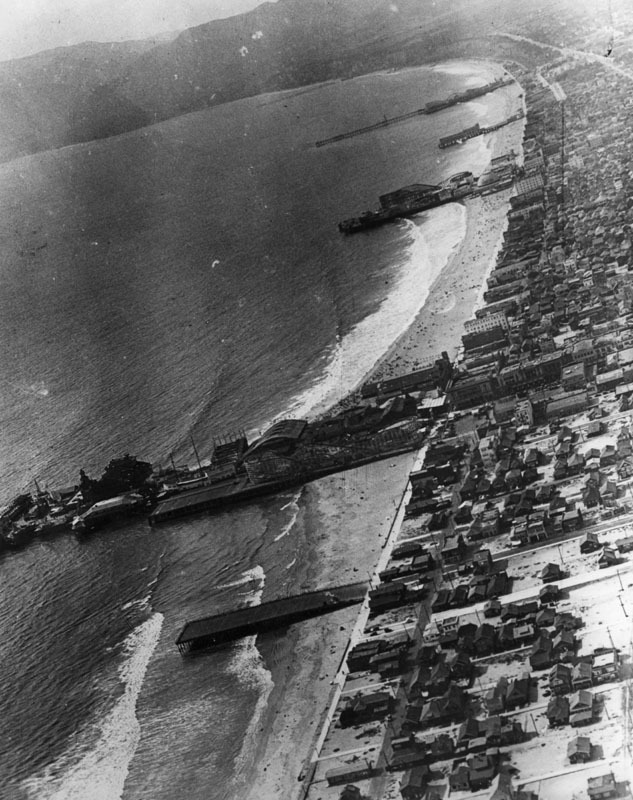 Court Flight can be seen in the background (center of photo). 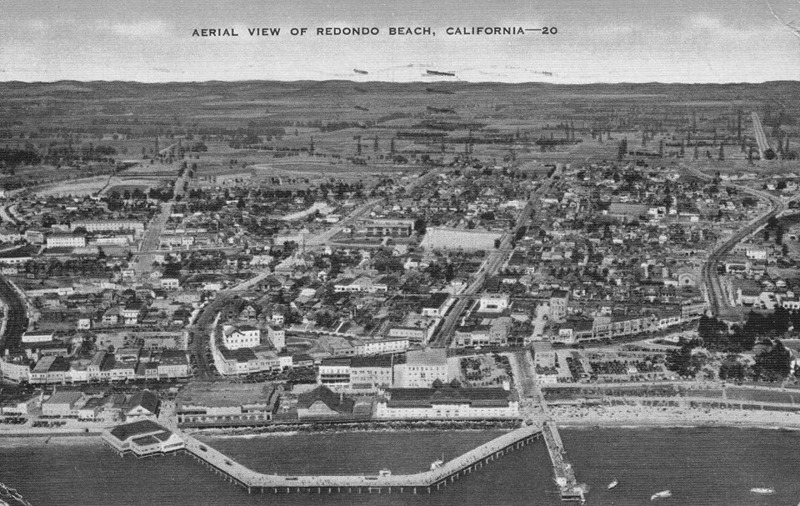 (1924)^ - Aerial view looking north up Main, Spring and Broadway Streets from a point just over 1st Street. 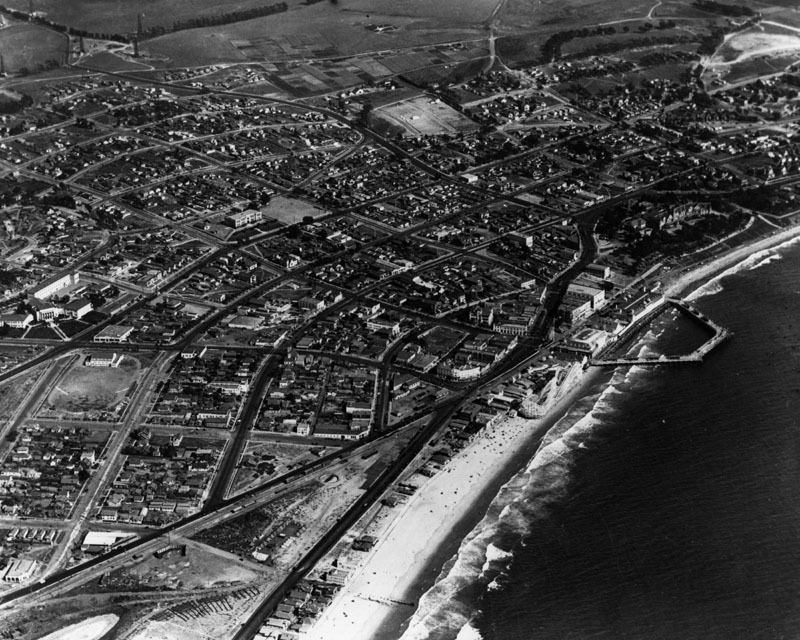 Both Court Flight Cable Railway and Hotel Broadway can be seen at lower center-left. 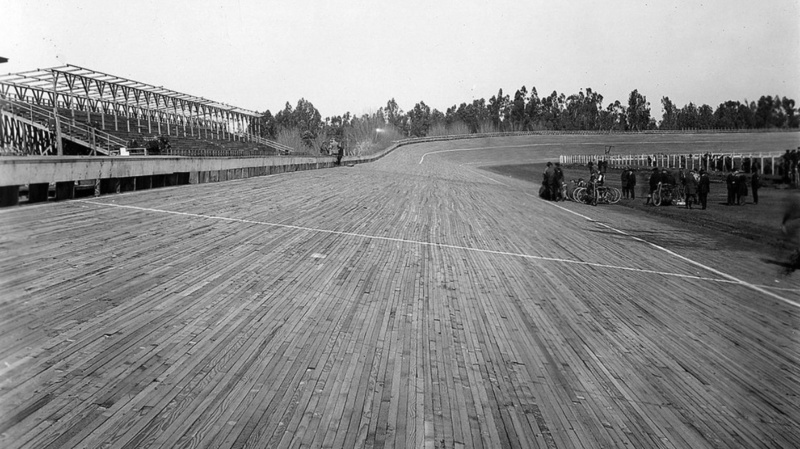 Click HERE to see the "Victoria Park Fixture" in Early Los Angeles Street Lights. Many of the homes in the Victoria Park neighborhood were built between 1910 and 1915 and serve as fine architectural examples of The American Arts and Crafts Movement. 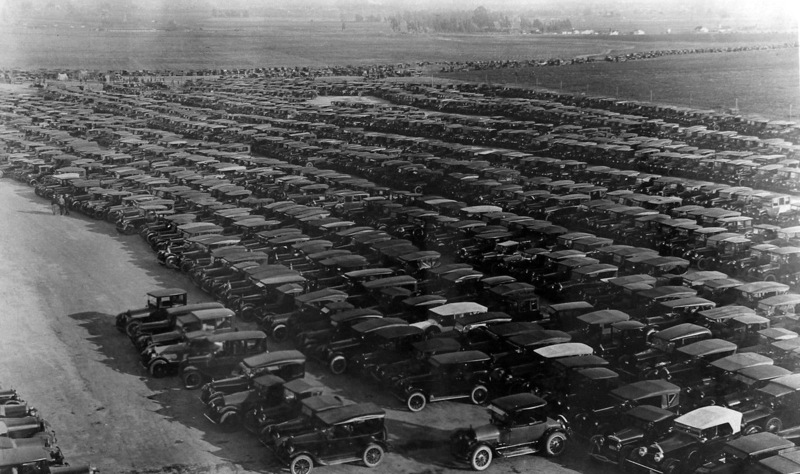 The area was intended to be all single-family homes, but was rezoned in the 1920s and some duplexes were built. (ca. 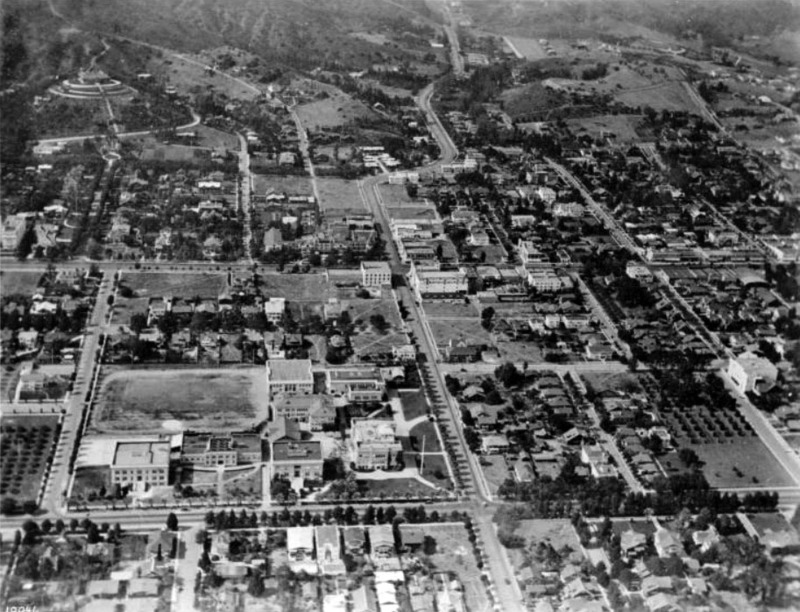 1918)^^ - Aerial view looking north showing Windsor Square and part of Hancock Park. 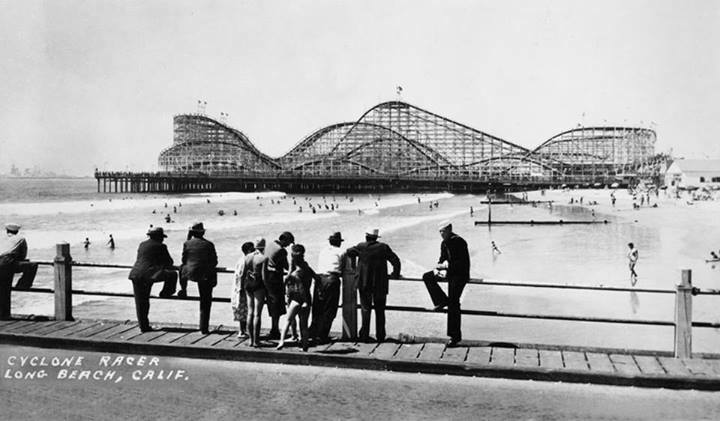 Sometime between 1900 and 1910 a prominent financier named George A.J. 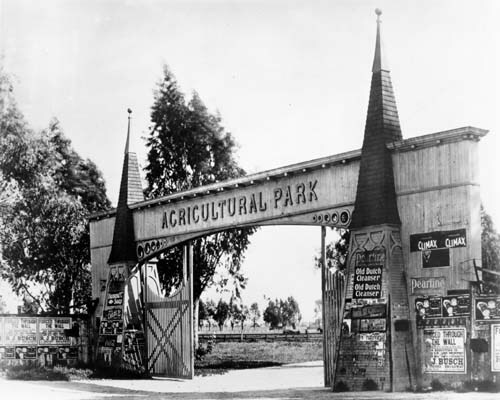 Howard envisioned a beautiful tranquil park as a setting for family homes such as one sees in the English countryside in what was then an undeveloped and rural area about halfway between the city center (now Downtown LA) and the coast. 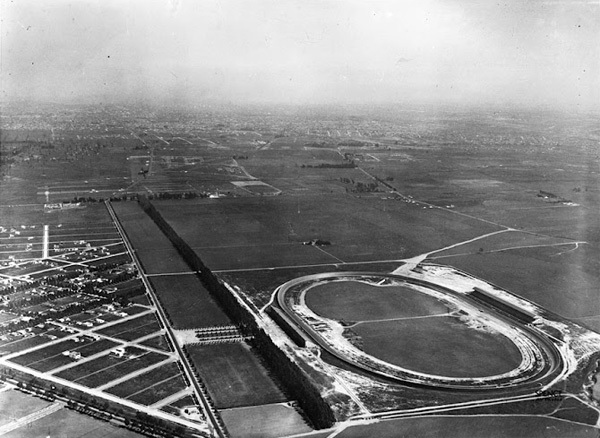 Howard pushed the early city fathers to make his vision come true, and in 1911, Mr. Robert A. Rowan was able to initiate a unique residential development and called it Windsor Square. 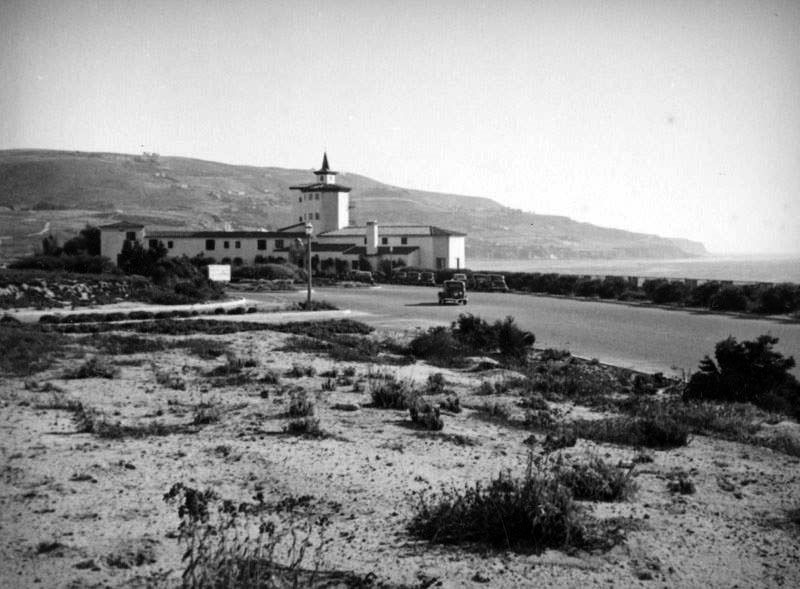 The development was constituted as a private square. 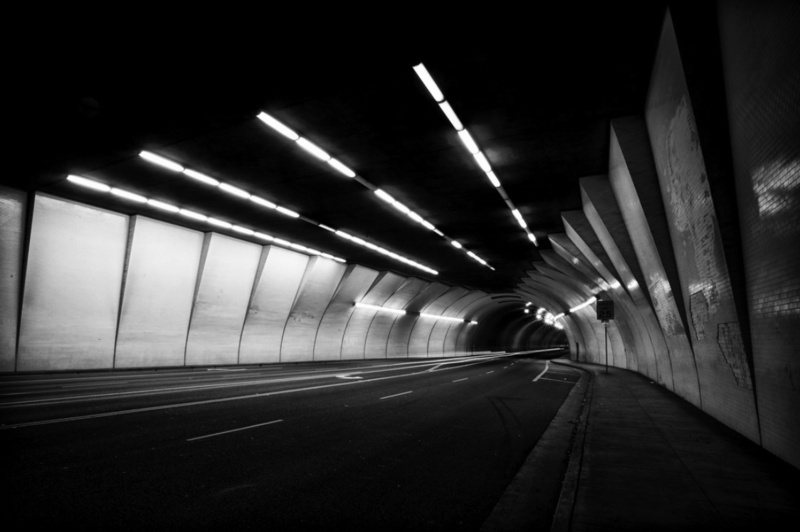 Both the homes and the streets would be privately owned. 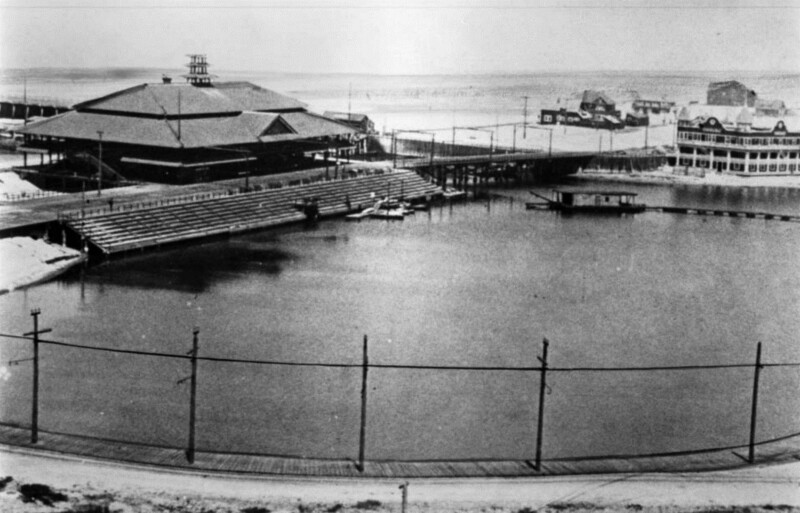 At that time there were dense groves of bamboo in the area that needed to be destroyed before trees and gardens could be cultivated. Intervening walls or fences were discouraged so that one garden ran into another, creating a park-like setting. (ca. 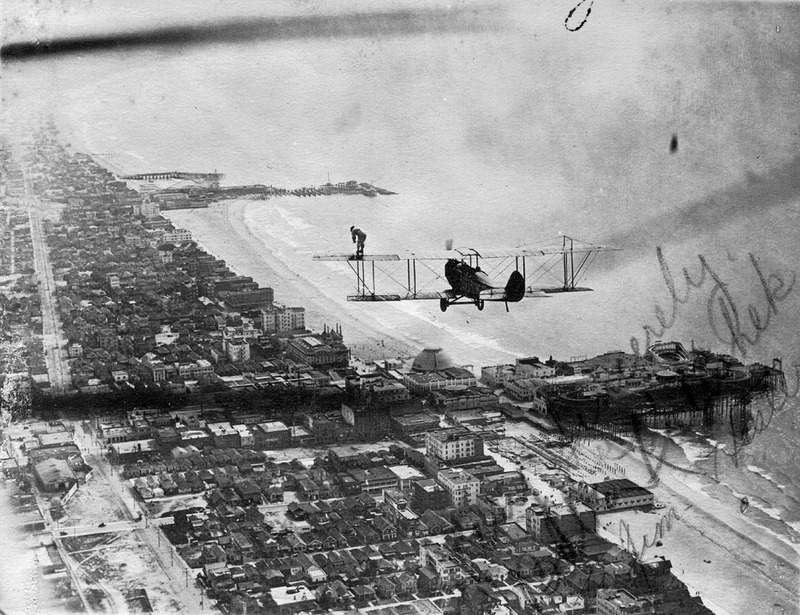 1918)^#^ - Same photo as above but with annotations. 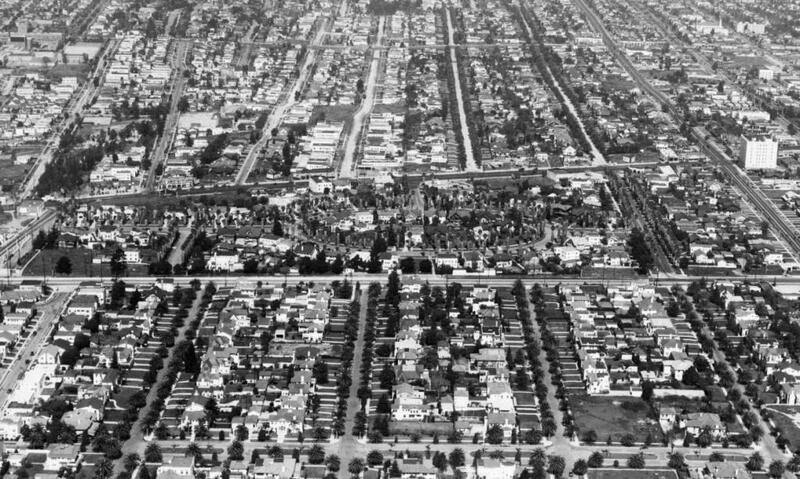 Windsor Square is at center of photo, while Wilshire Country Club and Hancock Park are to the west (left). The Marlborough School can be seen at the corner of 3rd Street and Rossmore (on the left). 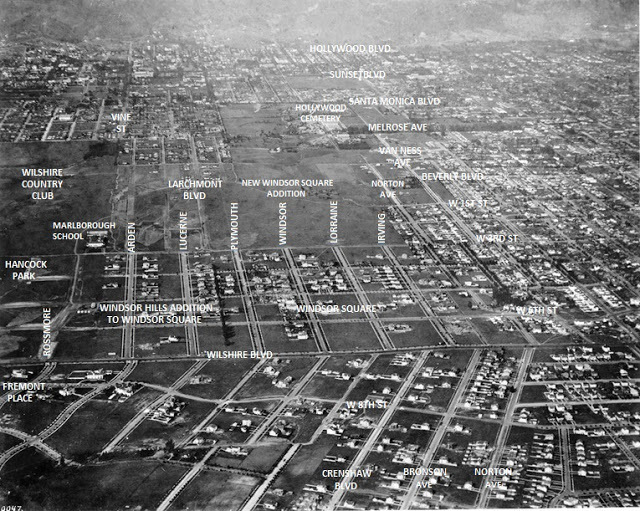 Windsor Square was later expanded to the north, east, and west. 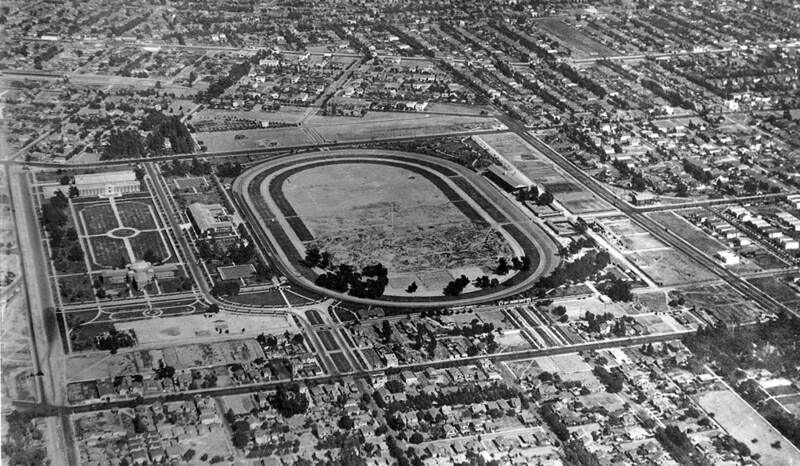 Today, Windsor Square runs from Wilshire to Beverly Boulevards, and from Arden Boulevard to Van Ness Avenue. 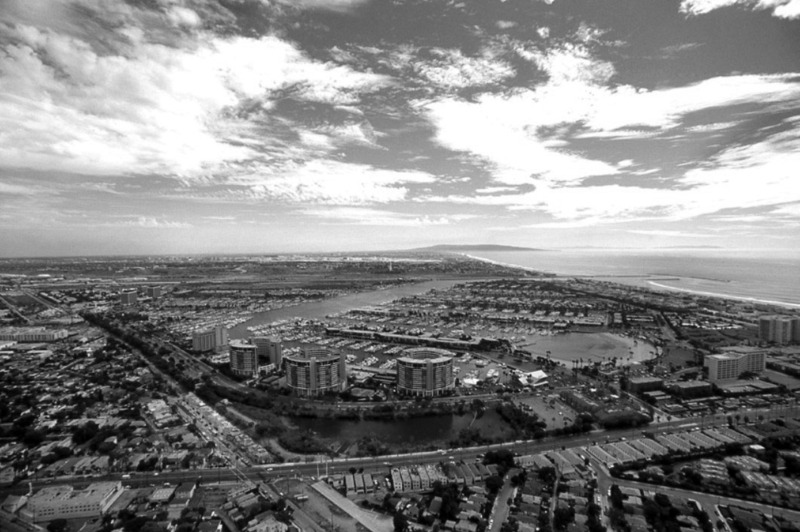 This is inclusive of the one-block strip of Larchmont Village, between First Street and Beverly Boulevard. 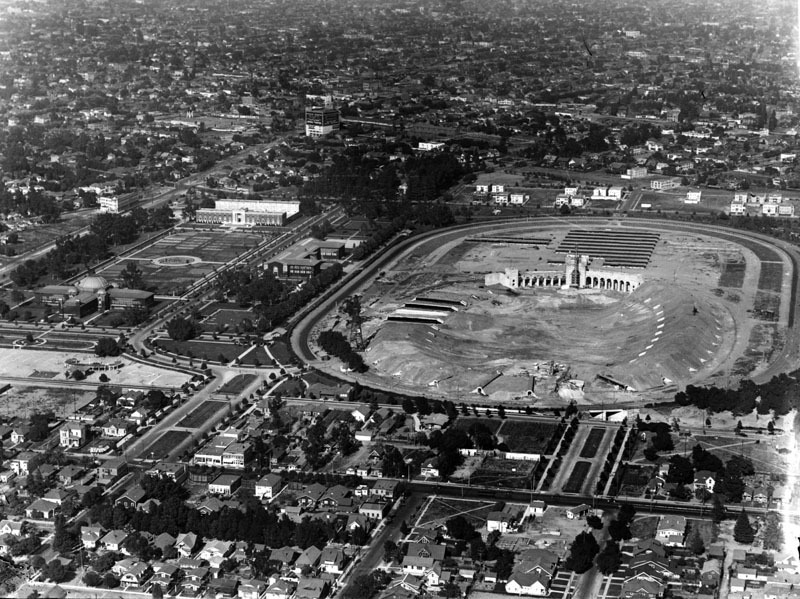 Windsor Square is often mistakenly called "Hancock Park," even by long-time residents. 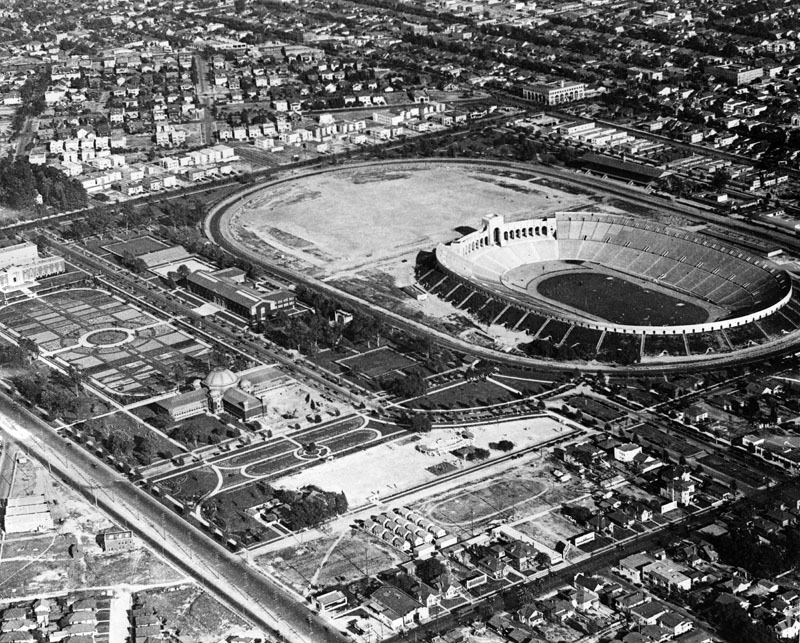 But in fact, Hancock Park is the neighborhood immediately to the west. 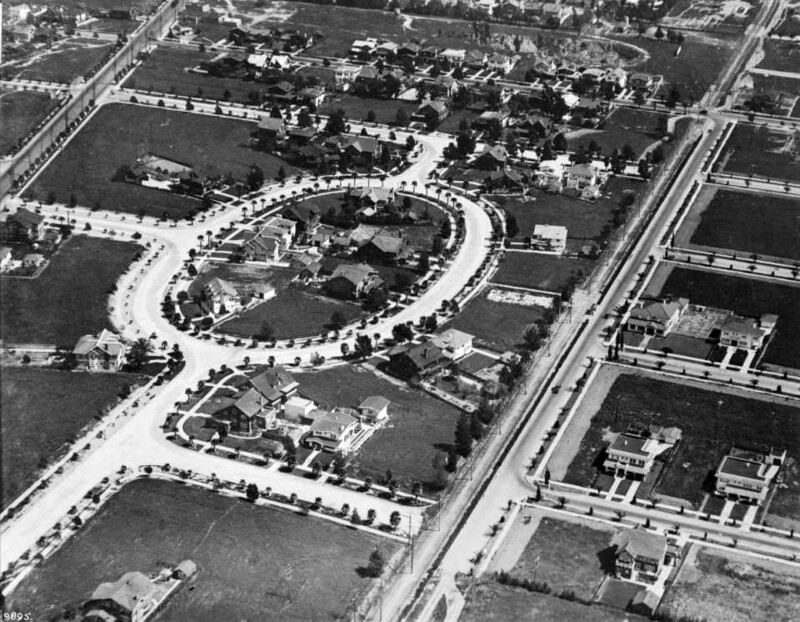 Windsor Square's homes have the same historic value as in Hancock Park, but most of the homes are built on bigger lots. (ca. 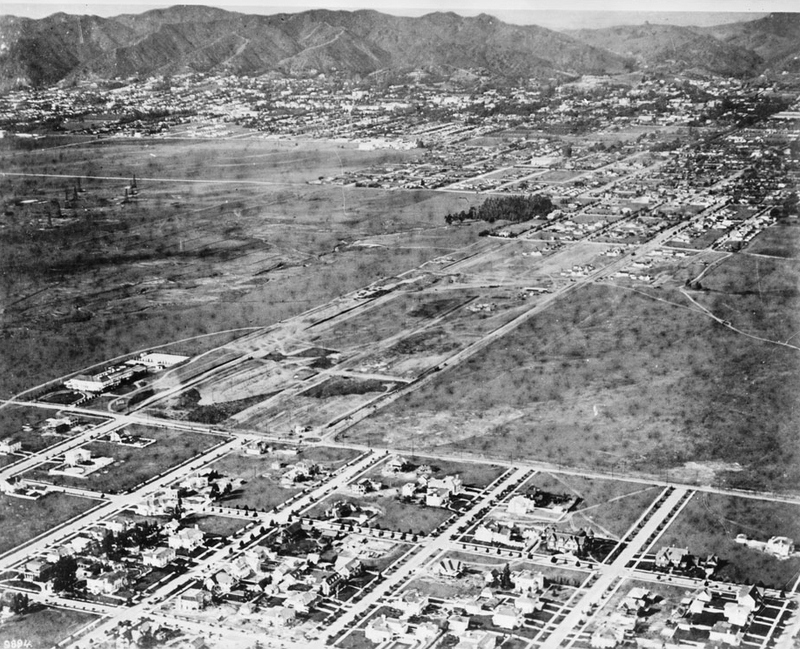 1918)^^ - Aerial view looking northwest from 5th Street and Windsor Boulevard at Hancock Park and Hollywood. 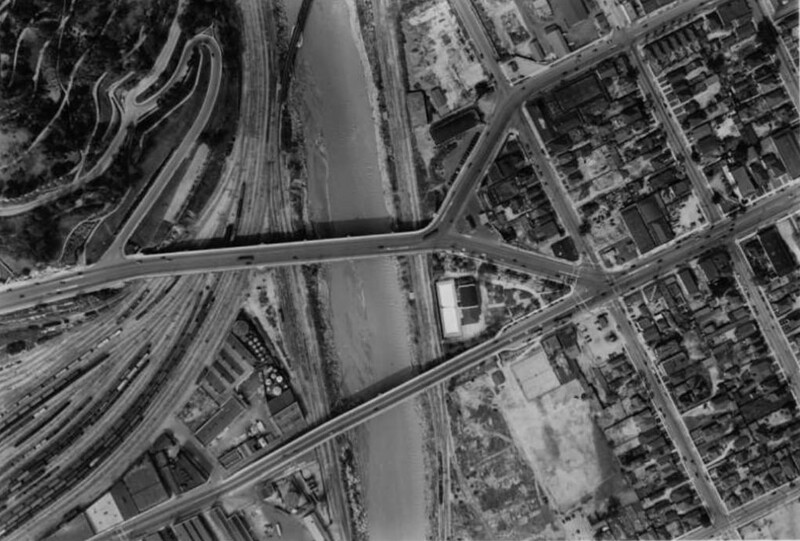 Third Street is visible running horizontally near the middle of the image, while at left is Marlborough School on Rossmore Avenue. The area north of Third Street on both sides of Rossmore is open fields for several blocks, and beyond the city in the background are large mountains. (ca. 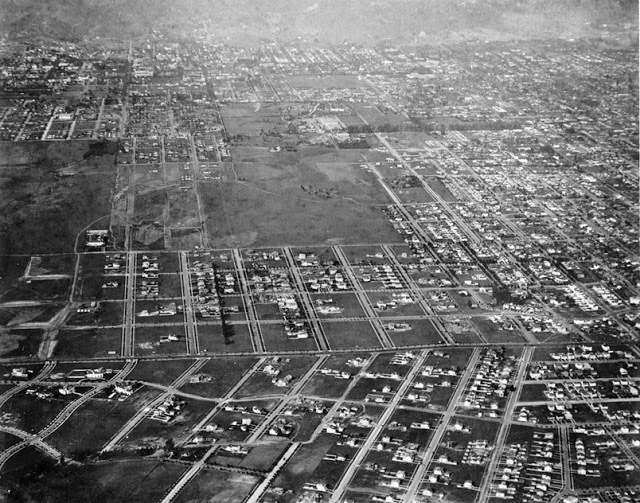 1918)^ - Aerial view looking northwest from Wilshire and Rossmore. 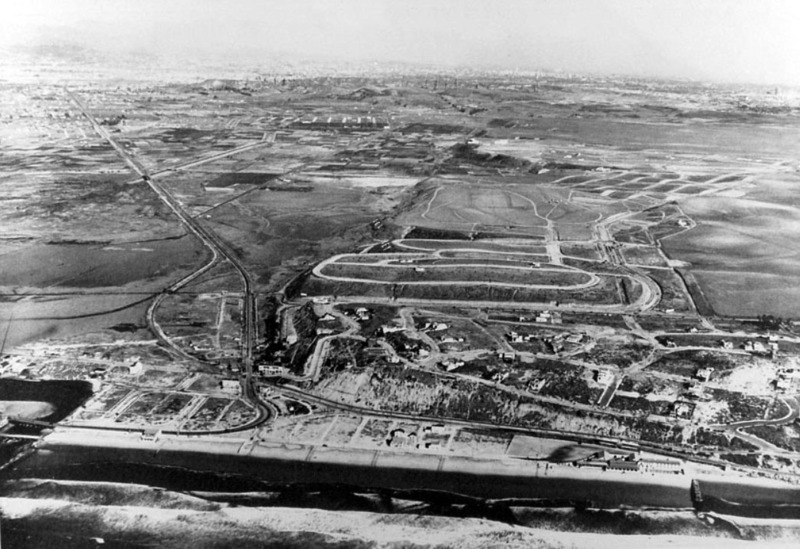 Today, the Wilshire Country Club is situated just to the right (east) of the oil fields. 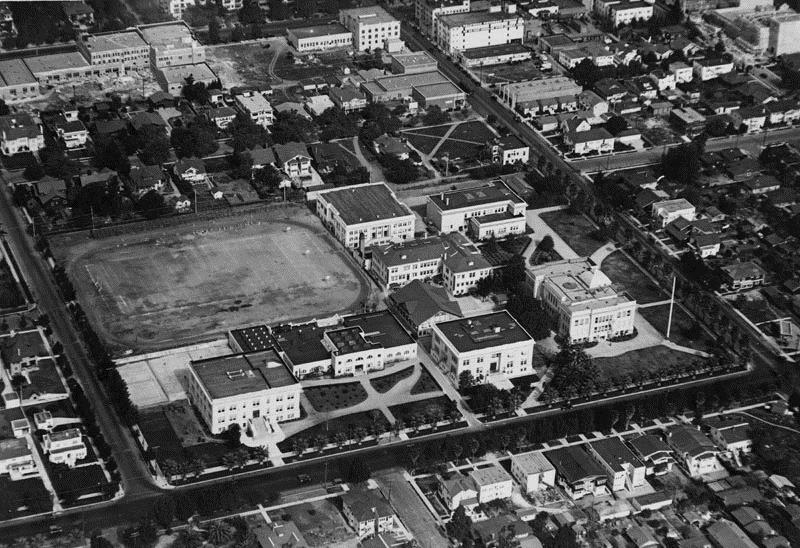 (1921)^ - Aerial view of Hollywood High School and surrounding area in 1921. (ca. 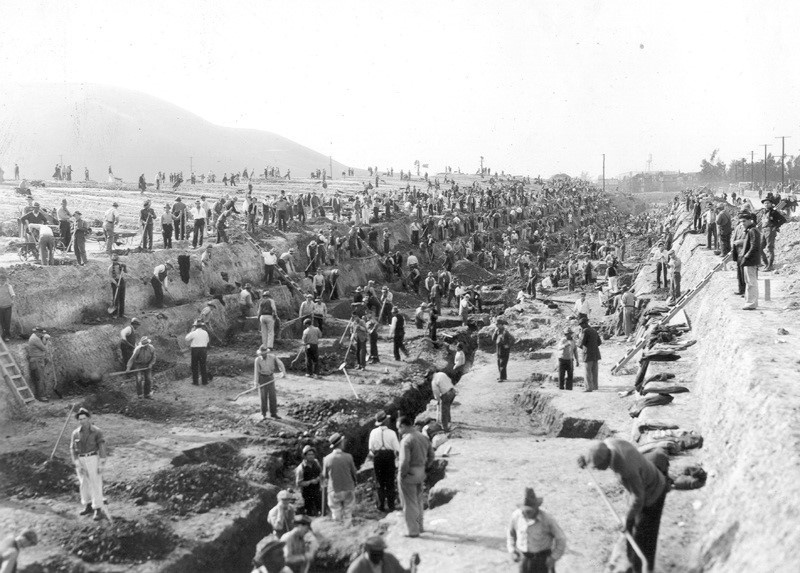 1920)^^ – View showing workers repairing the track at the bottom of its steep embankment. 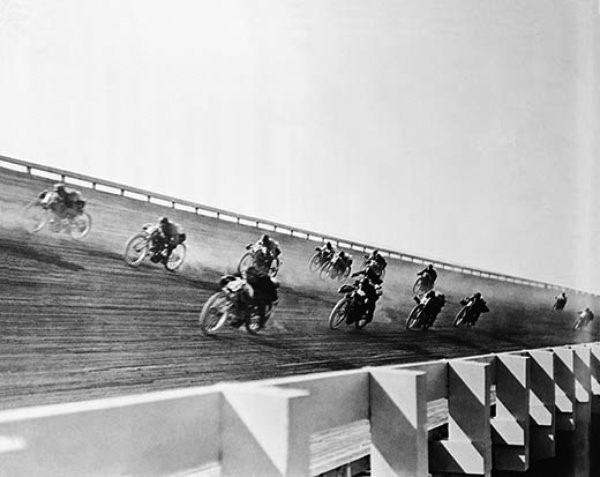 (1920s)#+# - View showing motorcycle racers rounding the embanked curve a the speedway. 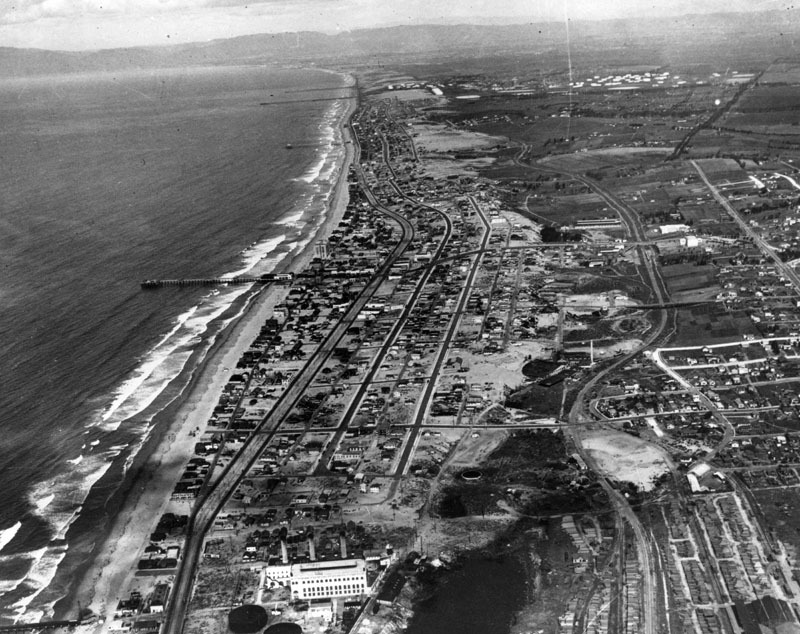 (1921)^**^ - Aerial view looking east on Wilshire Boulevard from where Santa Monica Boulevard intersects. 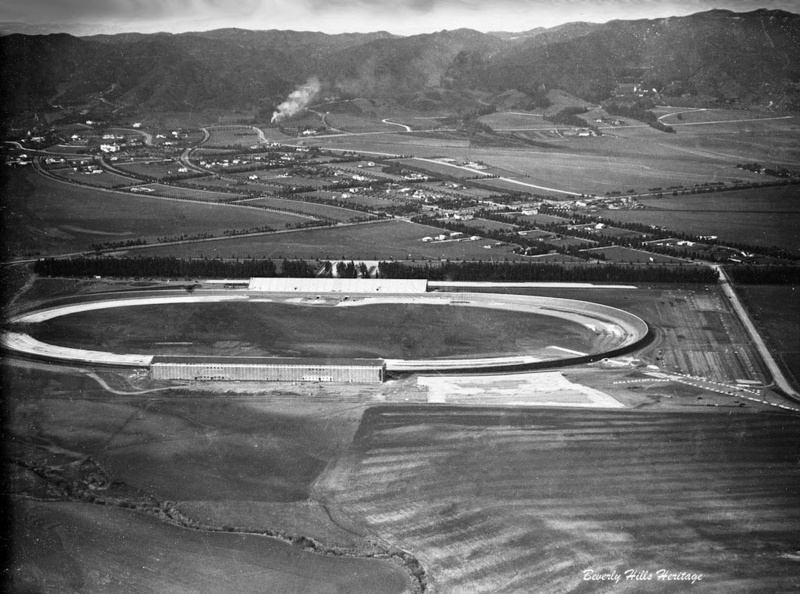 Vast open fields can be seen between the Beverly Hills Speedway and the City of Los Angeles. 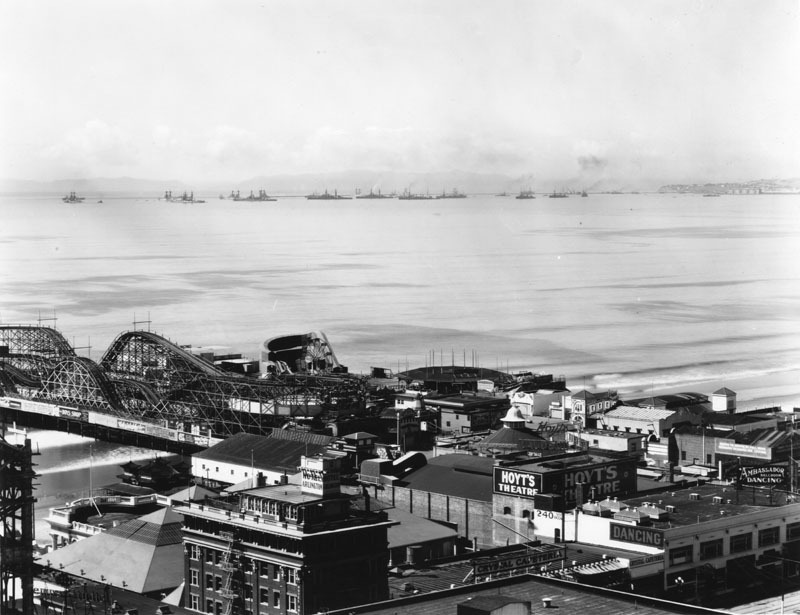 (1919)*^#^ – View looking northeast from the roof of the Million Dollar Theatre Building (3rd & Broadway). 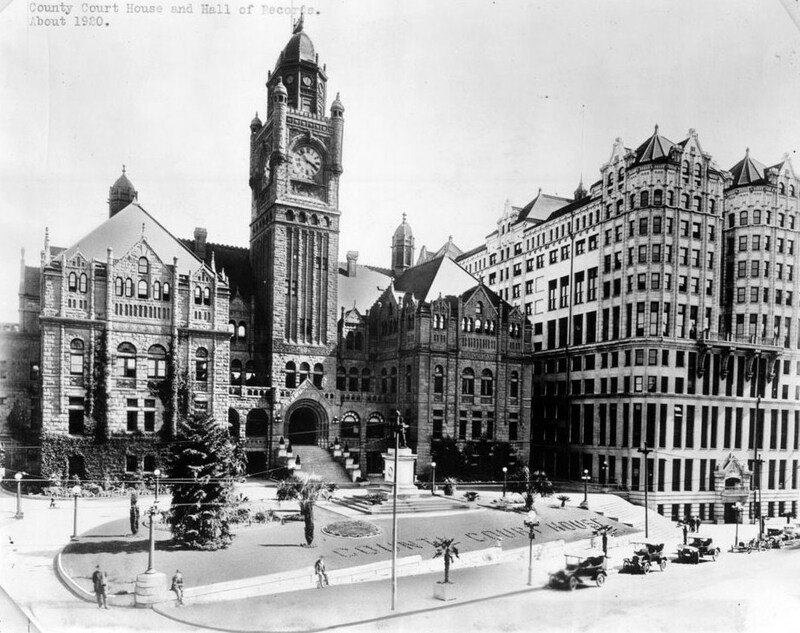 City Hall (226 S. Broadway) can be seen at center-left. 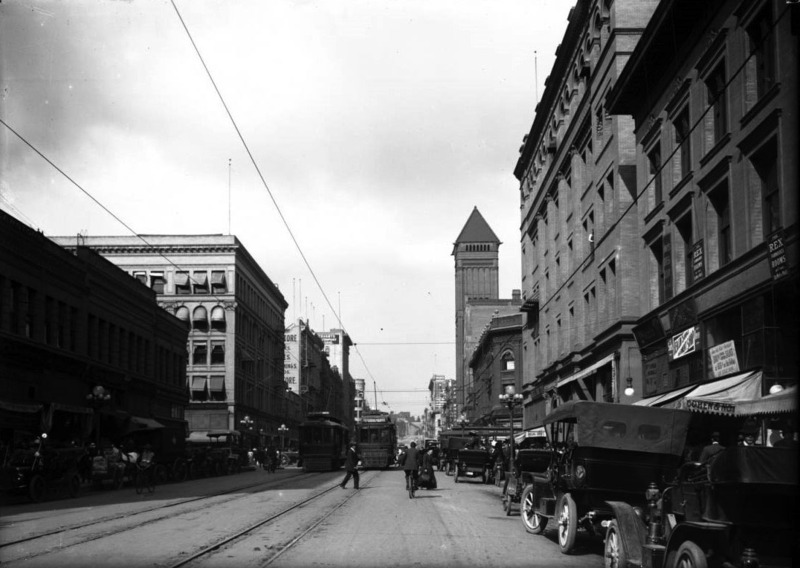 The Orpheum Theatre (227 S. Spring), with its unique coned-shaped tower, is at right-center. 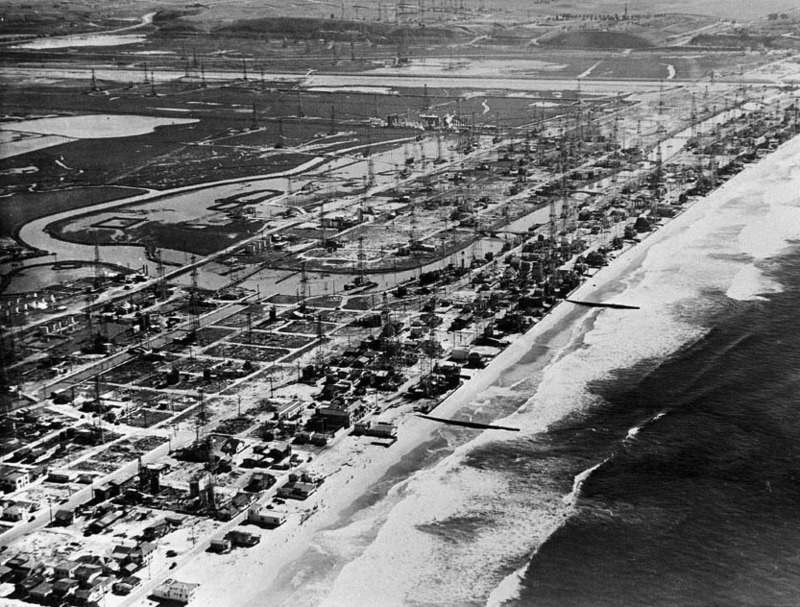 The above photo was taken by G. Haven Bishop for Southern California Edison. 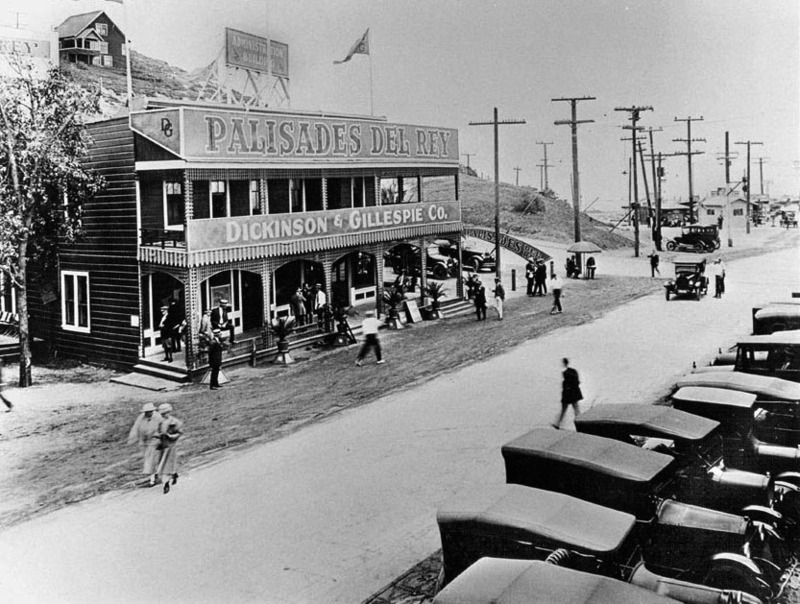 They were the tenants of the building housing the Million Dollar Theatre – then known as the Edison Building. 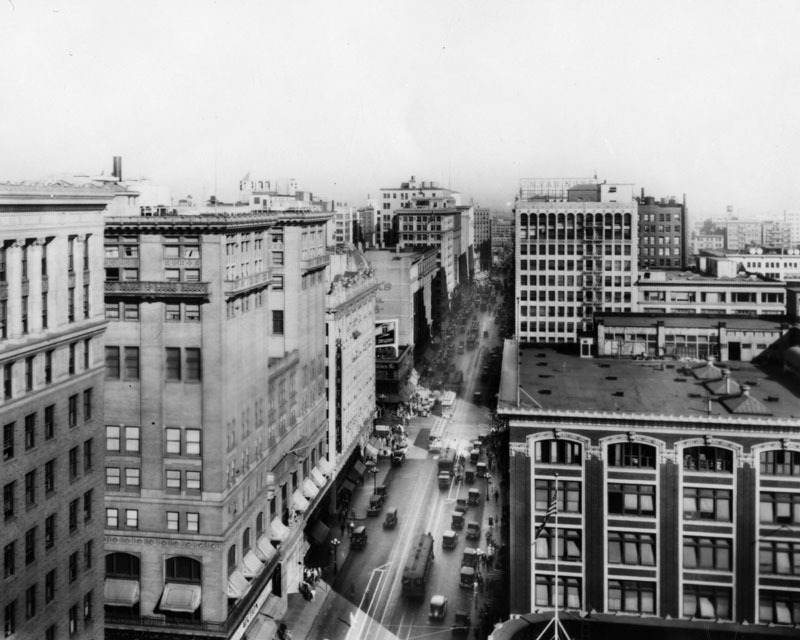 (1919)^ - View looking north on Main Street from the top of the Westminster Hotel (NE corner of Main and 4th streets). The tower of St. Vibiana's Cathedral (built in 1876) stands tall at upper-right. Streetcars can be seen running down the center of Main Street. (1919)^ - This is the site of the former Los Angeles State Normal School, and future site of Central Library of the Los Angeles Public Library. The area has been dug out for the foundation and work will soon be under way. 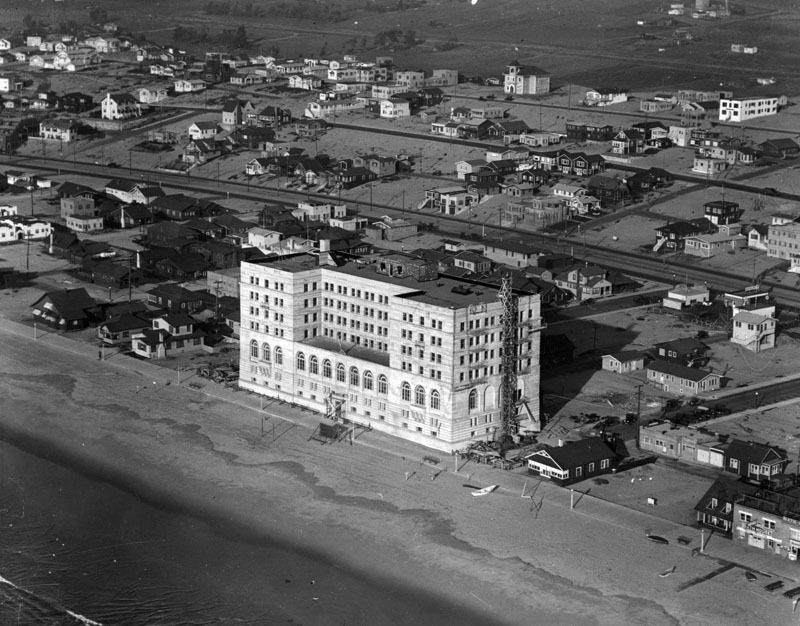 The dark building in the background is the Biltmore Hotel, the large white building on the right is the Pacific Mutual Building. 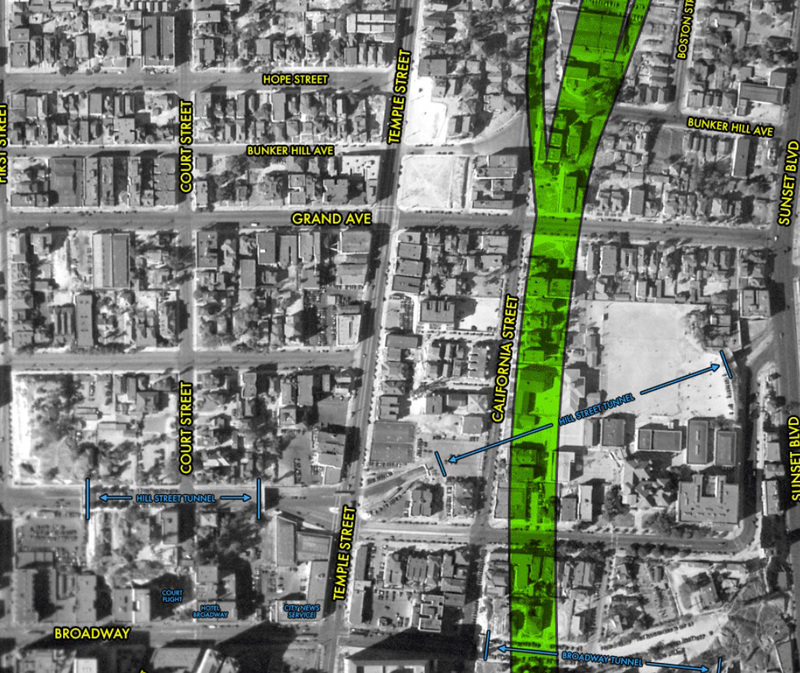 The visible streets are 5th and Grand Avenue. 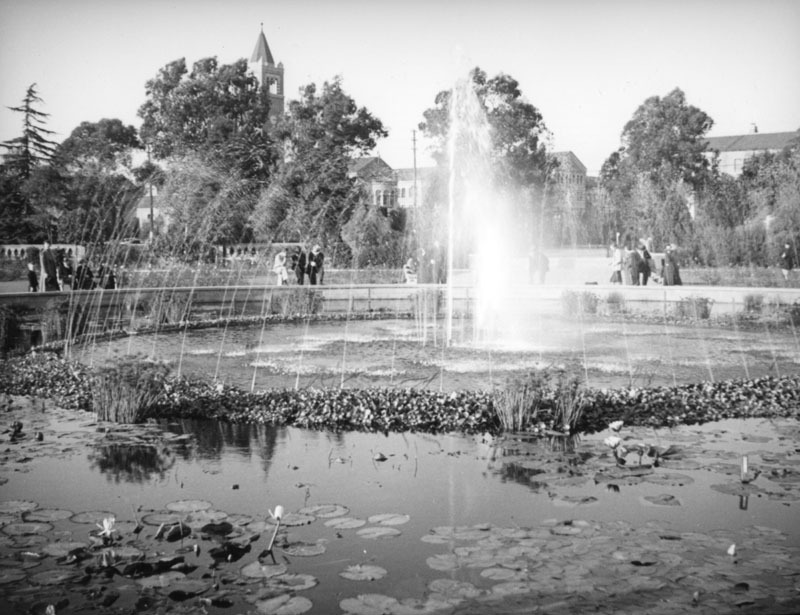 The California State Normal School was a teaching college that was founded on May 2, 1862 in San Jose. 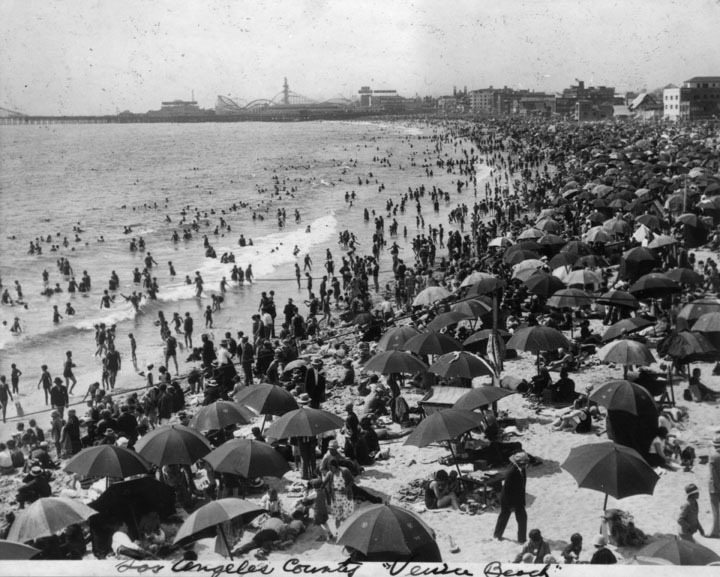 In March 1881, after heavy lobbying by Los Angeles residents, the California State Legislature authorized the creation of a southern branch of the school to be built in downtown Los Angeles, which would train teachers for the growing population of Southern California. 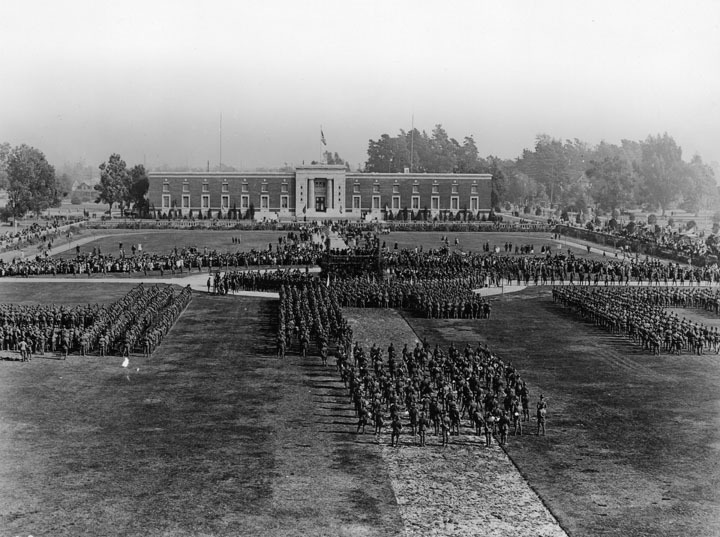 On August 29, 1882, the State Normal School at Los Angeles opened its doors, and in 1919 it became part of the "UC system" after moving to a larger campus on Vermont Ave., in Hollywood (the present site of L.A. City College). 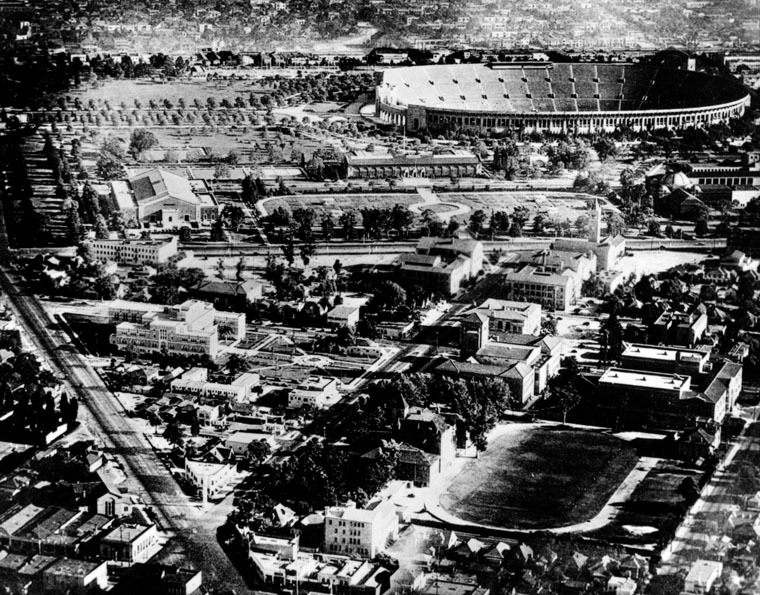 The University of California, Southern Branch would eventually come to be known as the University of California, Los Angeles. (ca. 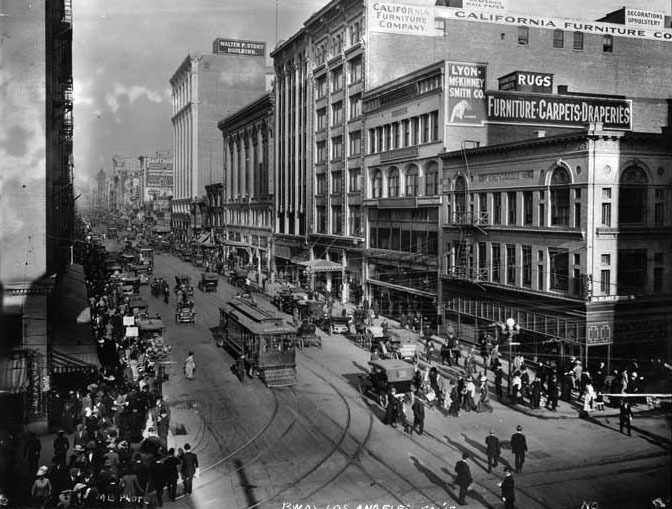 1918)^*# – Elevated view looking north on Broadway from 7th Street showing streetcars, automobiles, horse-drawn carriages and pedestrians; multi-story buildings include from distant left to right, Pantages Building at 536 South Broadway, Walter P. Story Building at 610 South Broadway, California Furniture Company at 644-646 South Broadway, and the Bullock's Building at Broadway and Seventh (NW corner) at extreme left. 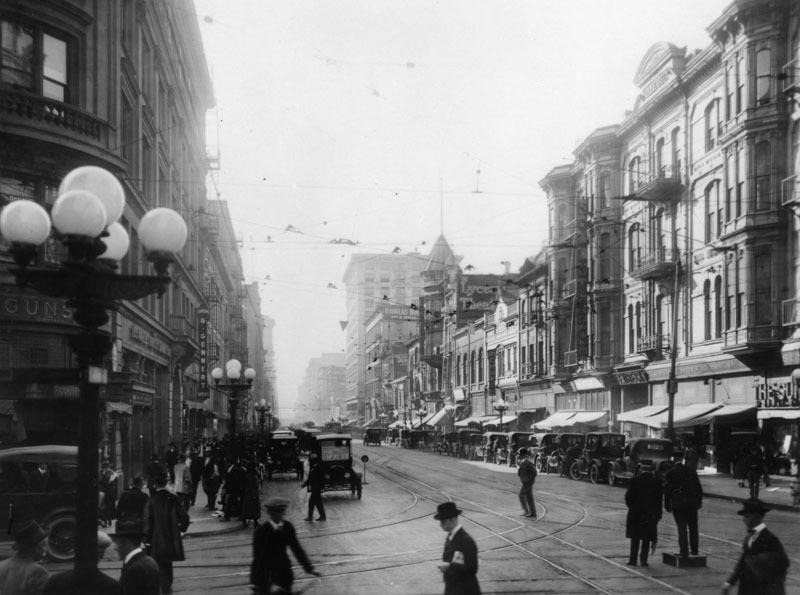 (1910s)#++ - View looking north on Broadway from Sixth Street. 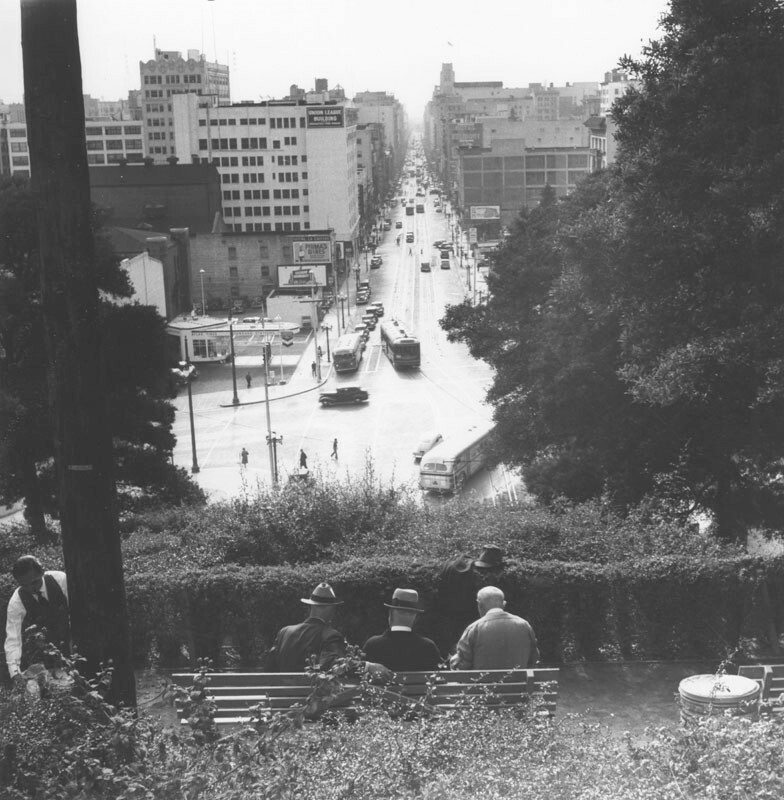 In the distance is the Broadway Central Building, which was the 400 block of South Broadway. 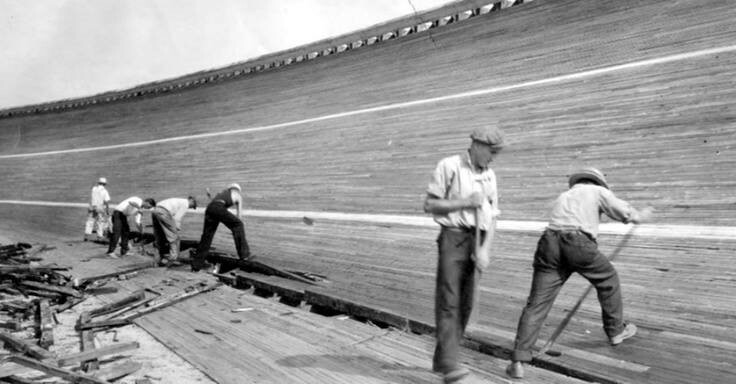 It was constructed around 1906. (ca. 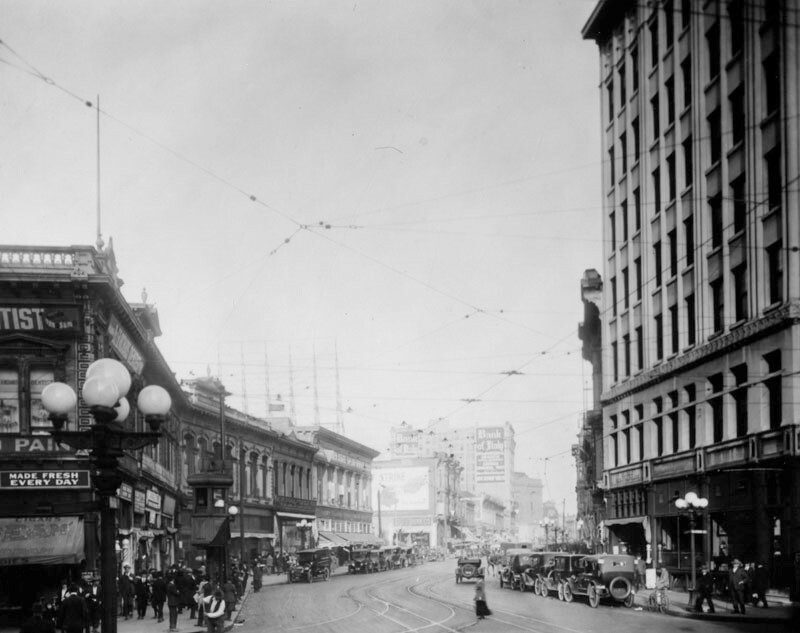 1918)^^ - View looking north on Broadway from below Third Street. 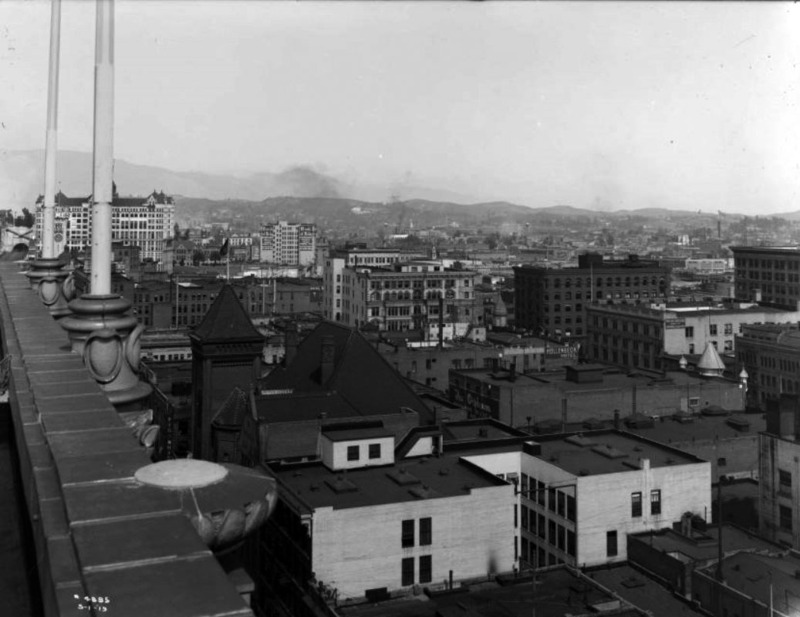 The Bradbury Building is at right and the City Hall tower is visible near center. (ca. 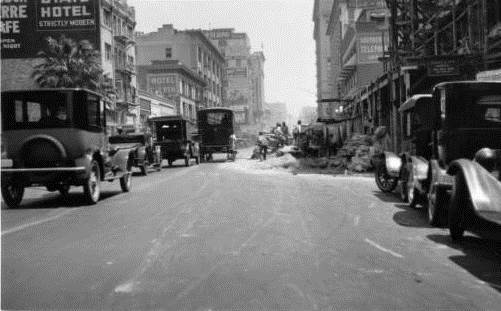 1918)^^ - View looking east on Fourth Street at Broadway showing a busy intersection with many pedestrians crossing the street. 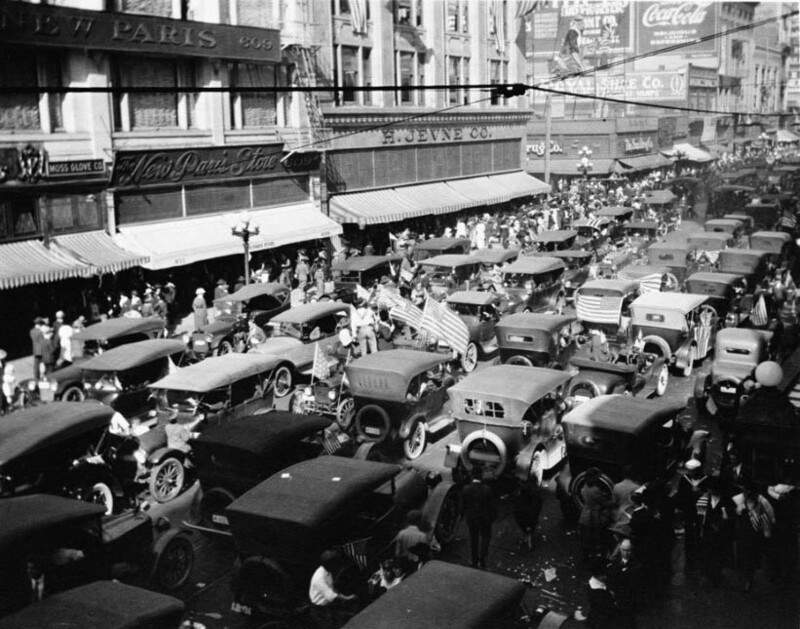 (1918)^^ - Cars jammed on Broadway and 6th Street in a peace celebration of the war's end, November 11, 1918. 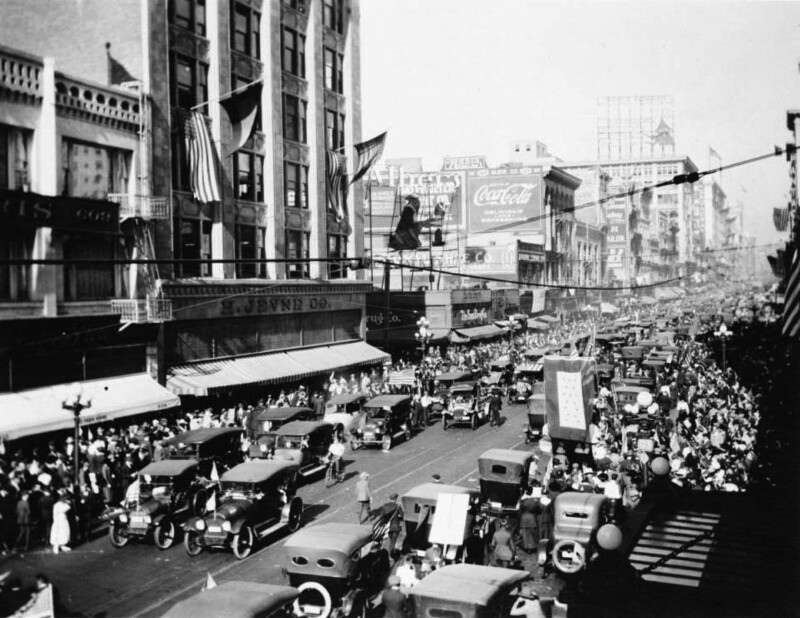 (1918)^^ – Armistice Day celebration and traffic jam, 6th and Broadway in downtown L. A., November 11, 1918. (ca. 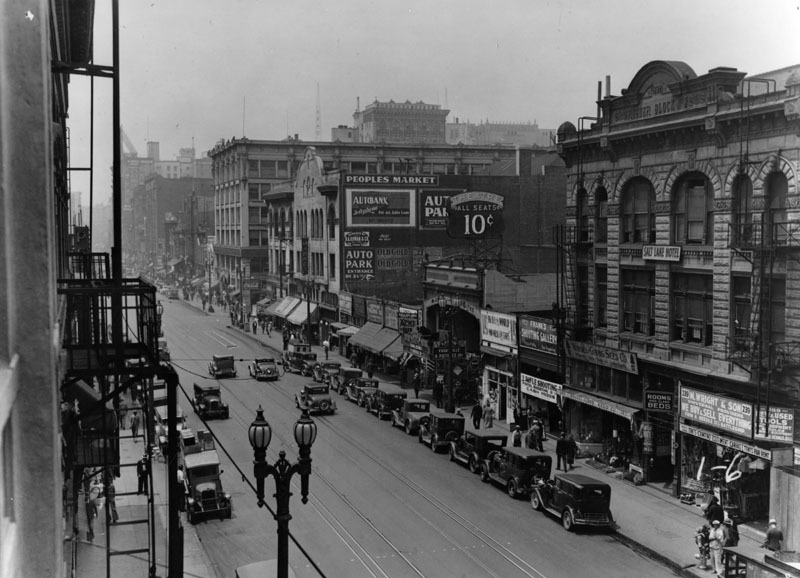 1920s)^ - A busy scene with pedestrians and city traffic in this view of Broadway and 5th looking north, showing the many retail stores that line the street. 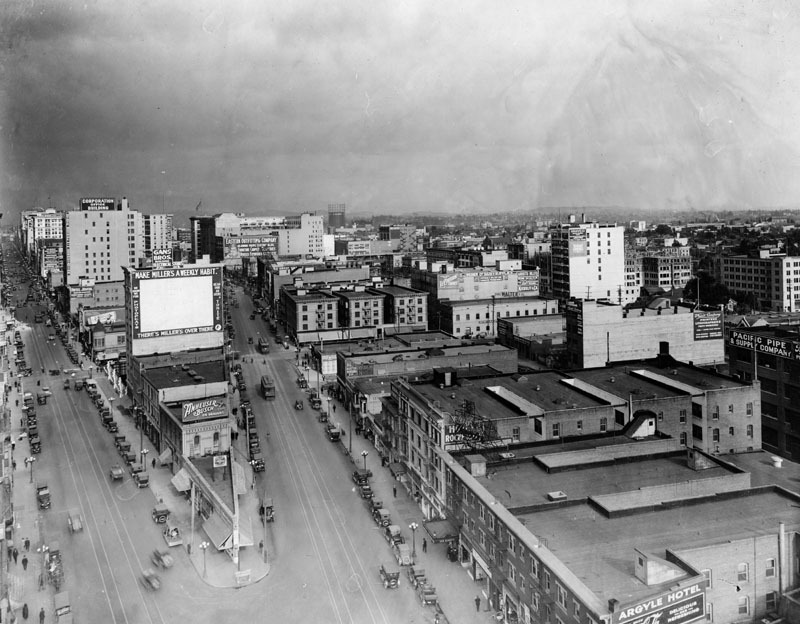 Hotel California, The Broadway, Edison building and California building are visible on the left side. 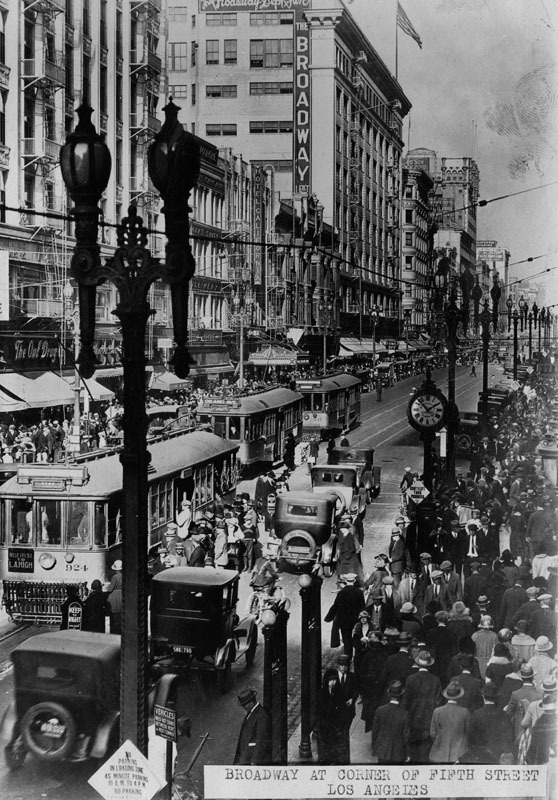 Several trolleys have stopped in the middle of the road, cars line both sides of the street, and an overflow of pedestrians fill the sidewalks as far as the eye can see. 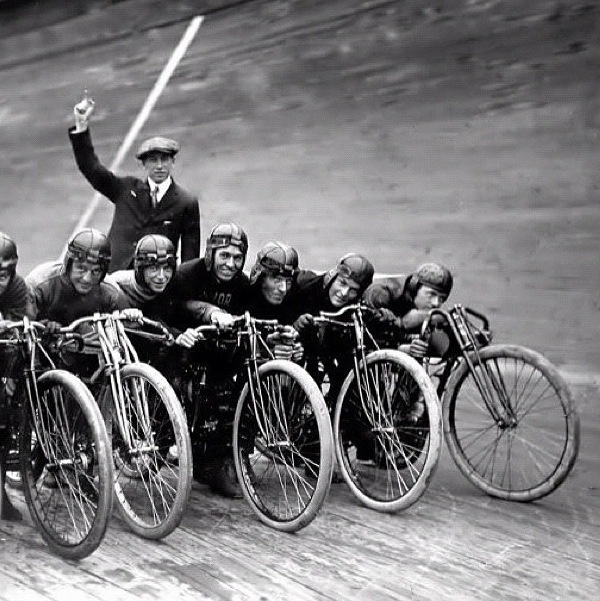 Notice everyone wears hats - men, woman and children alike. (ca. 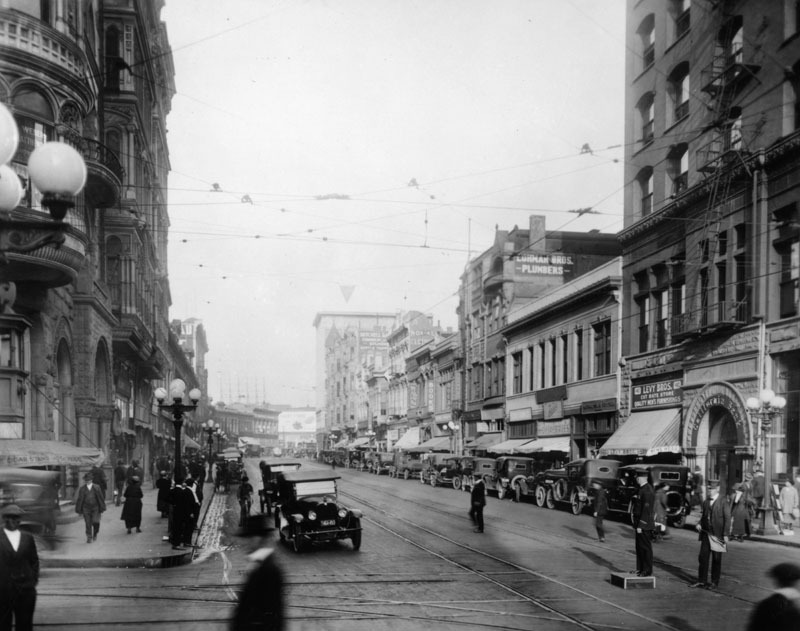 1920)^ - A view looking south on Broadway near 2nd St. On the near left corner (southeast) is Coast Drugs. 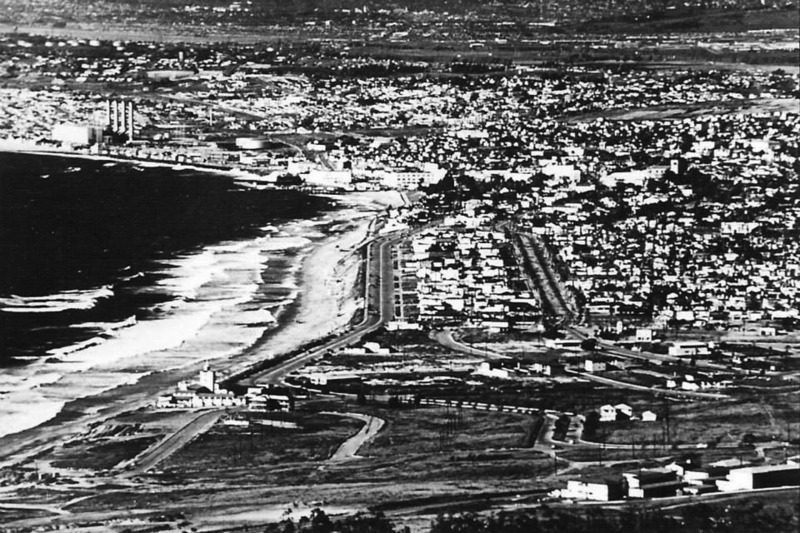 On the far right corner (northwest) is The Owl Drug Co. City Hall can be seen in the background. 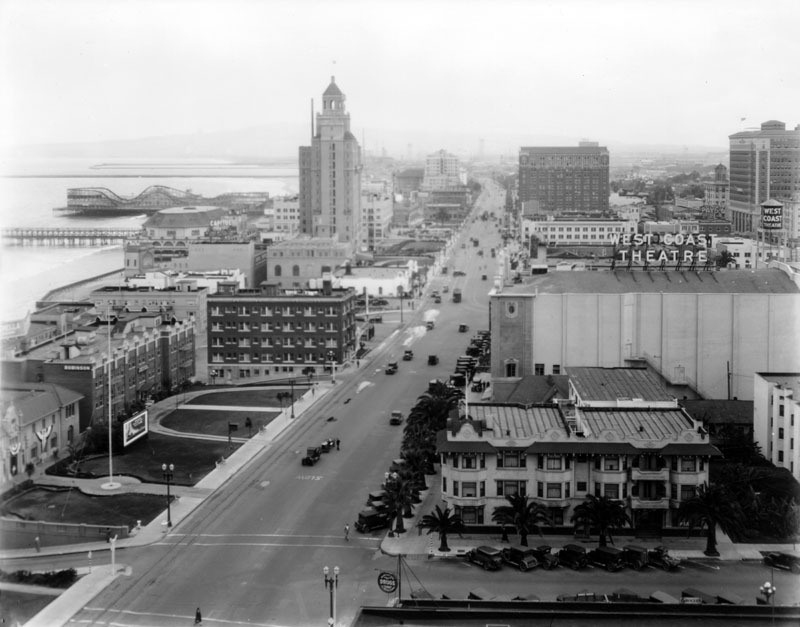 (1920)^ - Broadway and 1st Streets are seen from the southwest corner. 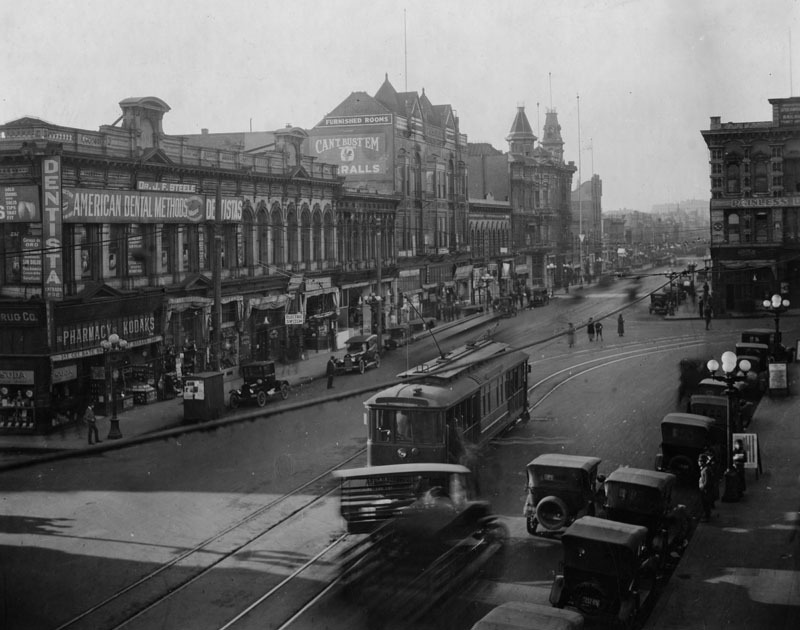 A policeman stands on a box in the middle of the intersection to direct any traffic, including streetcars and cars. 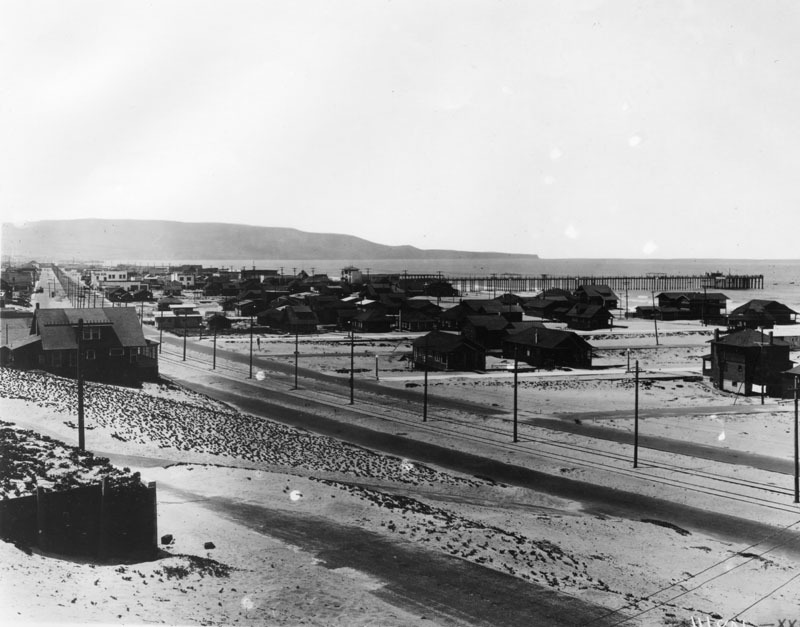 (1920)^ – View showing cars parked in front of a row of houses on the west side of Broadway, north of Temple Street. 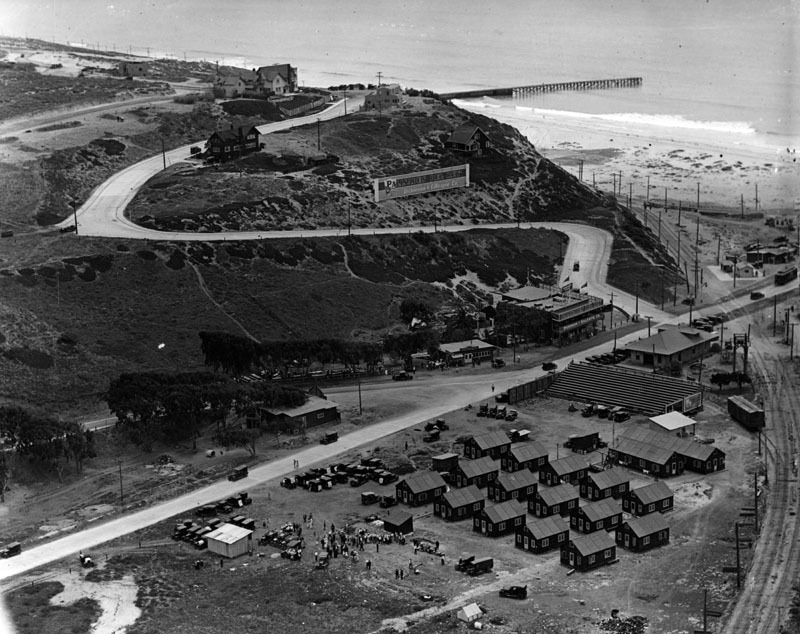 Also shown is the Little Broadway Market and the Hotel Alhambra and Apartments Annex. The main Hotel Alhambra is located across the street on the east side of Broadway. 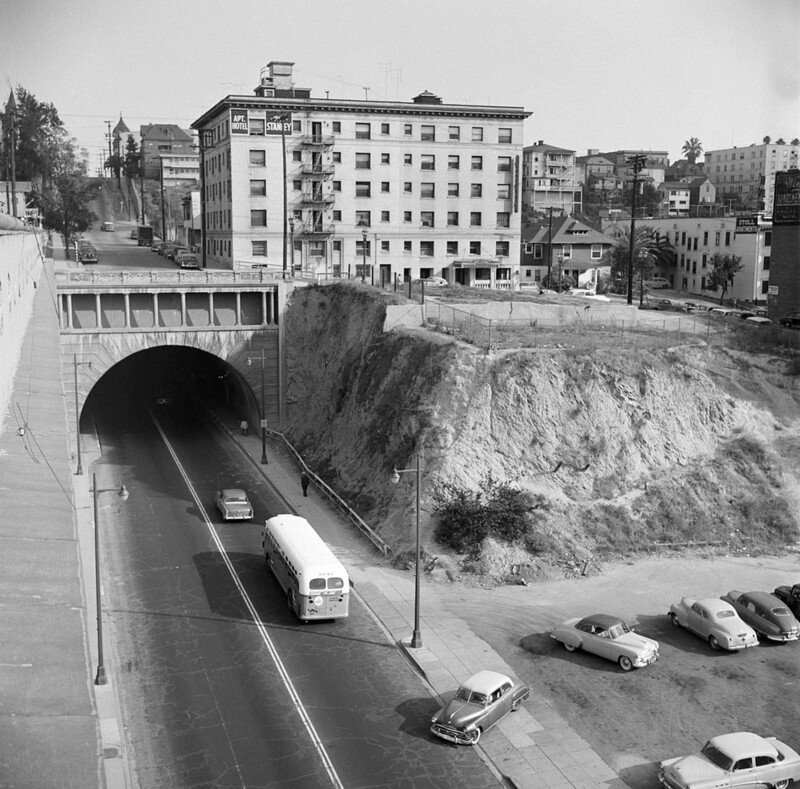 The Broadway Tunnel is just north of the Alhambra Hotel (out of view). 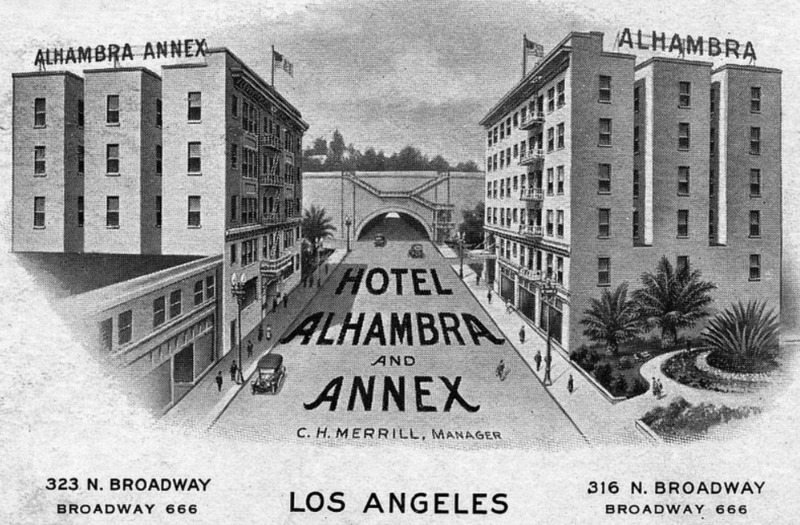 (1920s)^#^ – Business card for the Hotel Alhambra and Annex showing the south portal of the Broadway Tunnel with both hotel and annex sitting on opposite sides of Broadway. (ca. 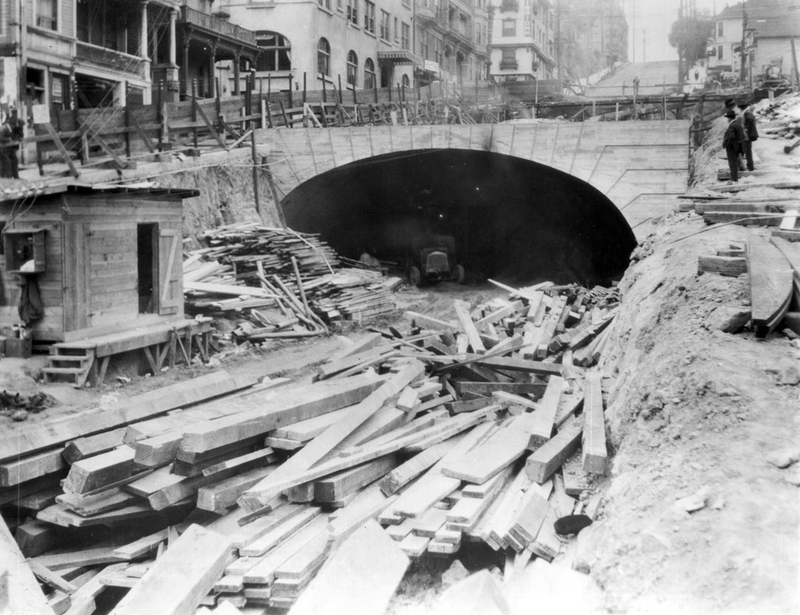 1920)^*# – View looking south on Broadway from the top of the Broadway Tunnel toward Temple Street. 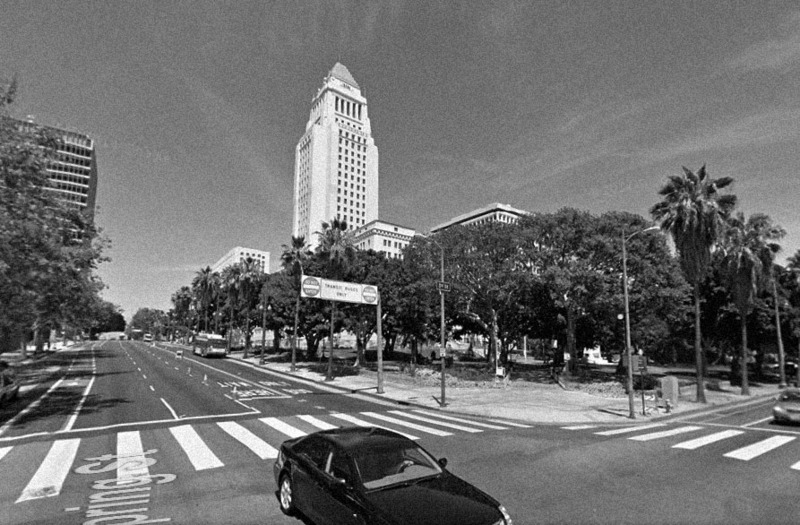 The LA County Courthouse, Hall of Records, LA Times Building, and City Hall can all be seen in the background on the east side Broadway. 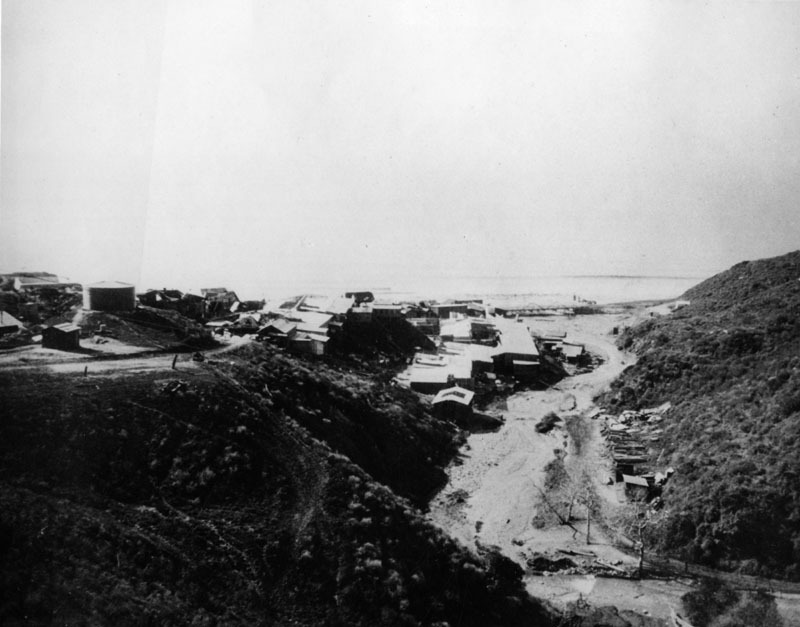 The Alhambra Hotel stands on the left at its original location prior to being relocated closer to the tunnel. 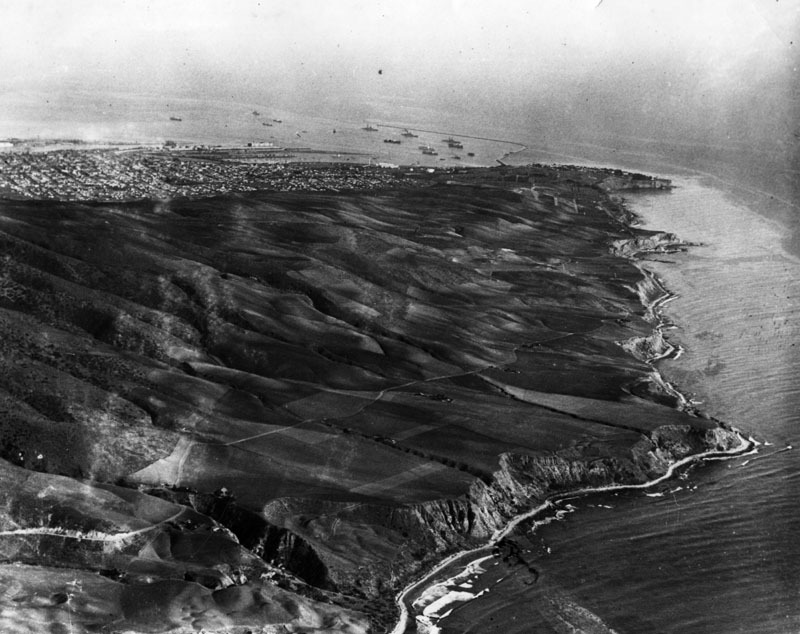 The hillside north of the Alhambra (lower-left) will soon be chiseled away and cleared to make room for the move. To the right stands the Hotel Alhambra & Apartments Annex. Note the interesting looking streetlight on the power pole to the right. 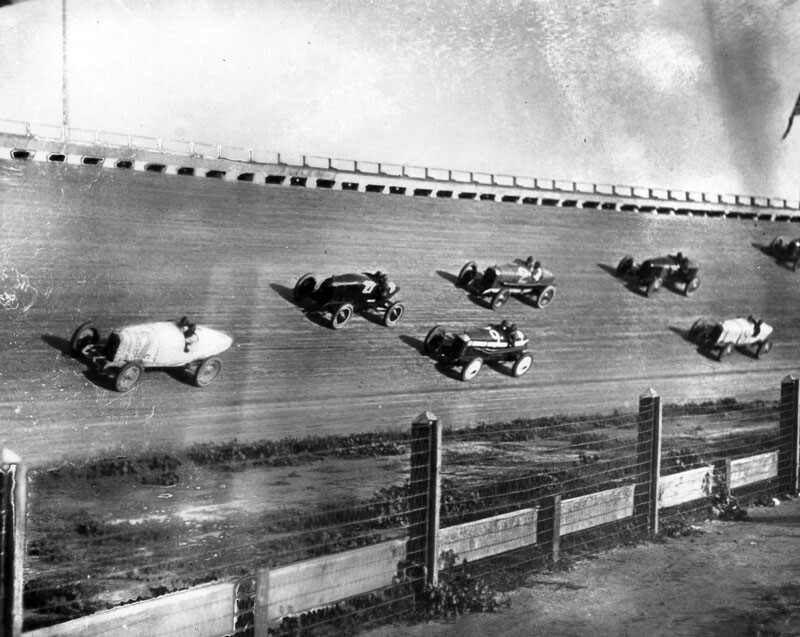 Click HERE to see more in Early LA Streetlights. 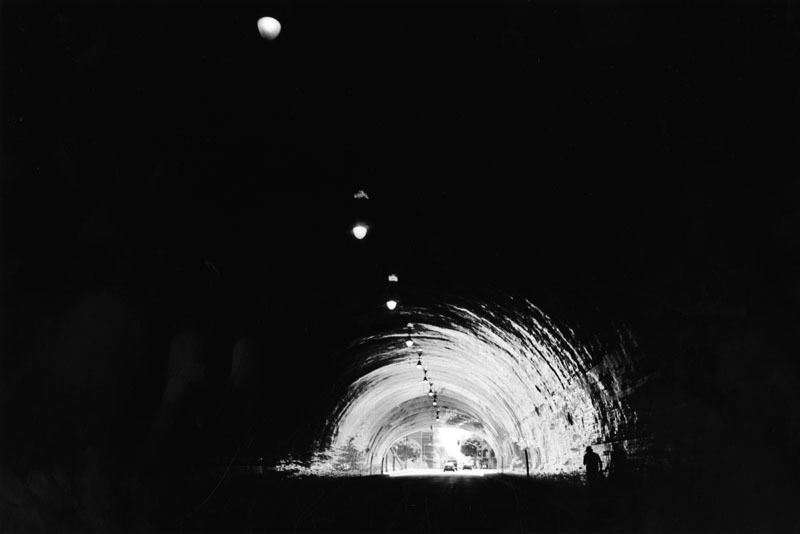 (1924)^^ - View looking south on Broadway from the top of the Broadway Tunnel on Fort Moore Hill. 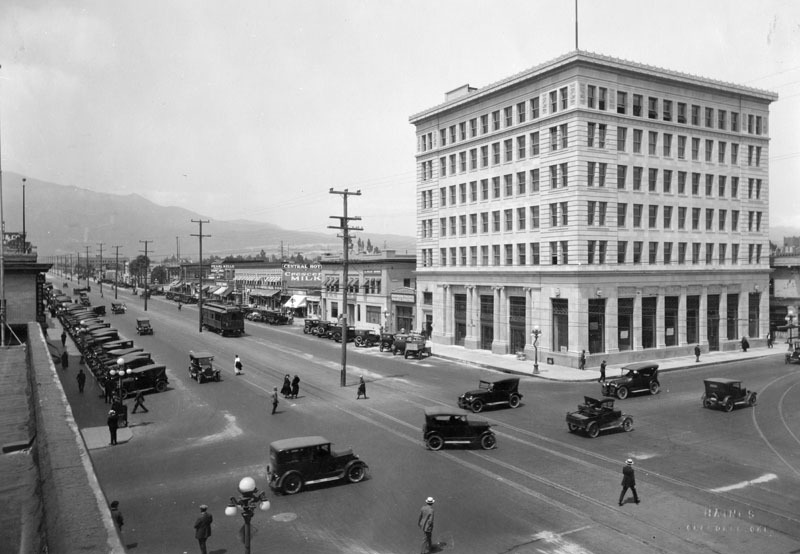 The LA County Courthouse can be seen in the distance on the southeast corner of Broadway and Temple Street. 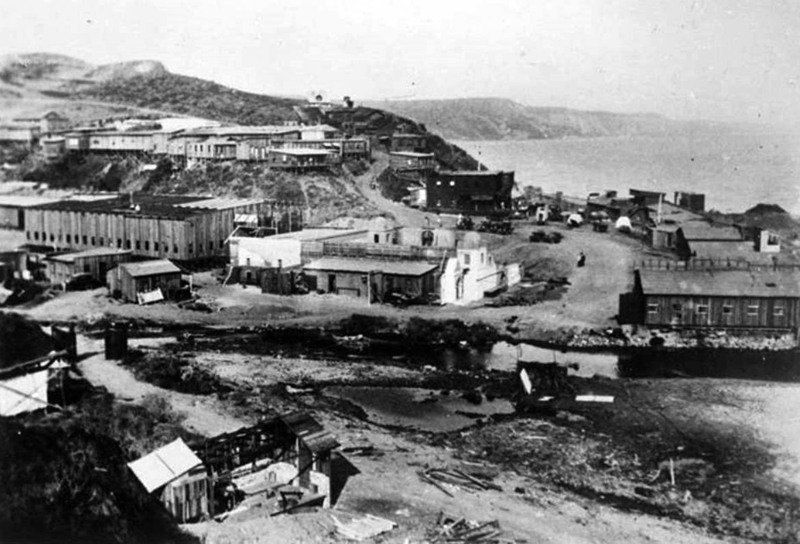 The large building at center is the Alhambra Hotel, just before it was moved one lot to the north to make room for the Hall of Justice. 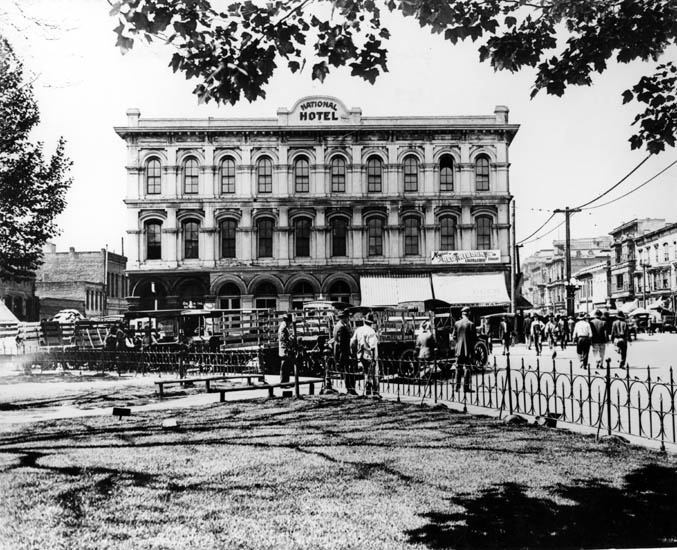 The six-story hotel rests on a series of metal girders and, in the foreground, workers can be seen near where the hotel will finally rest. 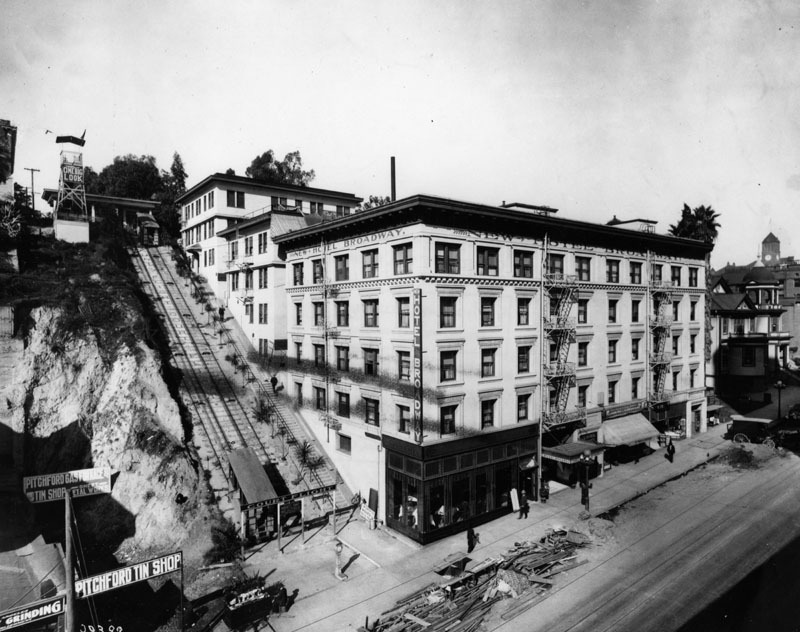 The Alhambra Hotel Annex is situated across the street on the west side of Broadway (out of view). 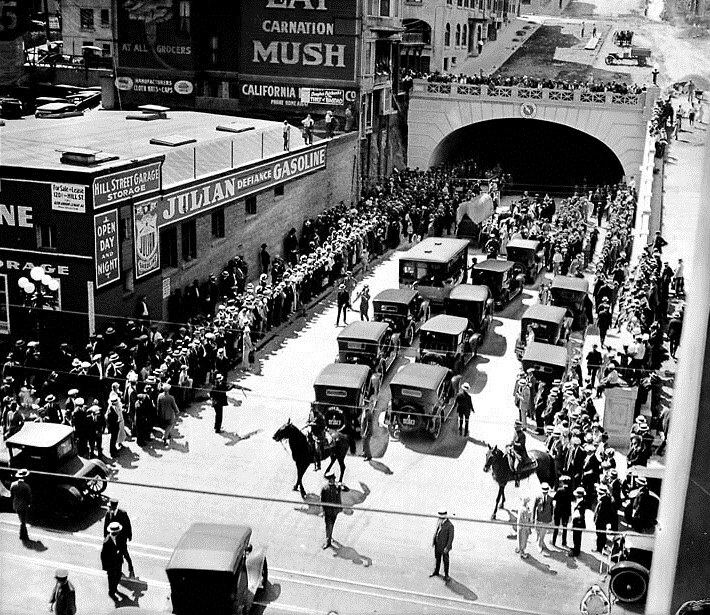 In 1924 the Alhambra Hotel was moved north up Broadway 122 feet towards the face of the Broadway Tunnel to make room for the Hall of Justice. 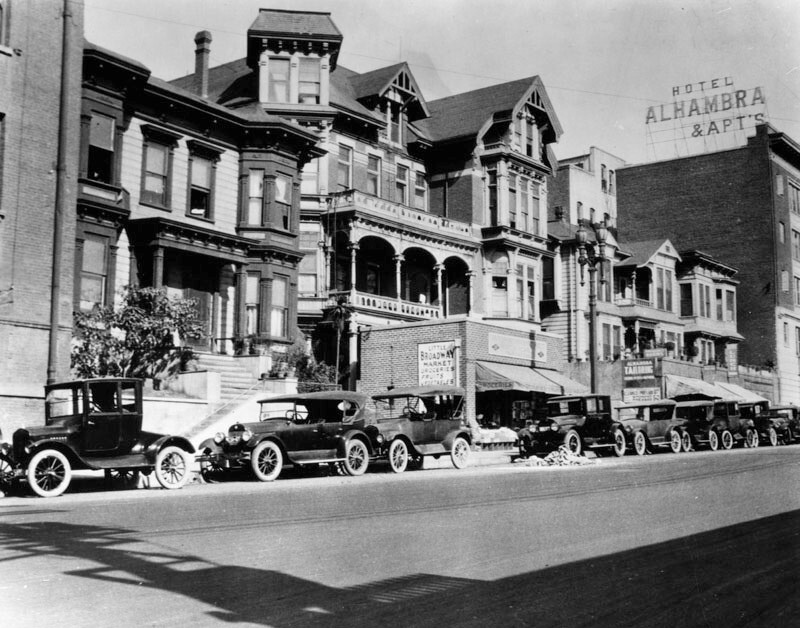 The Kress House Moving Company was awarded a $63,770 contract to move the massive Alhambra Hotel. 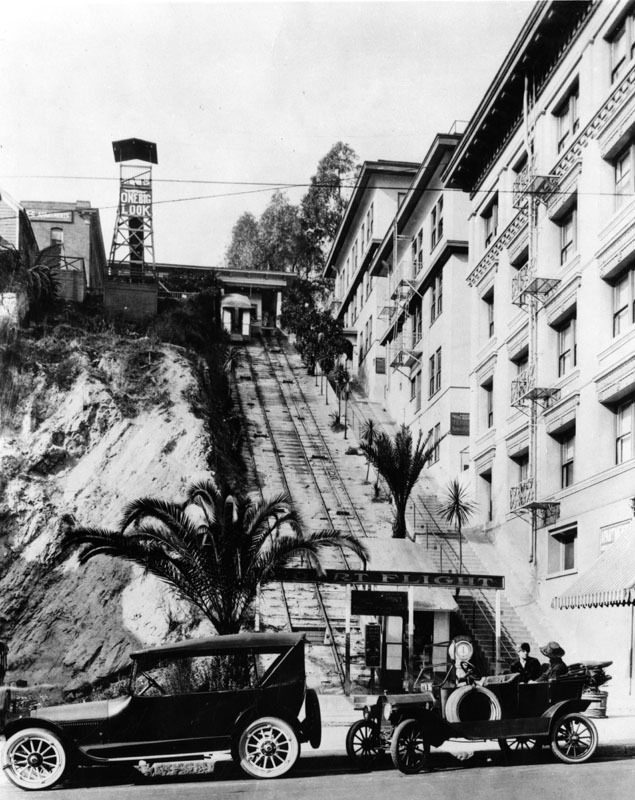 Dozens of parallel train tracks were positioned to move the hotel closer to the tunnel. (ca. 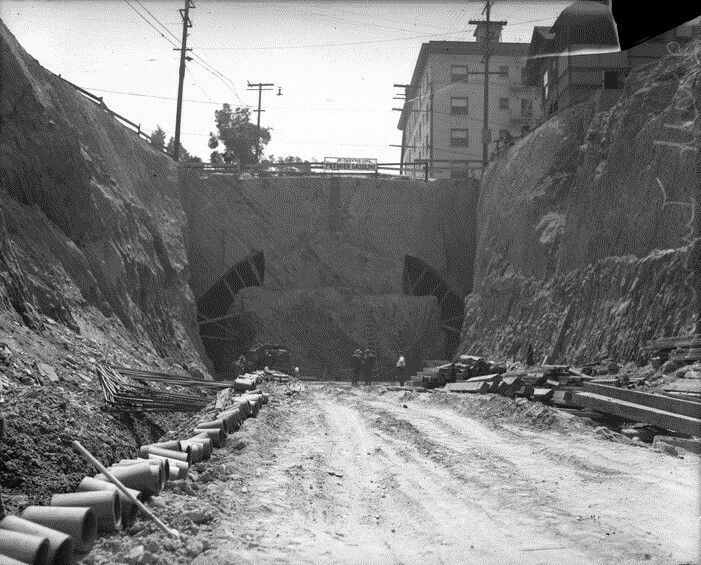 1925)^#^ – View showing the south portal of the Broadway Tunnel with the Hotel Alhambra (at new location) squeezed in between the tunnel and the newly constructed Hall of Justice (N/E corner of Broadway and Temple Street). (ca. 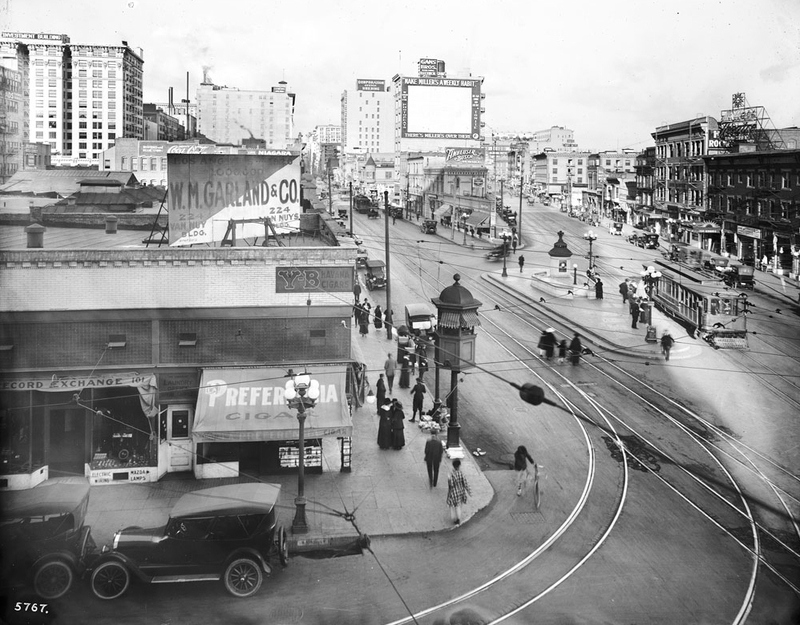 1920)^ – View looking north on Spring Street at First. Security Trust & Savings Bank on the right side of photo. 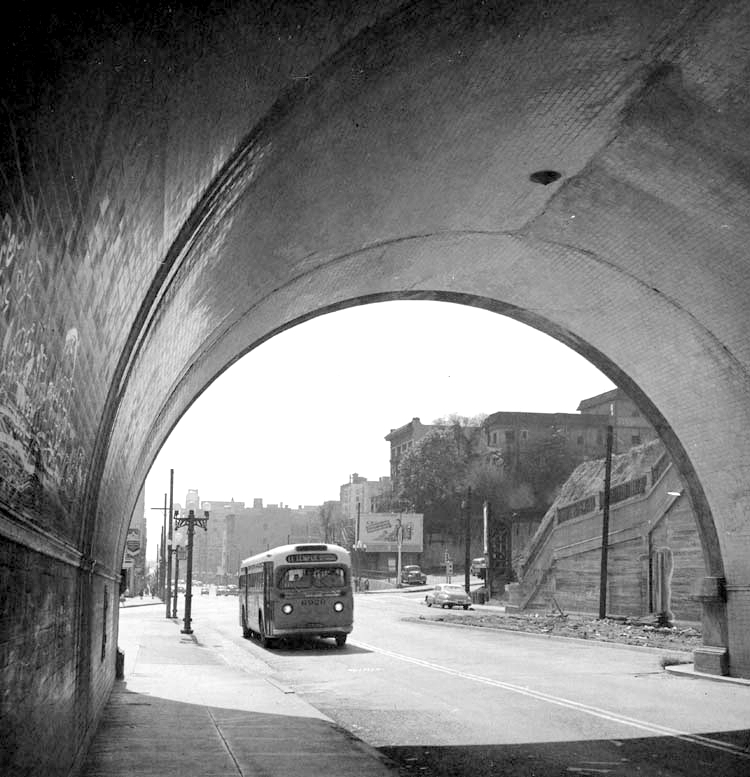 Spring Street does appear to curve in those days, which it no longer does. 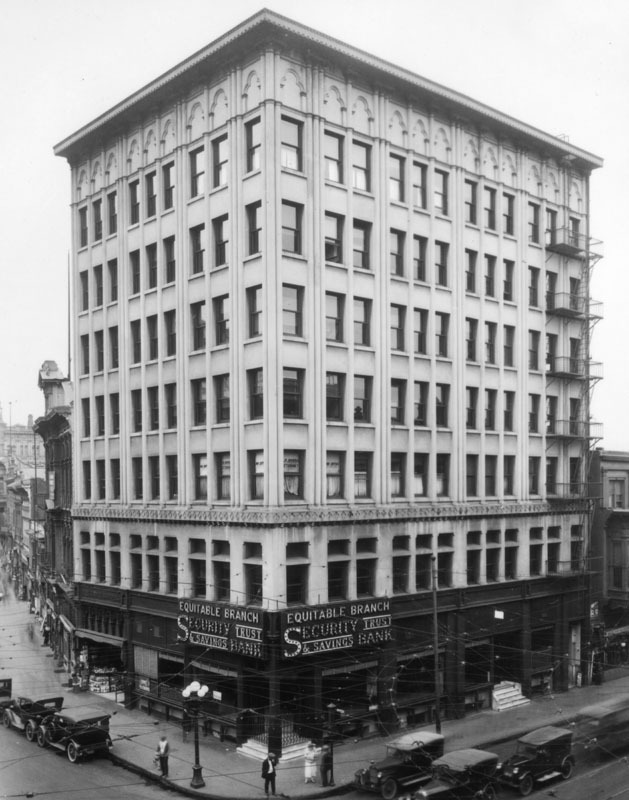 (1920)^ - Exterior view of the Security Trust and Savings Bank on the northeast corner of First and Spring Streets, in the 7-story Equitable Building. (2014)##^* – View looking at the northeast corner of Spring and First Streets where the Equitable Bank Building once stood, now a park next to City Hall. (ca. 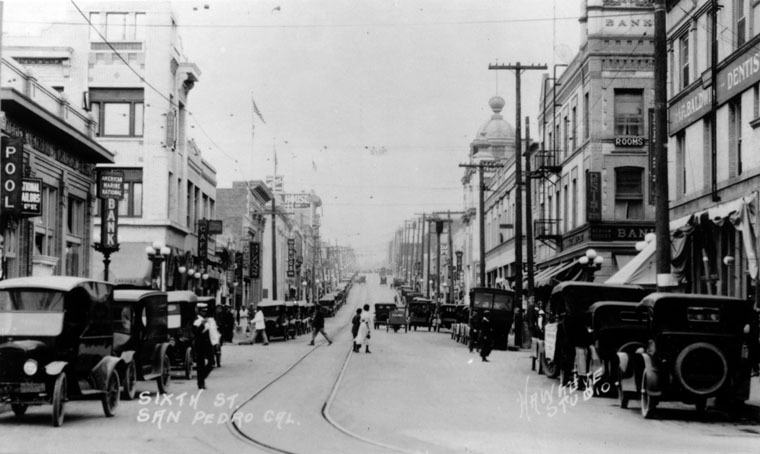 1920)^ - View of Spring Street looking north at 2nd Street. 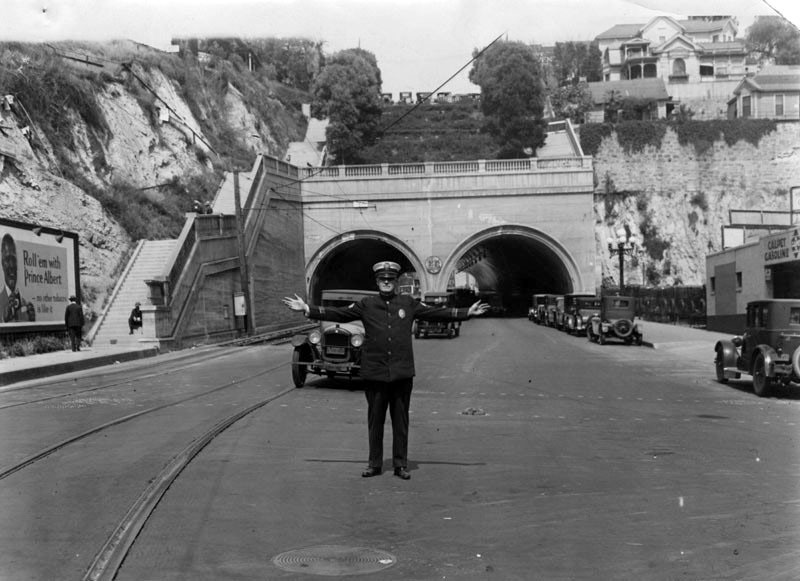 A traffic cop stands on a soap box and directs traffic between Second and Spring Street. 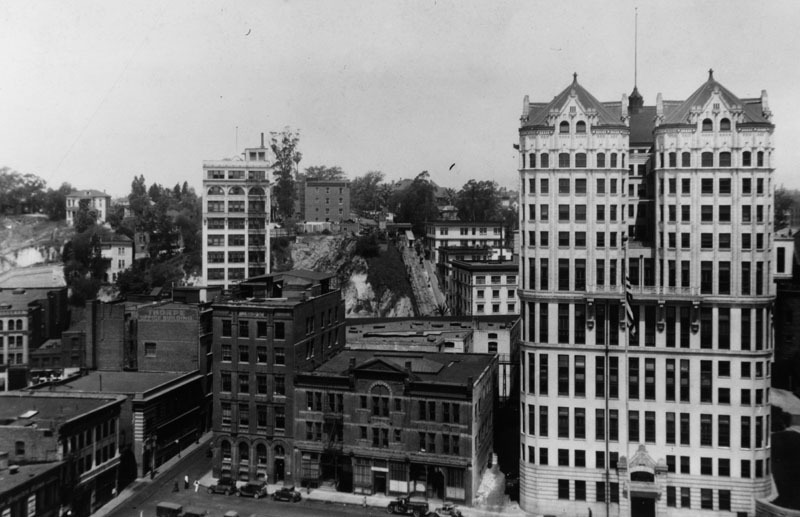 In the distance can be seen the 7-story Equitable Building on the northeast corner of Spring and 1st where City Hall is today. 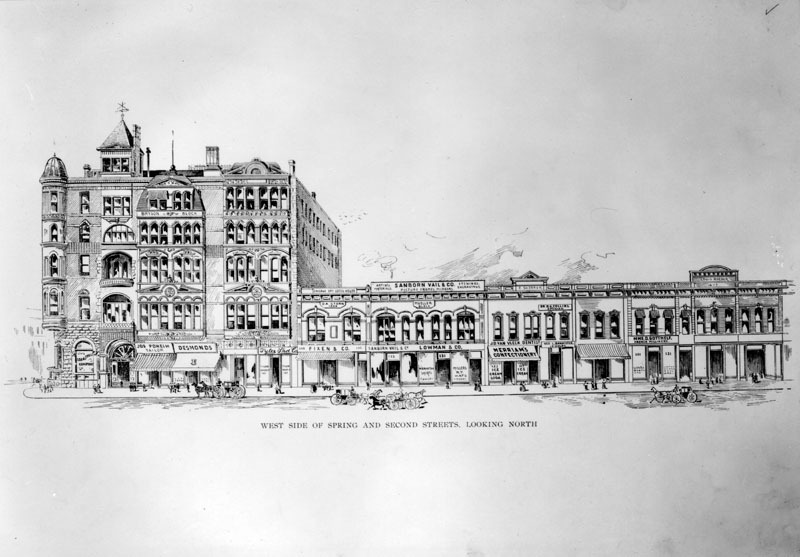 (n.d.)^ - Drawing of the west side of Spring Street, including the Bryson Block on the left, between 1st and 2nd Streets as it appeared in ca.1888. (ca. 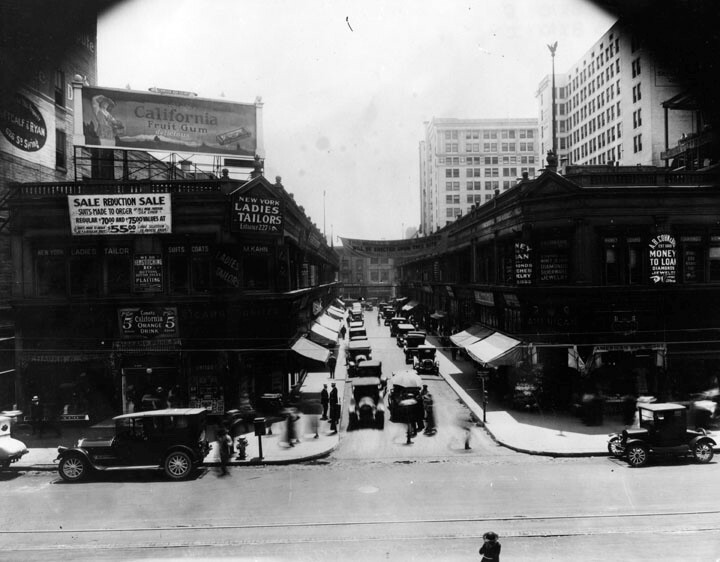 1920)^ - View circa 1920 of Spring Street looking south from 2nd Street. 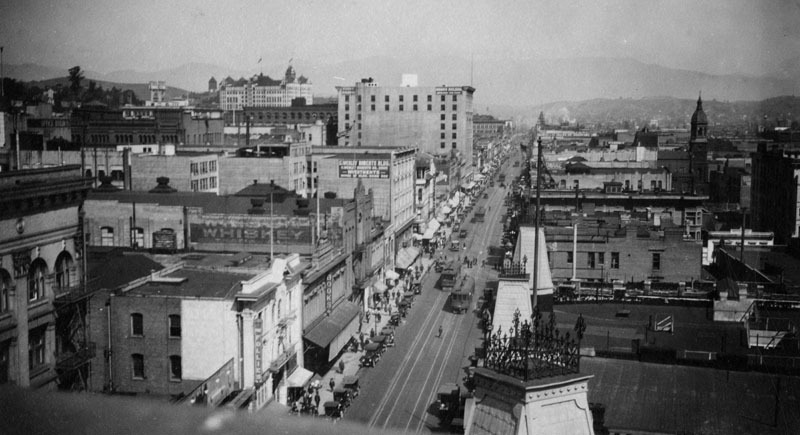 At right, a portion of the Hollenbeck Hotel shows; further right, center distance, the Lyceum Theatre (with tower); Douglas Block. 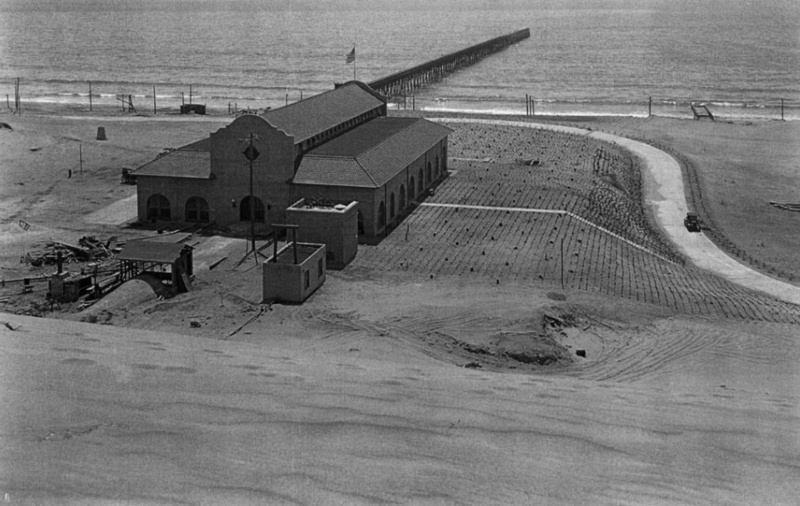 At left, the Wilcox Building, southeast corner. 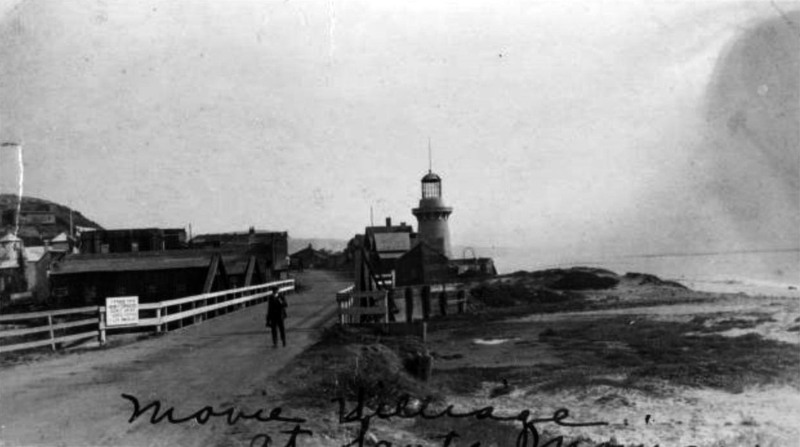 Note the ornate five-lamp streetlights. 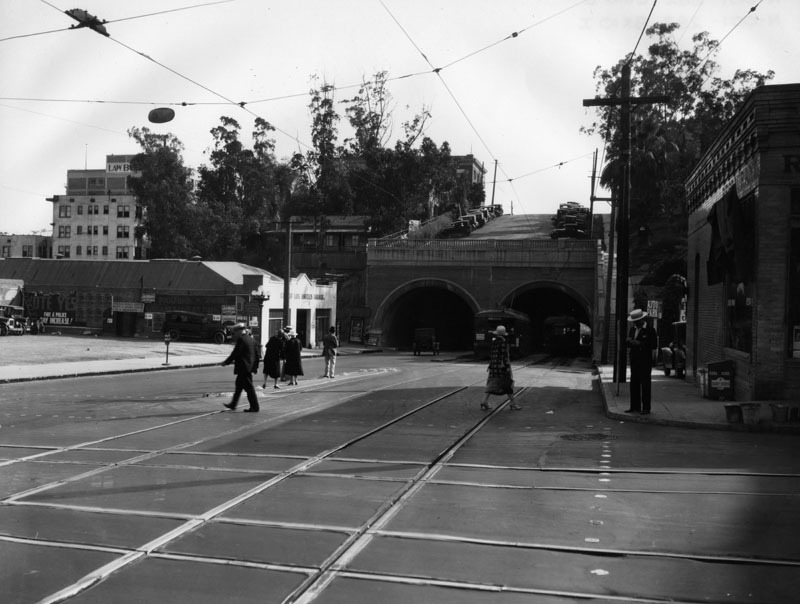 Click HERE to see more in Early LA Streetlights. 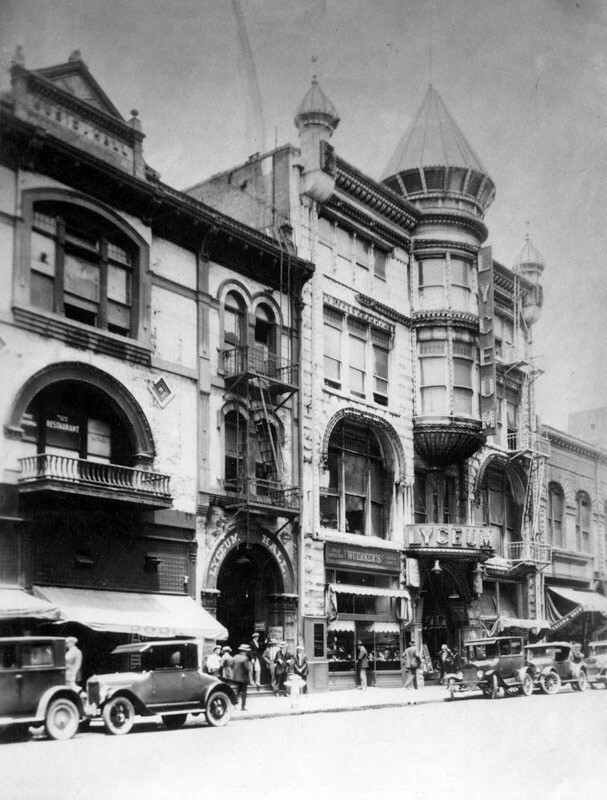 (1920)^ - Exterior view of the Lyceum Theatre, the original Los Angeles Theater, which opened in 1888 and located at 227 South Spring Street. 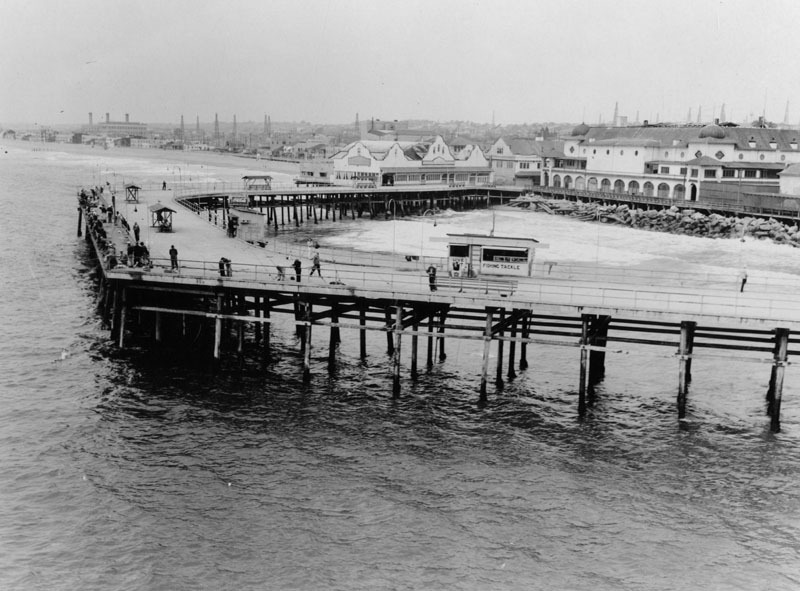 Opened in 1888 as the Los Angeles Theatre. 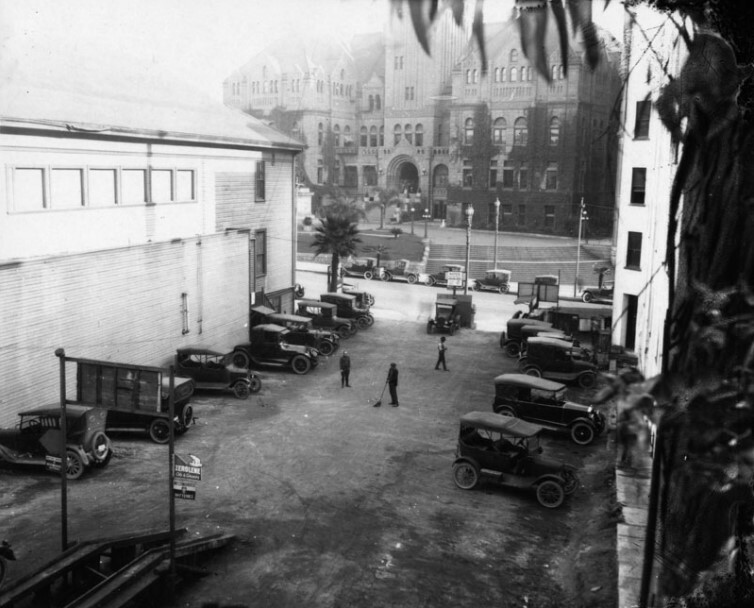 The theatre was built by William Hayes Perry and the building containing it was known as the Perry Building. 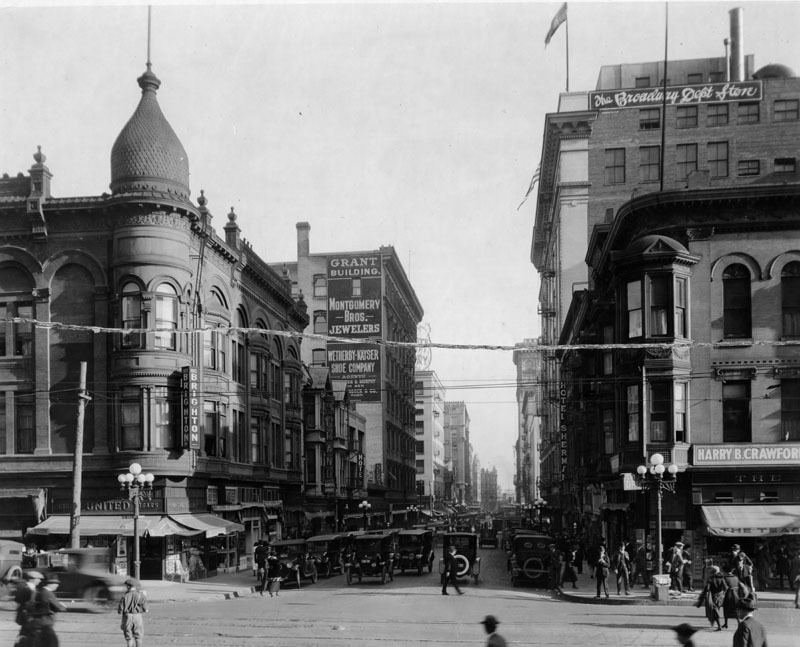 In 1903 this interesting Richardsonian Romanesque building became the Orpheum - the second home of Orpheum Circuit vaudeville in Los Angeles. Previously they'd been at the Grand Opera House. 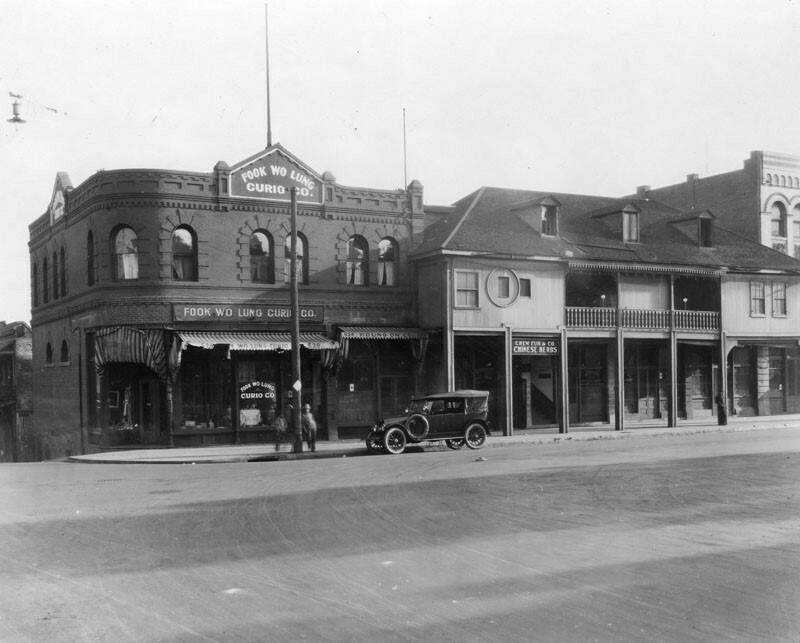 The Orpheum moved on in June, 1911 to their new home at 630 S. Broadway (now the Palace Theatre). 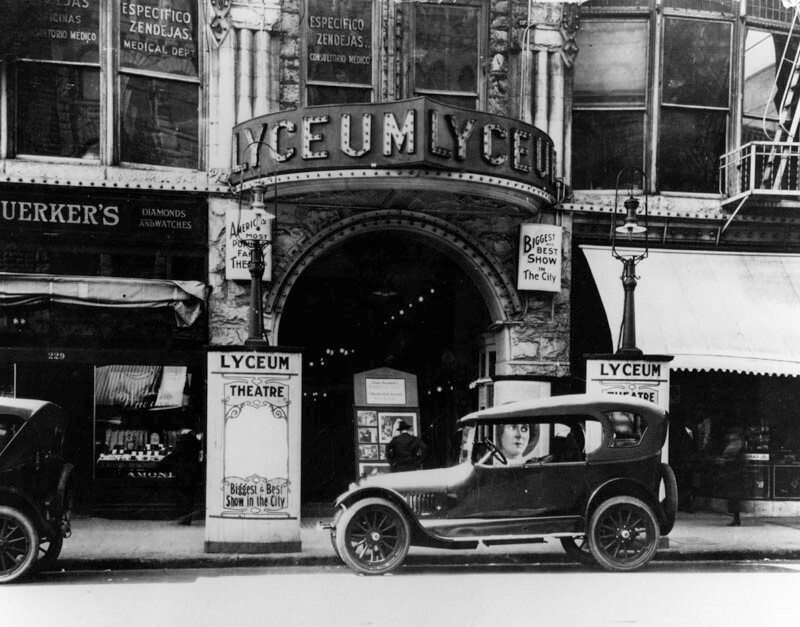 (1919)^ - View of an early model car parked in front of the entrance to the Lyceum Theatre on Spring Street. Signs in front read: "Biggest and Best Show in the City" and "America's Most Popular Family Theatre". 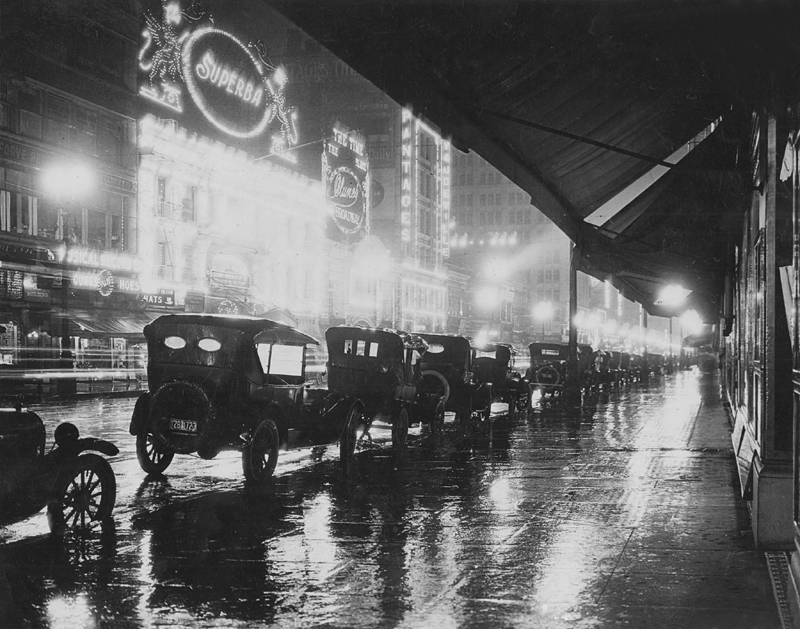 (1920)*^ - A rainy night image looking south on Broadway between 5th and 6th streets. 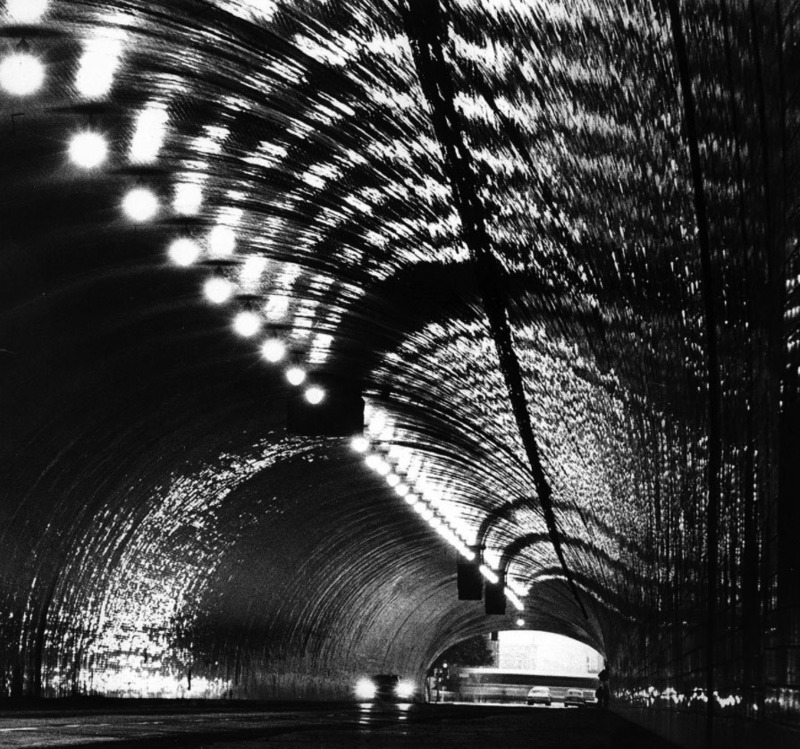 The dazzling Superba Theatre illuminates the wet pavement. 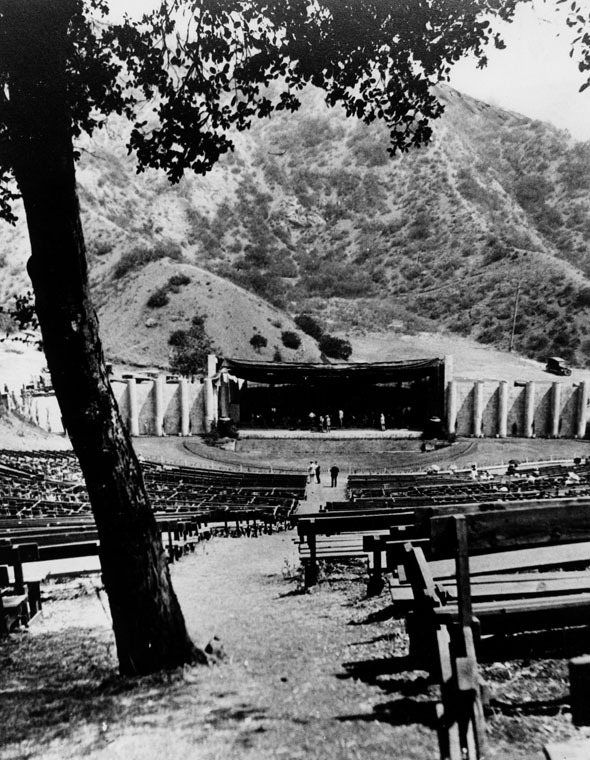 The Superba theatre was opened on July 30, 1914 by pioneer theatreman John A. Quinn. 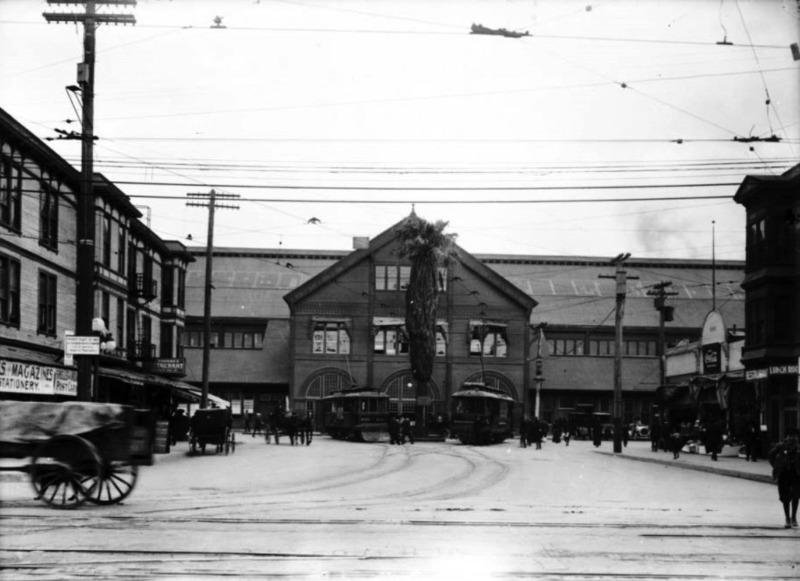 Earlier (1909 or 1910) Quinn had moved from Arizona and leased the Ideal Theatre (134 S. Spring St.). 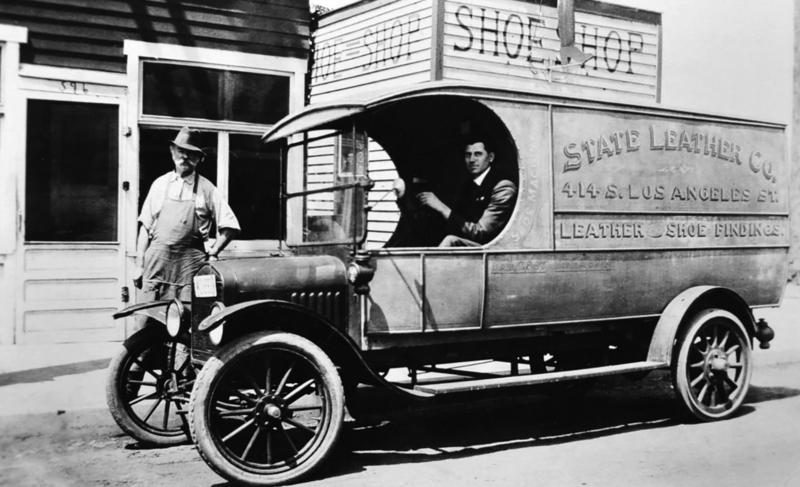 This was followed by a partnership with G.H. McLain that acquired the Bijou (553 S. Main St.) and the Banner (456 S. Main St.). (ca. 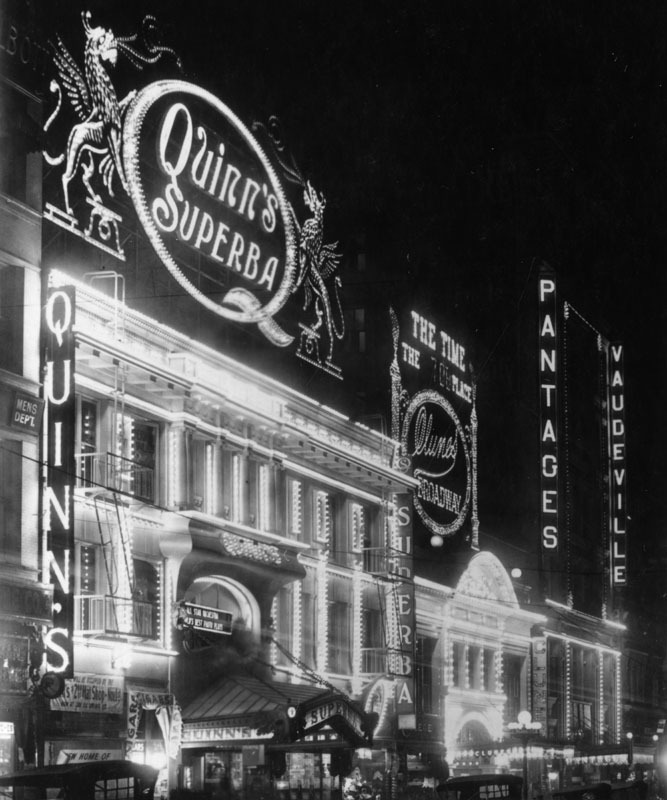 1915)^ - Exterior view of the front of Quinn's Superba Theatre, with a view down the street where signs can be seen for the Pantages Vaudeville. (ca. 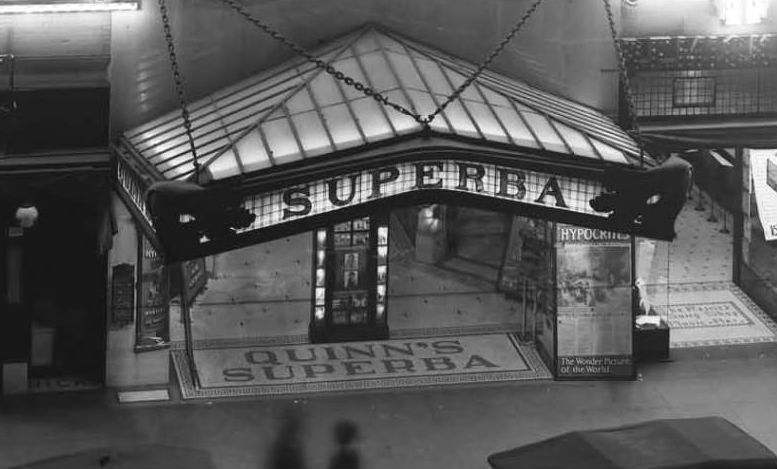 1915)*#* - Close-up view of the Quinn's Superba Entrance, 518 South Broadway in downtown Los Angeles. 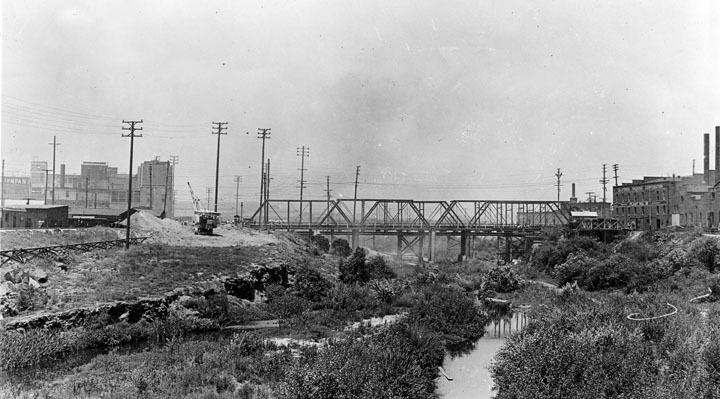 (1923)**# - View looking east showing the Macy Street Bridge over the Los Angeles River. 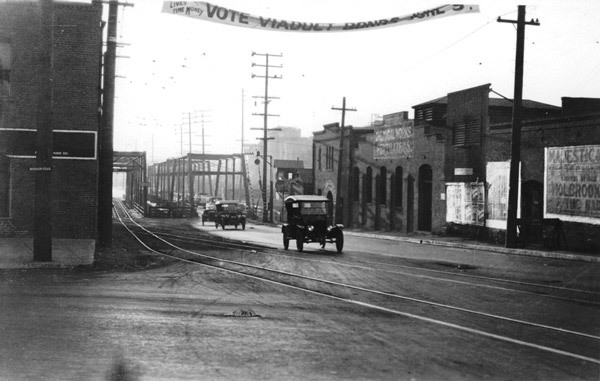 A banner above the roadway reads: VOTE VIADUCT BONDS - APRIL 5. 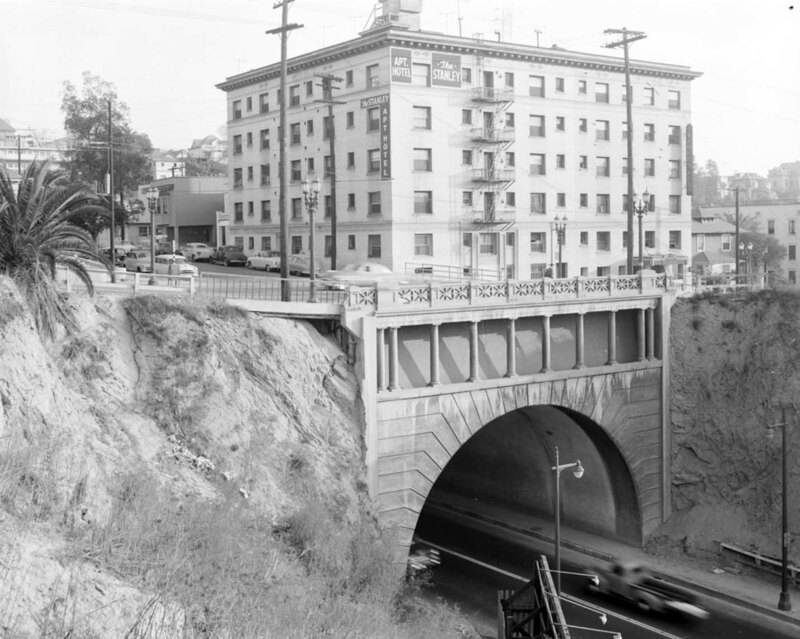 Over the years there have been several bridges connecting Macy Street with Brooklyn Avenue (previously Pleasant Avenue) in East Los Angeles. 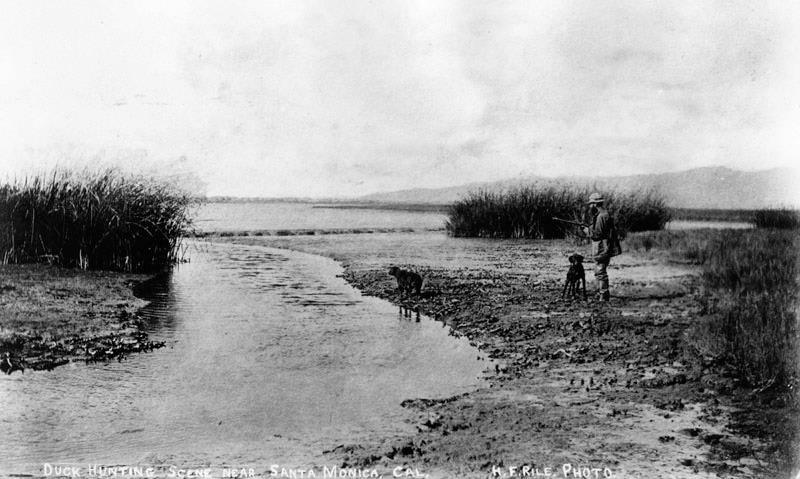 In fact, the first span over the Los Angeles River was a covered bridge, lit with kerosene lamps, built on this spot in 1870. 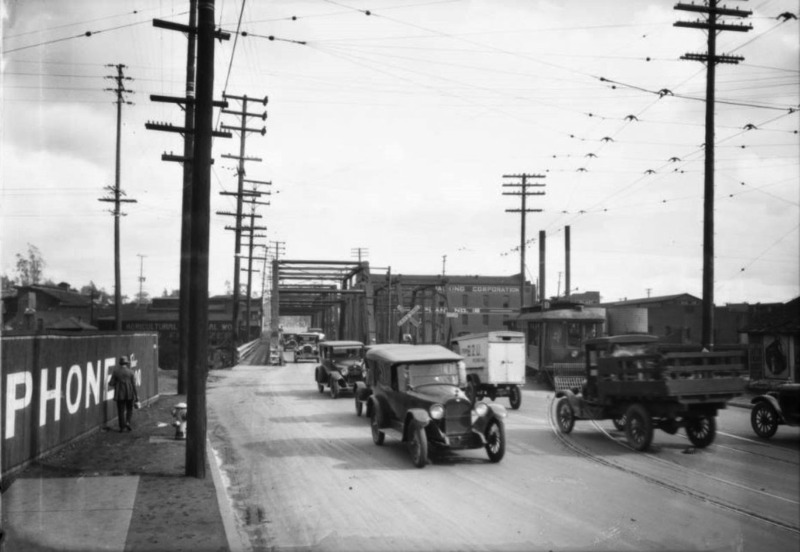 (1925)^^ – View looking west showing cars, trucks, and streetcars sharing the road at the Macy Street Bridge. 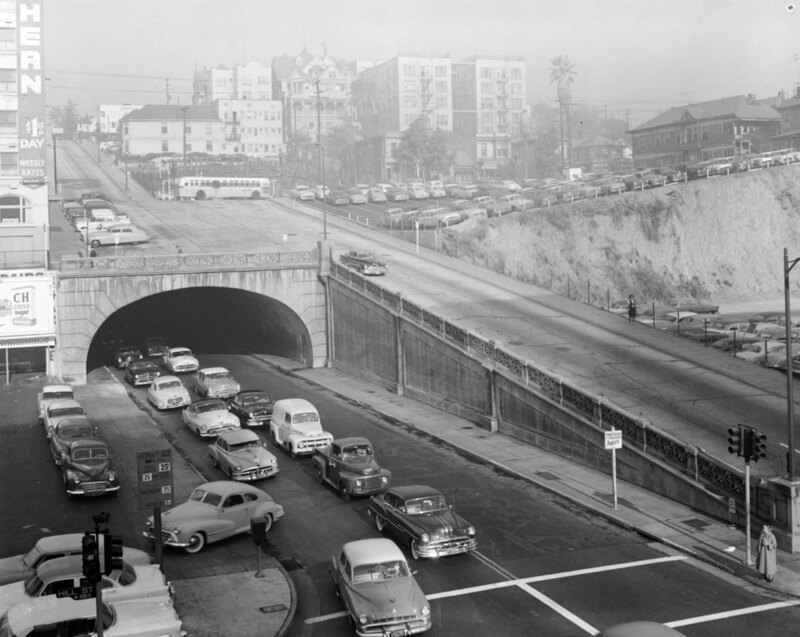 Today, Macy Street is Cesar Chavez Avenue. 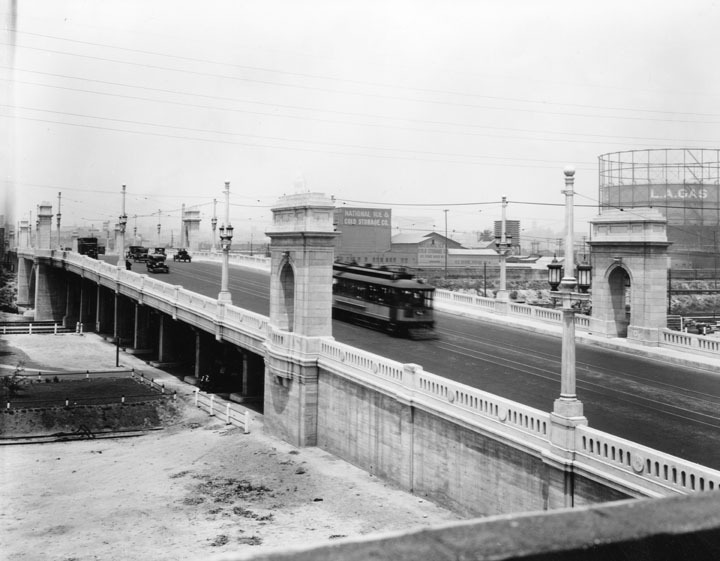 (1925)^ - Profile view of the old Macy Street Bridge prior to its demolition. (ca. 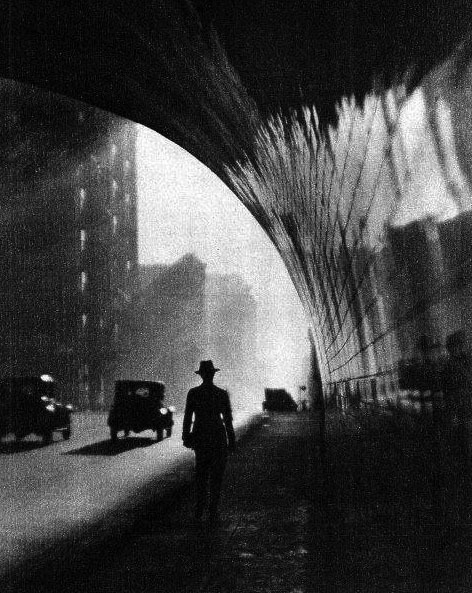 1926)* - Profile view of the new Macy Street Bridge, constructed 1925-26. 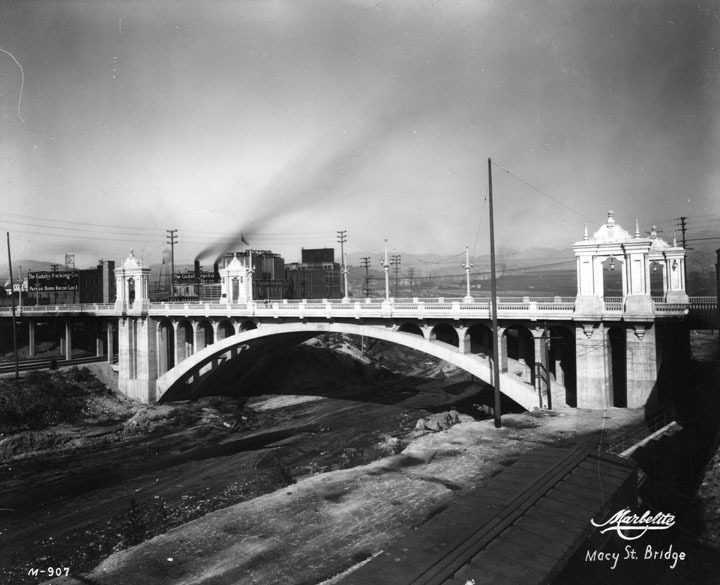 The Macy Street Viaduct (Bridge) is the second bridge built during large bridge-building program in Los Angeles during the 1920s. 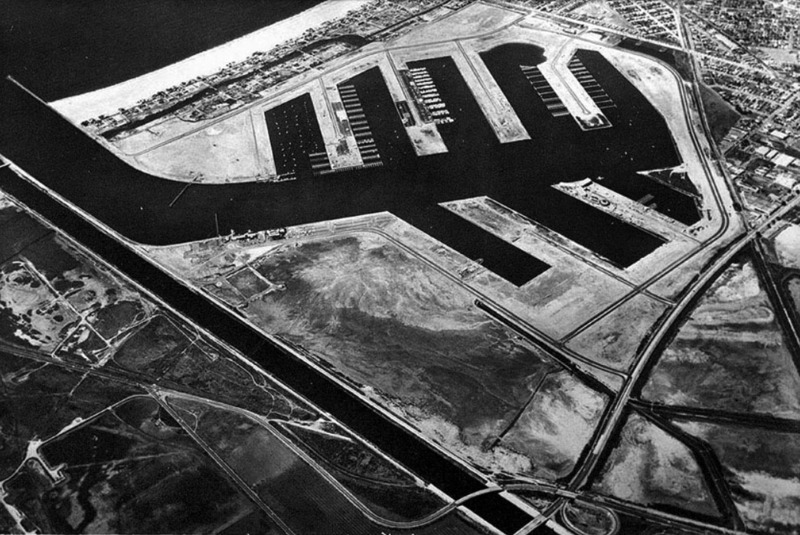 The program started in 1923 with lobbyists pushing for the replacement of several of the city's outdated bridges and viaducts. 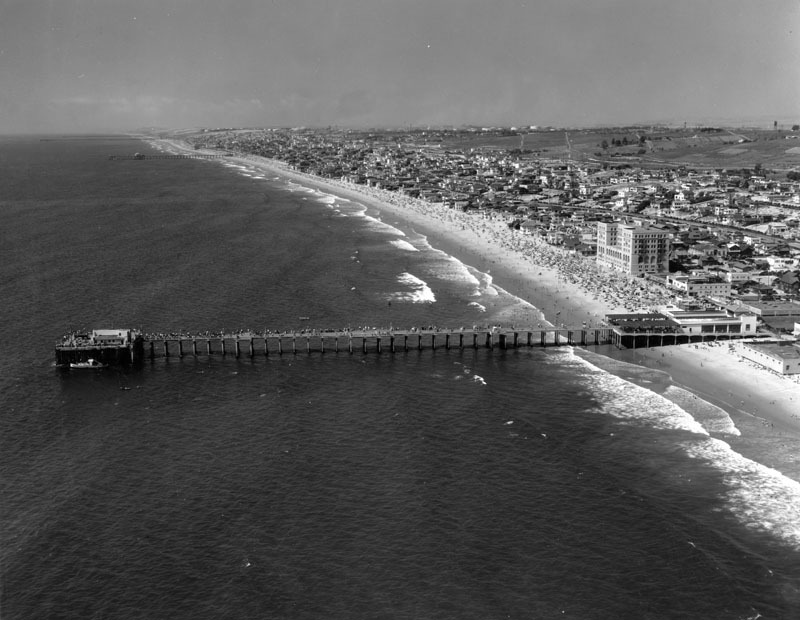 The Macy Street truss bridge was problematic for motorists due to its narrow width and two railroad mainlines (the Santa Fe and Union Pacific) located on either side of the span. 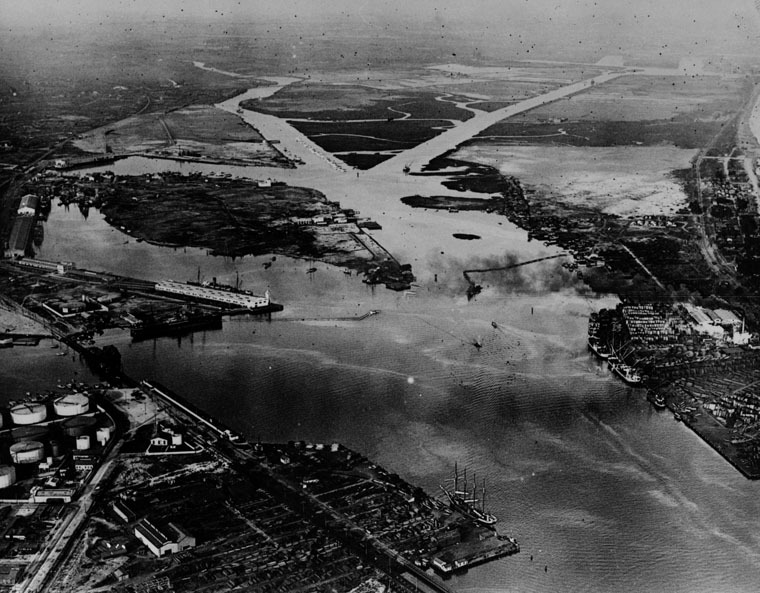 The new bridge formally opened on April 17, 1926. 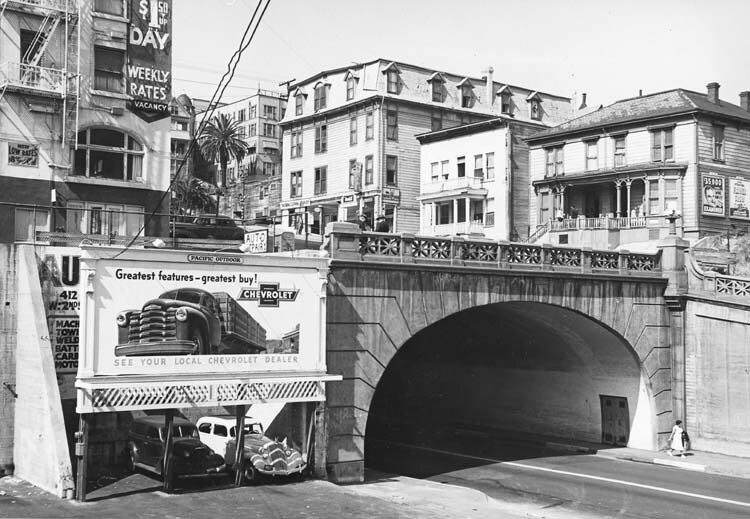 The bridge's Spanish Colonial elements are a nod to El Camino Real, the route of which Macy Street/Cesar Chavez Avenue follow. 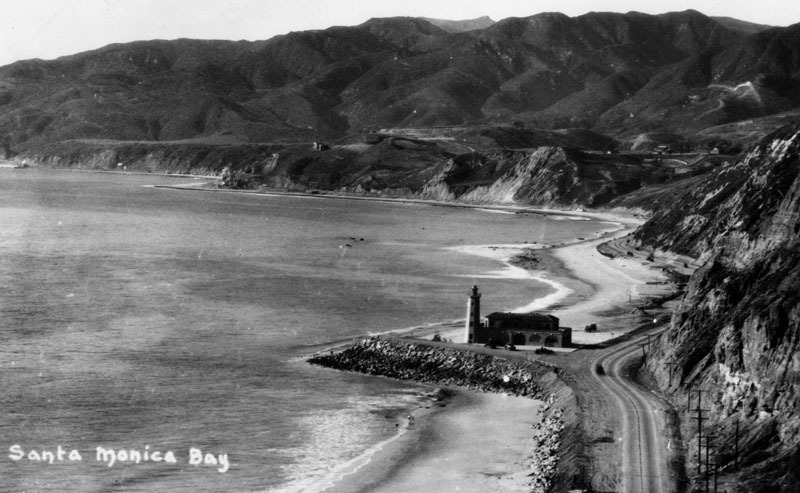 It is also why the bridge is dedicated to Father Junipero Serra. (ca. 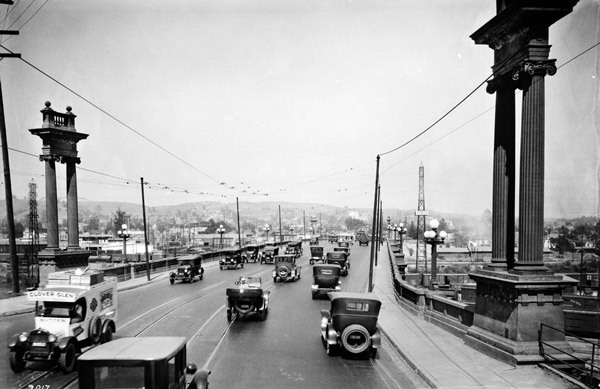 1929)^ - View of the 1st Street Bridge as a trolley and several cars drive across. On the other side of the bridge some businesses can be seen: National Ice & Cold Storage Co. and a large tank marked L.A. Gas. 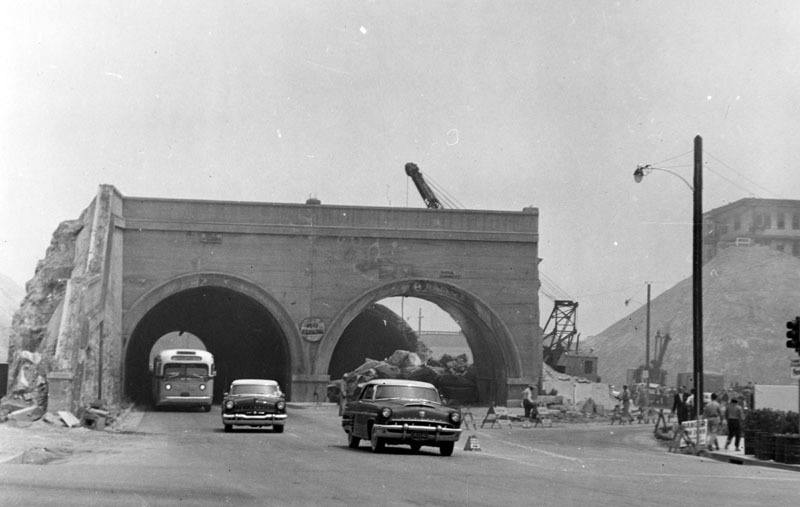 The First Street Viaduct opened in 1929, and is one of the series of classic Los Angeles River bridges designed by Merrill Butler. 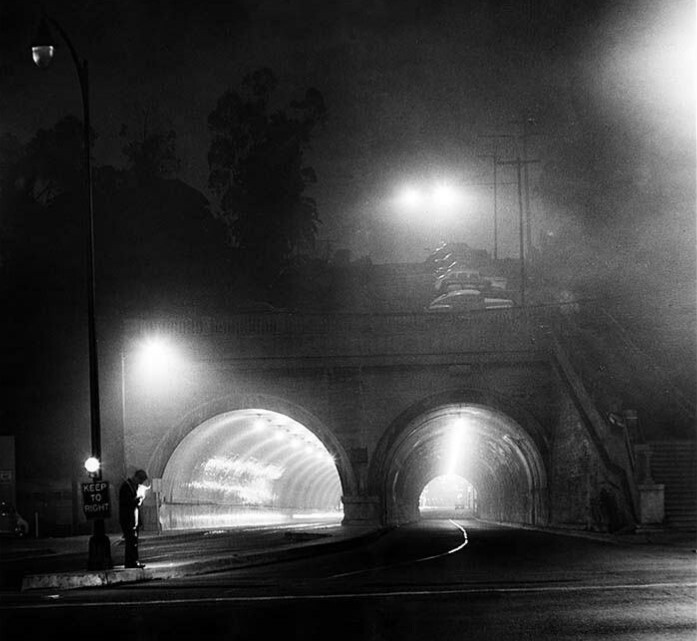 Click HERE to see more in Early Los Angeles Streetlights. (ca. 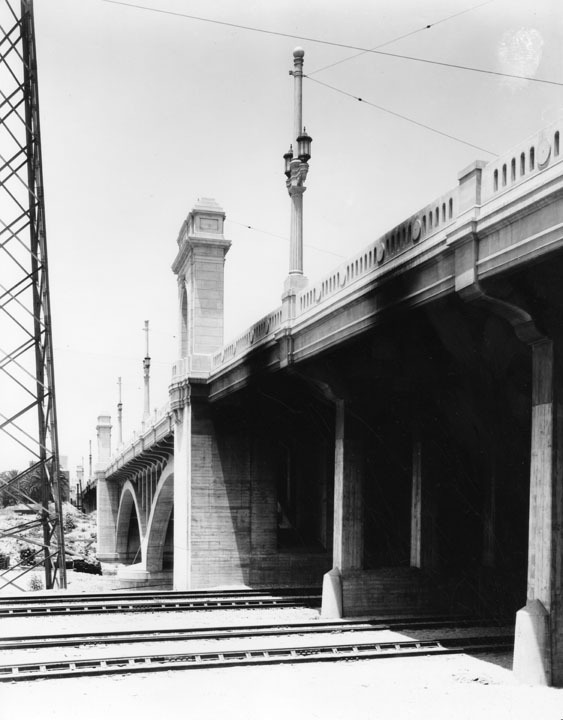 1930s)^ - 1st Street Bridge, viewed from below. 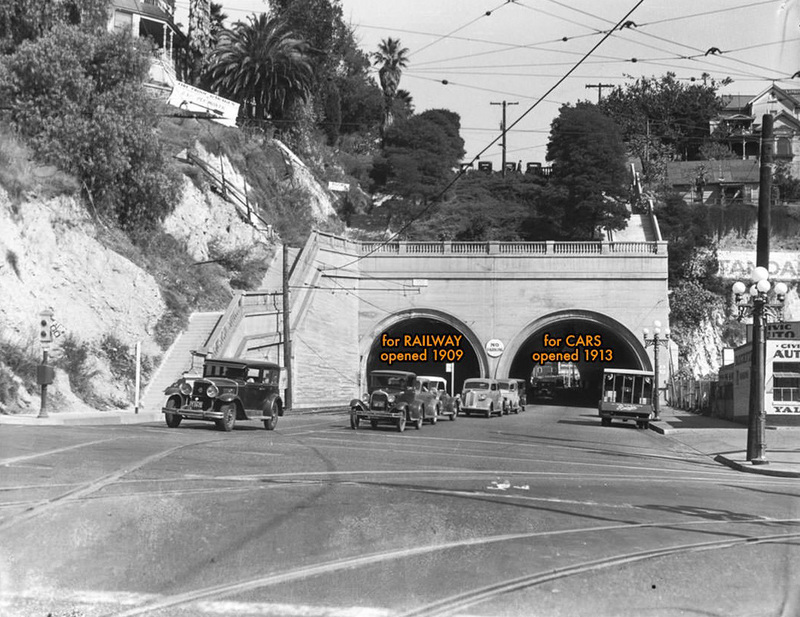 Notice the dirt and grime on the facade right above the train tunnels. 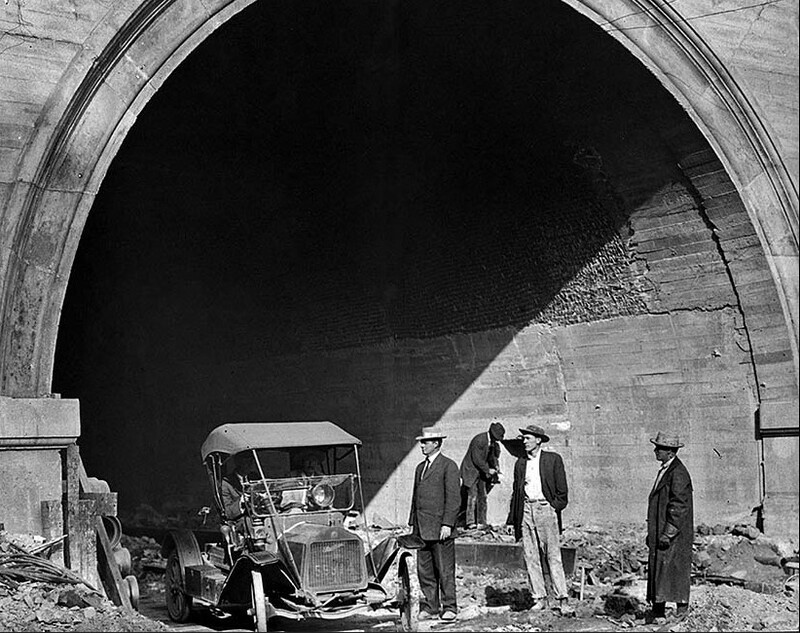 (1933)### - View showing the Atchison, Topeka & Santa Fe (ATSF) locomotive, engine number 3525, engine type 4-6-2 passing under the 1st Street Bridge. 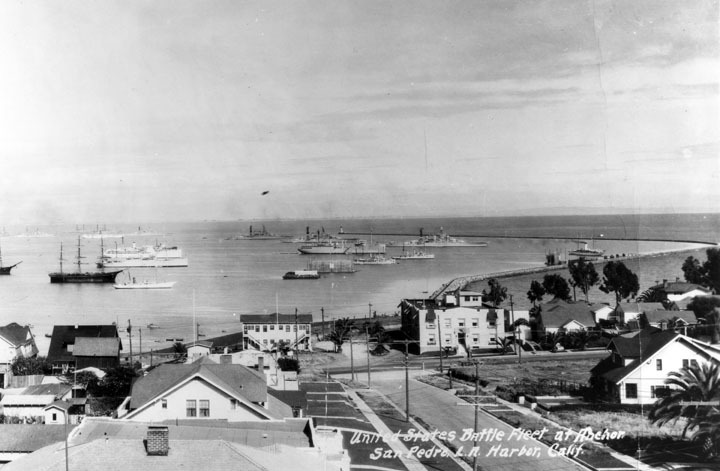 The Santa Fe was a pioneer in intermodal freight service, an enterprise that (at one time or another) included a tugboat fleet and an airline (the short-lived Santa Fe Skyway). 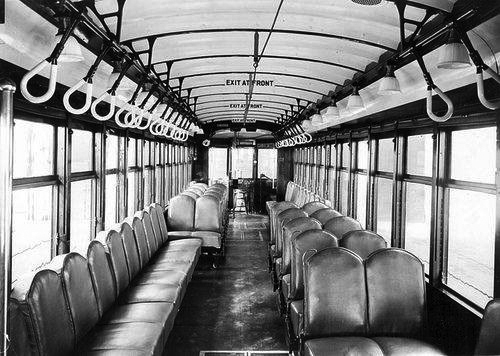 Its bus line extended passenger transportation to areas not accessible by rail, and ferryboats on the San Francisco Bay allowed travelers to complete their westward journeys to the Pacific Ocean. 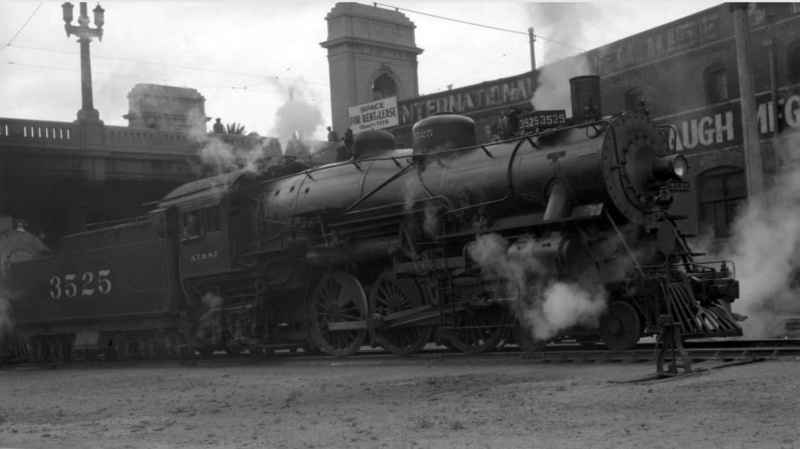 The ATSF was the subject of a popular song, Harry Warren & Johnny Mercer's "On the Atchison, Topeka and the Santa Fe", written for the film, The Harvey Girls (1946). (2012)^## - 435 MTA westbound on the First Street Bridge. 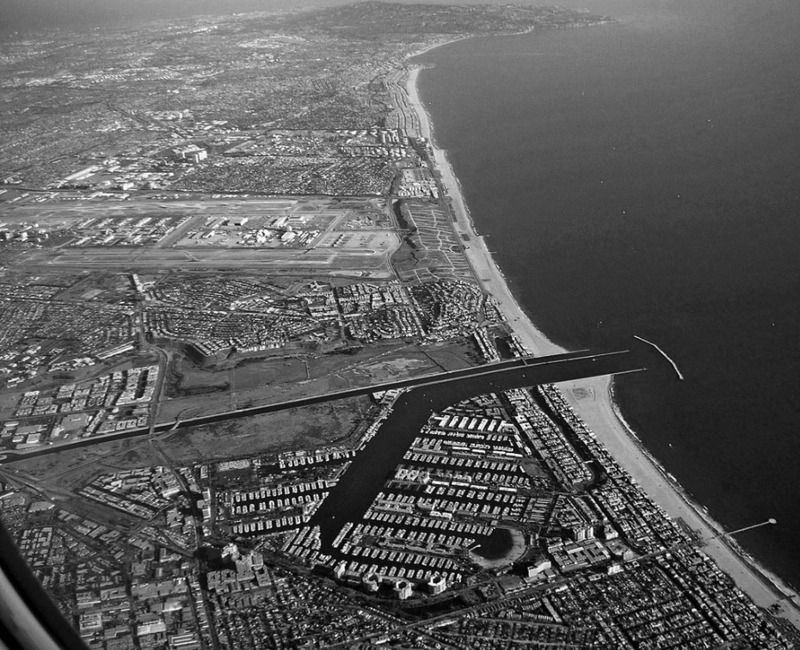 The bridge was declared a historic-cultural monument in 2008, and the Gold Line extension, which runs down the middle of the bridge, opened the following year. (ca. 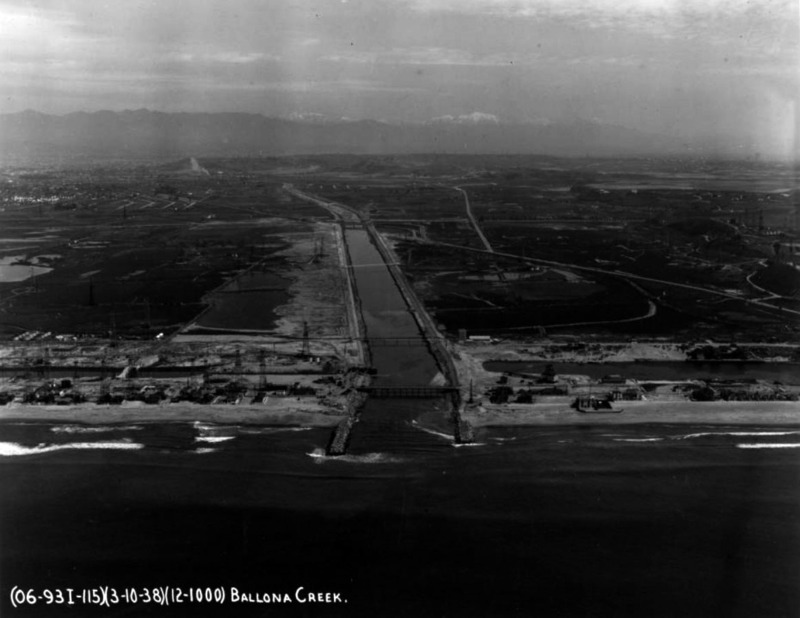 1924)^^ - View of the Buena Vista (North Broadway) Bridge over the Los Angeles River. 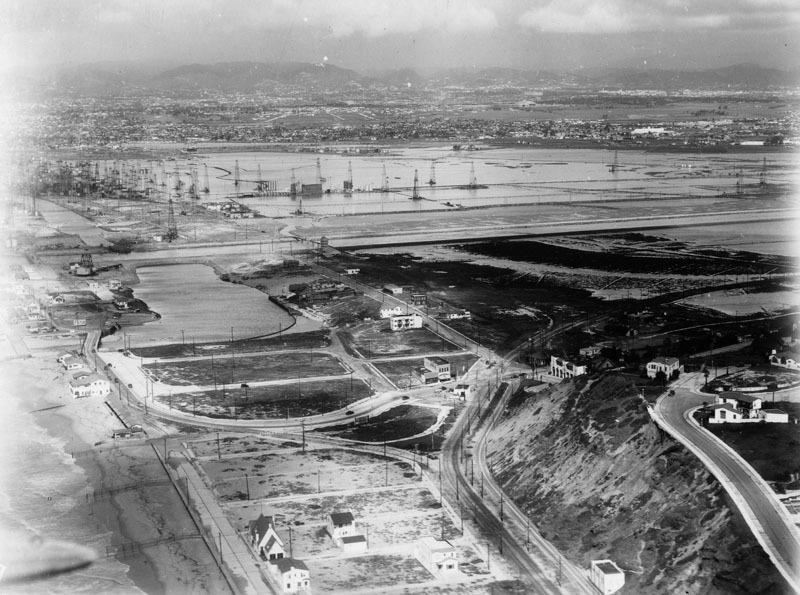 (1927)#^ – Panoramic view looking east from Elysian Park showing the Buena Vista (North Broadway) Bridge spanning the Los Angeles River and the SP trackage coming out of the 'Cornfield' (out-of-frame to the right). 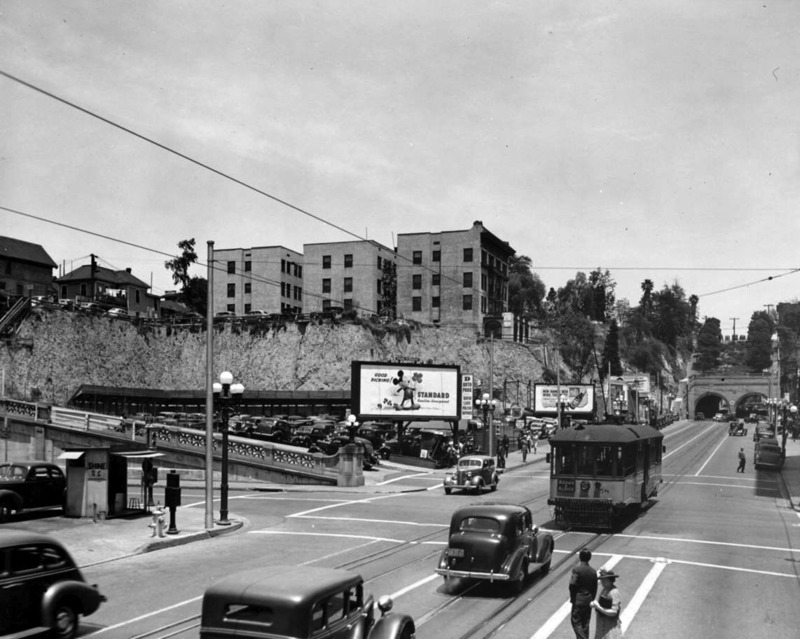 (1937)^^ - View of a congested North Broadway bridge taken from the entrance to Elysian Park. 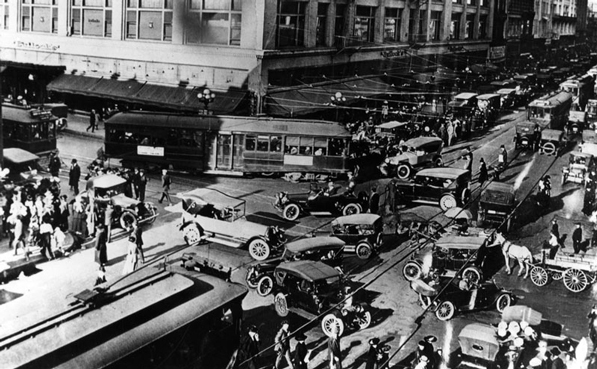 Electric streetcars are in the midst of traffic. 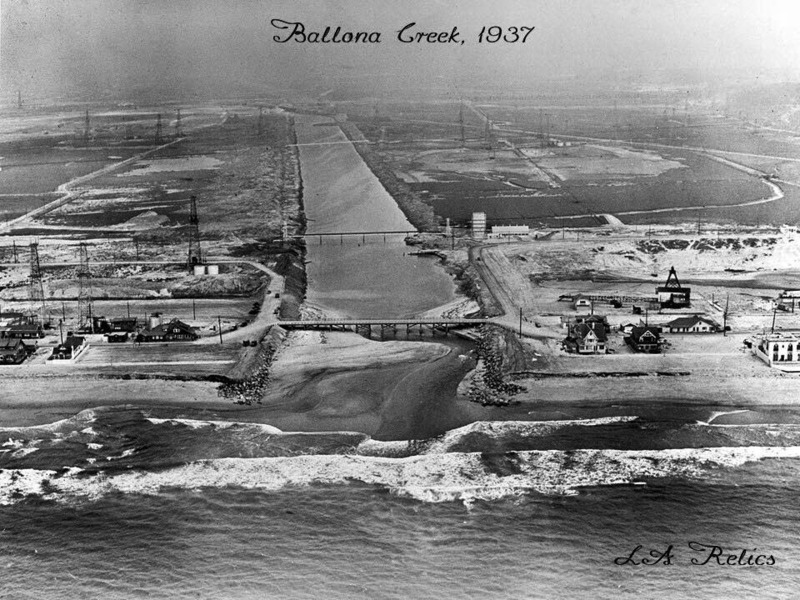 (1938)#^ - Aerial view showing the N. Broadway and Spring St. Bridges corssing a swollen Los Angeles River with Elysian Park (upper left) and the SP Cornfield (also known in 1938 as the Bullring) railroad yard. 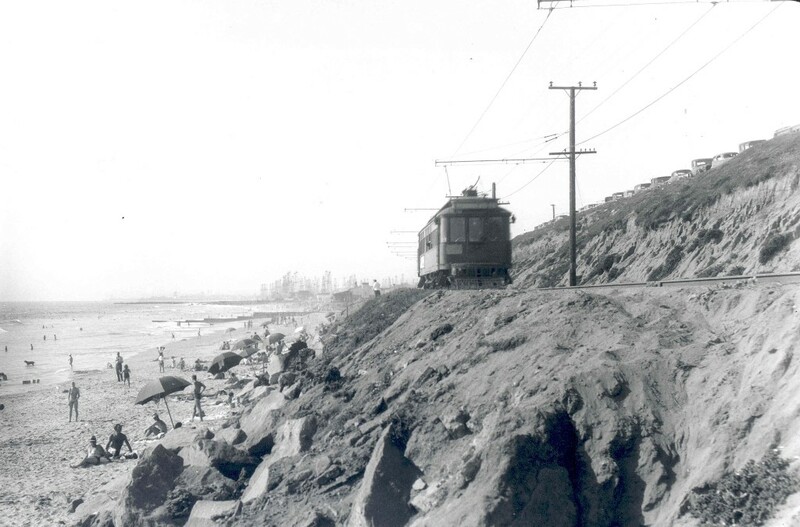 Meadow Road and Park Row Drive wind up a steep slope into Elysian Park at left north of the railroad yard. 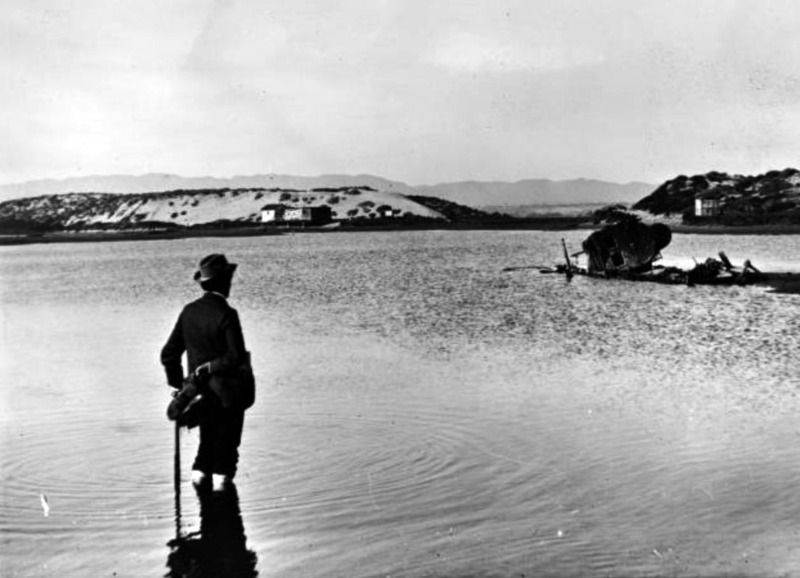 1938 saw unusually heavy rainfall with widespread flooding. Notice the river is still 'unimproved'. 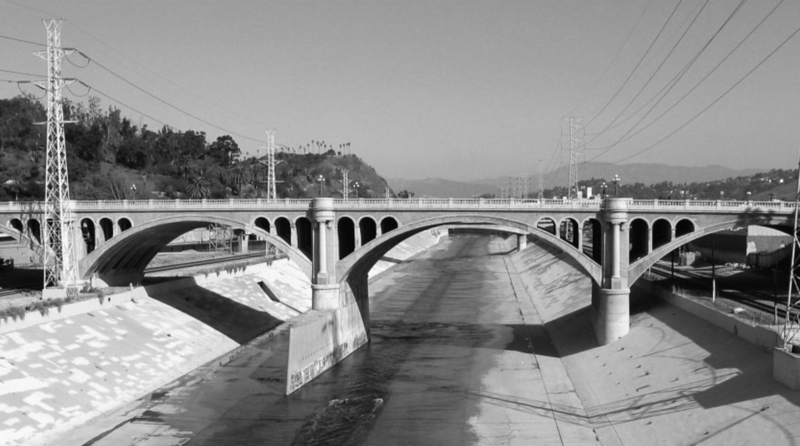 Click HERE to see more in Los Angeles River – The Unpredictable. 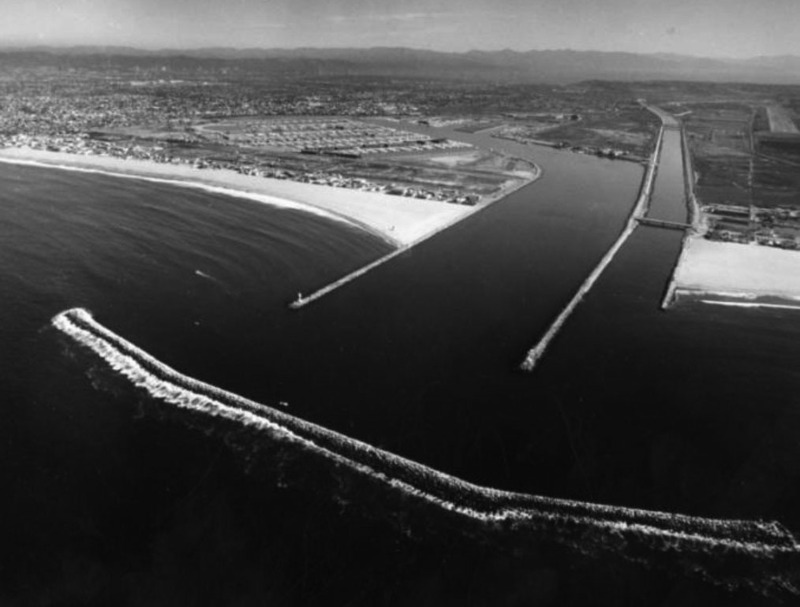 (2000)+** - Wide-angle view of the Buena Vista-Broadway Bridge looking north shortly after it was retrofitted. 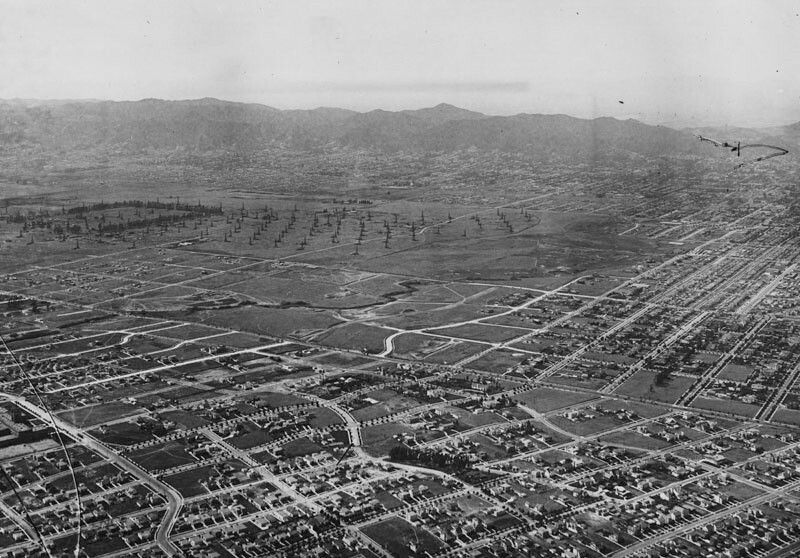 (1920)*^^ - Looking north over Highland Park towards the San Gabriel Mountains on a clear day. 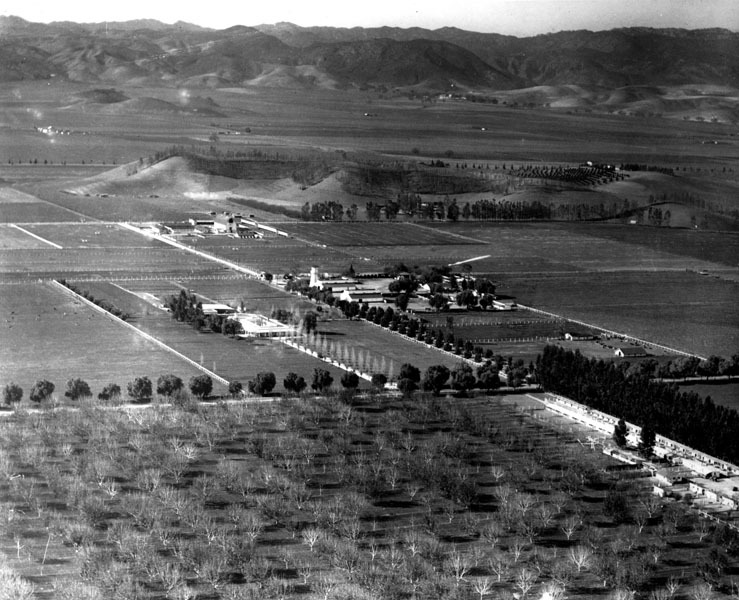 The white building at center-left of the photo was once the Library building of the Occidental College Highland Park Campus in the early 1900s. (ca. 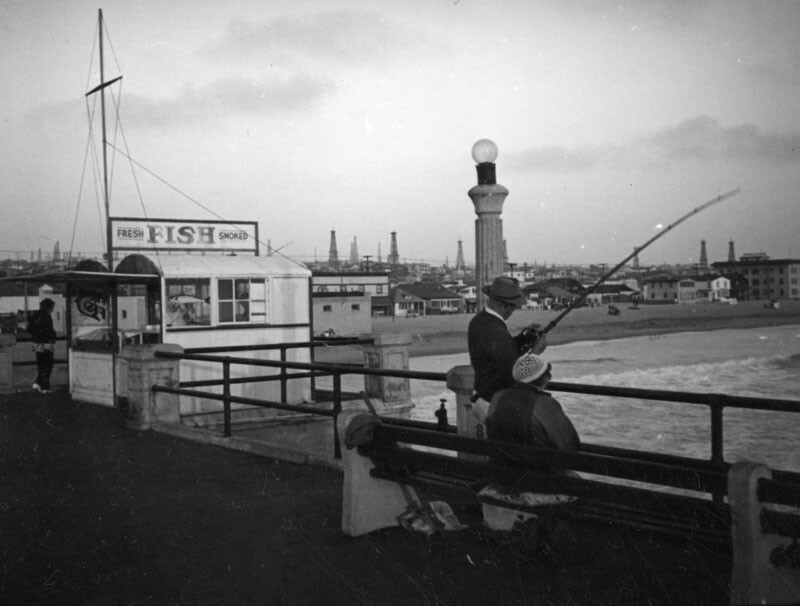 1908)^^ - Photograph of the Chas. 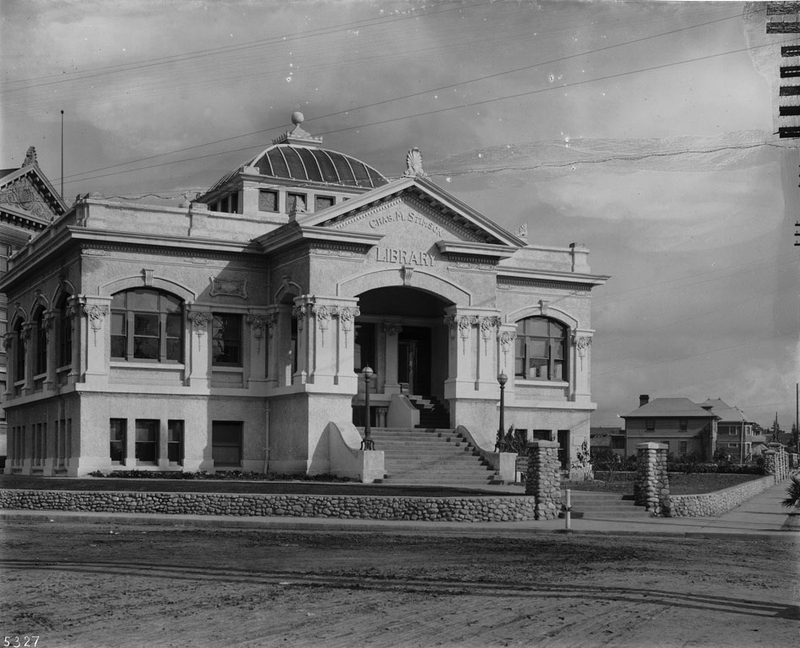 M. Stimson Library, built in 1904 on the Occidental College Highland Park Campus. The two-story building has an extended porch where above it is a pediment displaying the name of the building. Multifoil tracery outline the windows the walls. Above the roof is a turret-like tower. A stone masonry wall creates a perimeter around the front yard. 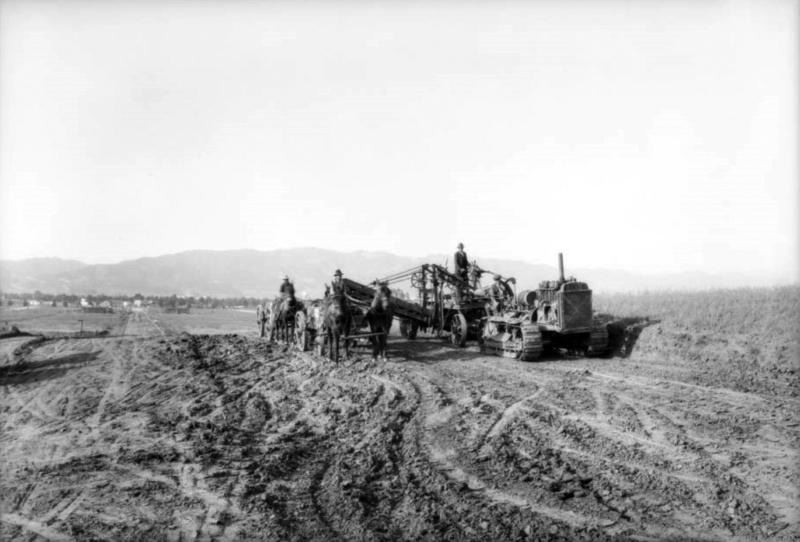 Heavy tracks line the dirt road in front of the building. (ca. 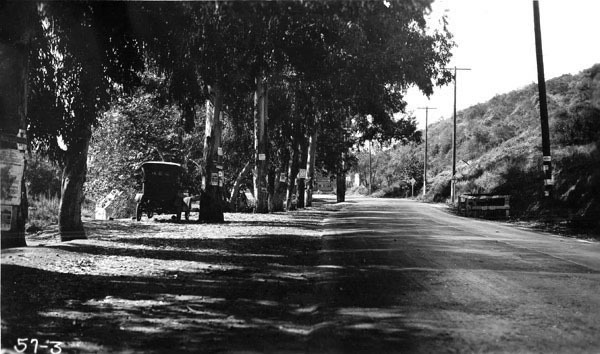 1920)^ - Pasadena Avenue (later North Figueroa Street) in Highland Park. 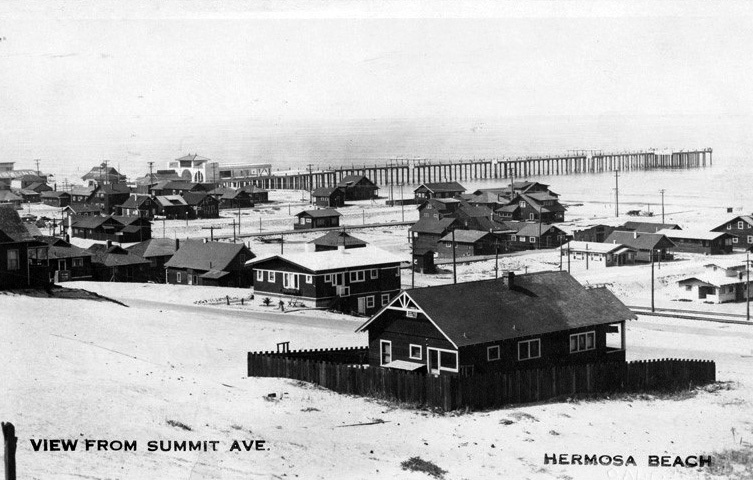 The Sunbeam Theater is on the left, and Highland Park Herald newspaper office on the right. 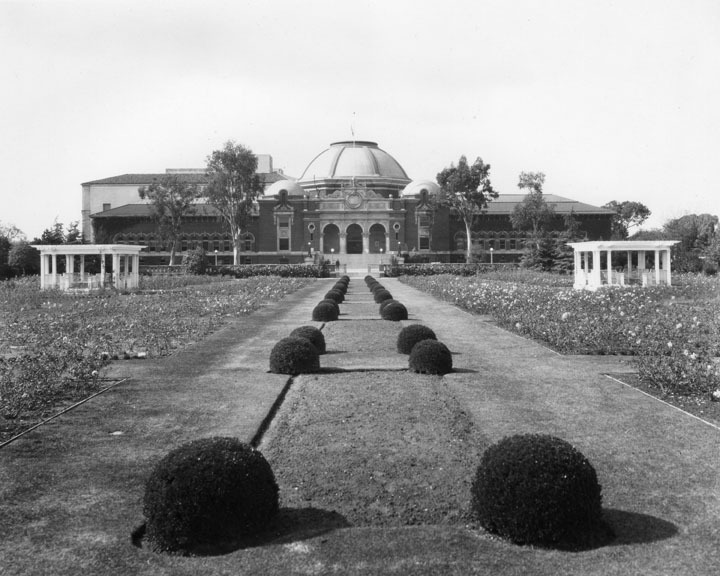 The theater, located at 5722 N. Figueroa Street, was designed by A. Lawrence Valk. (ca. 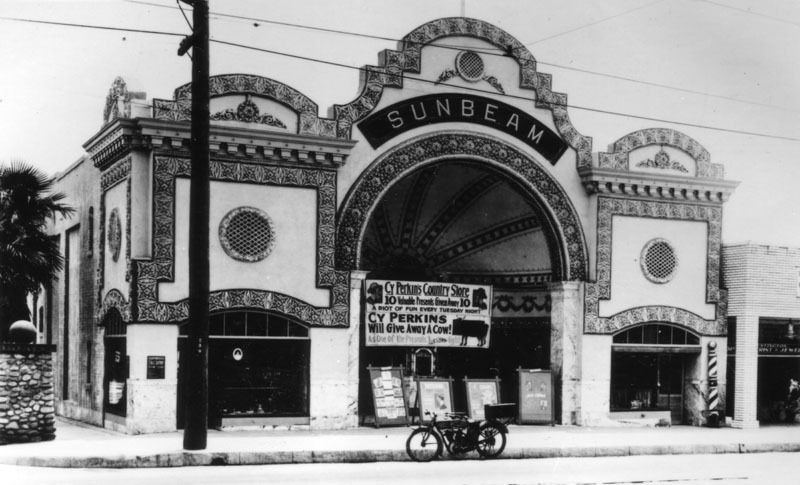 1920)^ - Exterior view of the Sunbeam Theater in Highland Park, with a sign advertising a promotion by Cy Perkins Country Store. An early model motorcycle is parked in front of the theater. (ca. 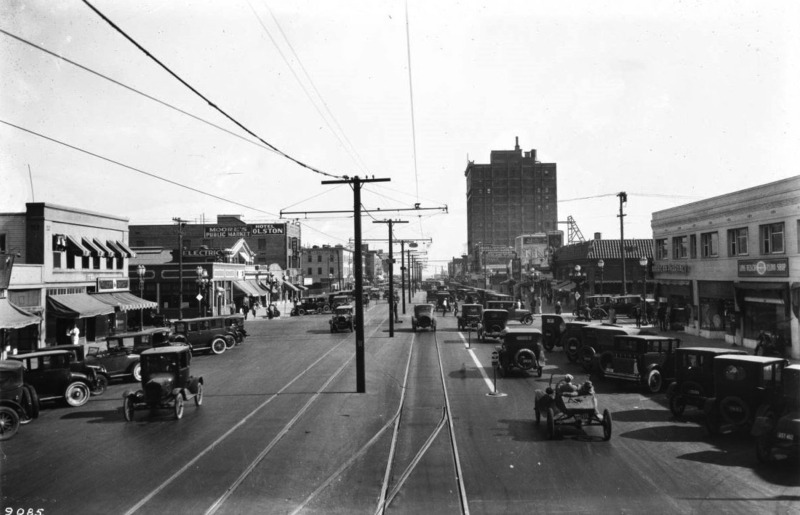 1920)^ - View of North Main Street at Arcadia Street in the Plaza area circa 1920. 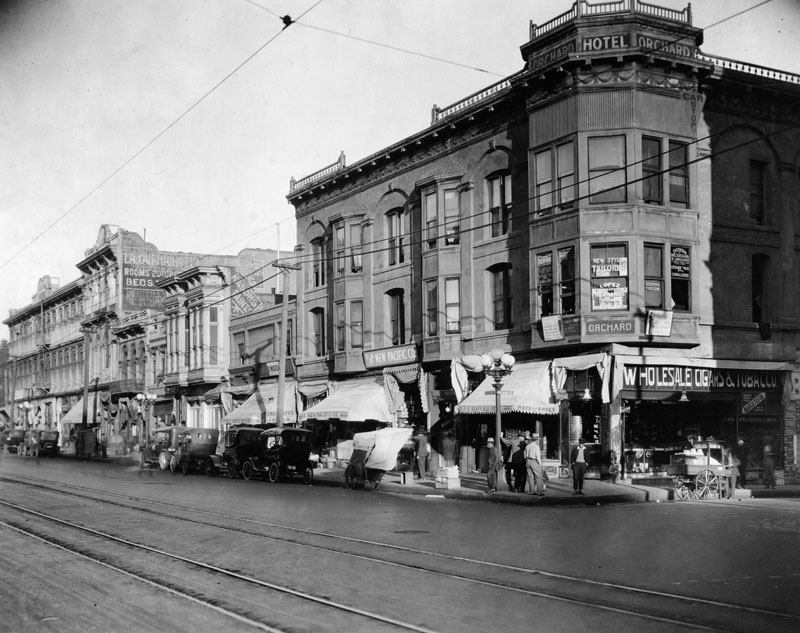 From left to right: Pico House, Merced Theater, Masonic Temple, and Hotel Orchard on the corner of Arcadia Street. Small shops are at street level, and cars are parked along the curb. 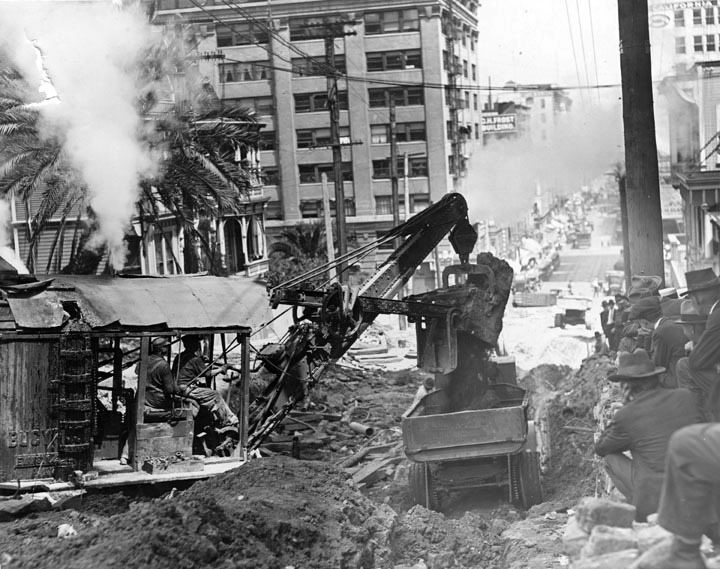 Streetcar tracks are in the foreground. (ca. 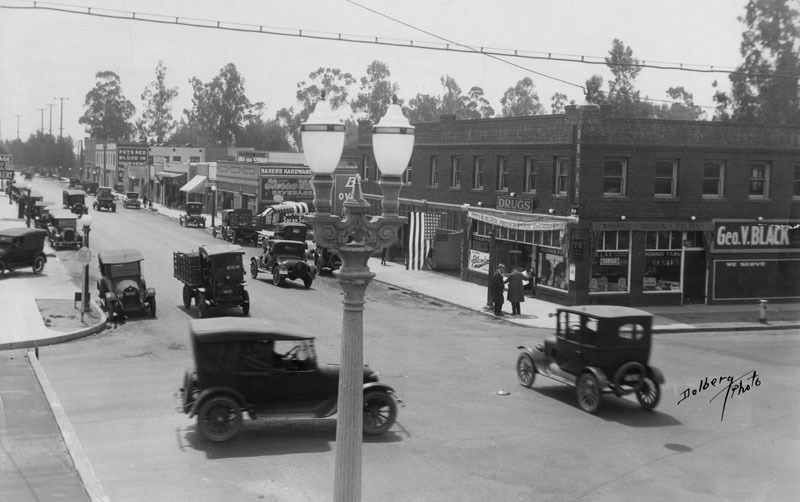 1920)^ - View of a busy North Main Street in front of the Azteca Restaurant as seen from across the street. The restaurant is located on the street floor of the old Bella Union Hotel. A sign on the second floor reads: Office Room For Rent. 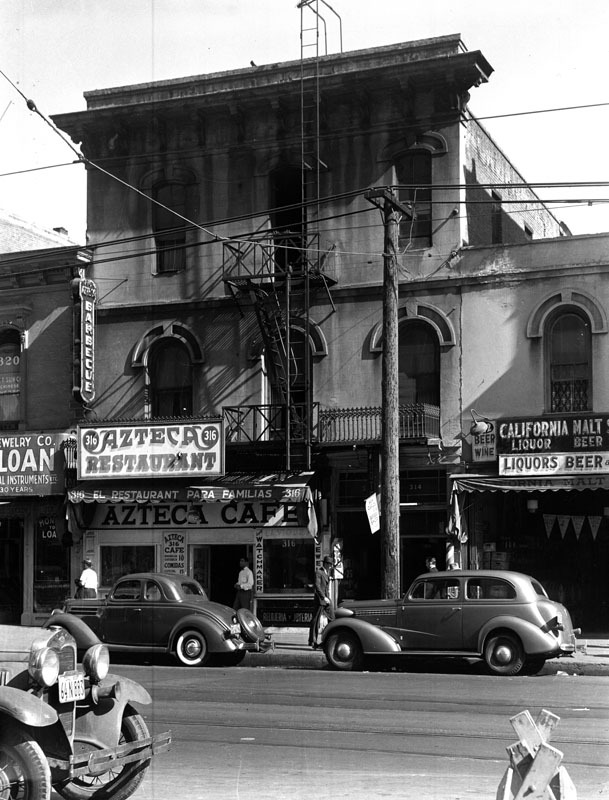 (1939)^ - Exterior view of the old Bella Union Hotel, located at 314 North Main Street. 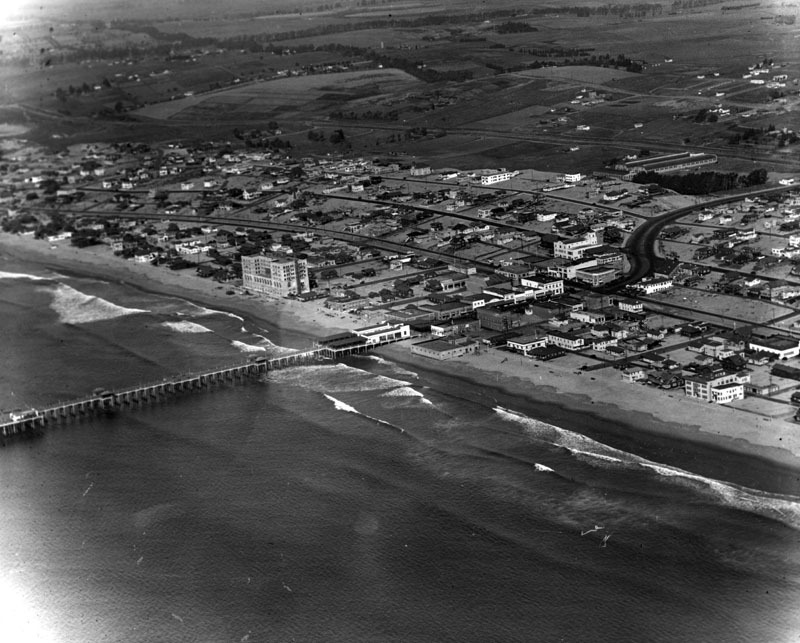 Taken on May 4, 1939, the hotel had become a shadow of its former self. (ca. 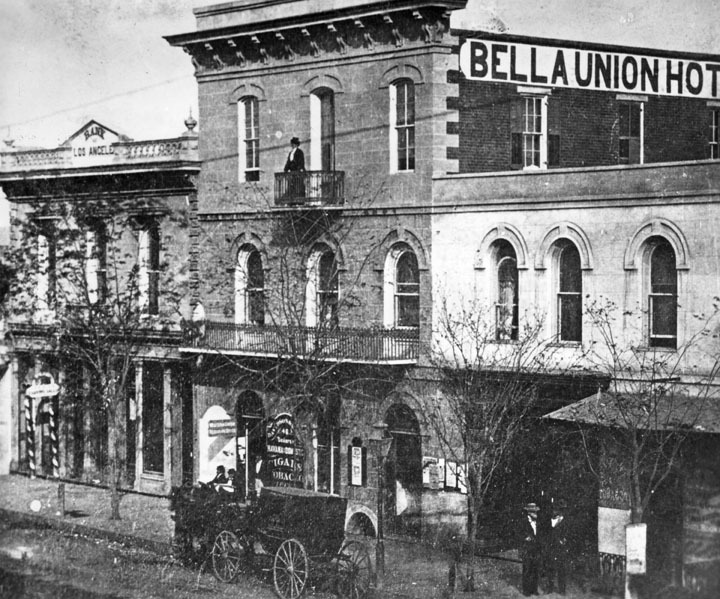 1867)^ - The Bella Union at 314 N. Main St. later became the St. Charles Hotel. 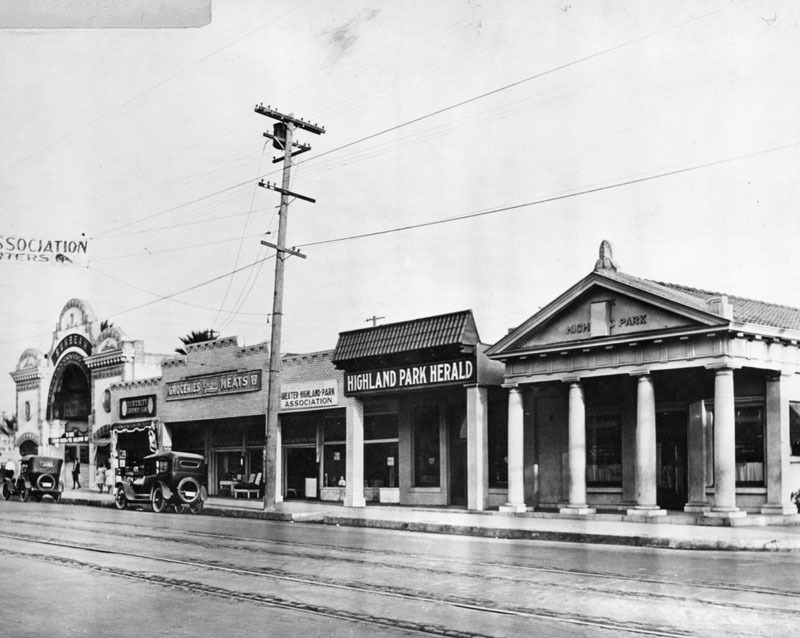 To the left is the original home of Farmers and Merchants Bank, later merged into Security Pacific Bank. 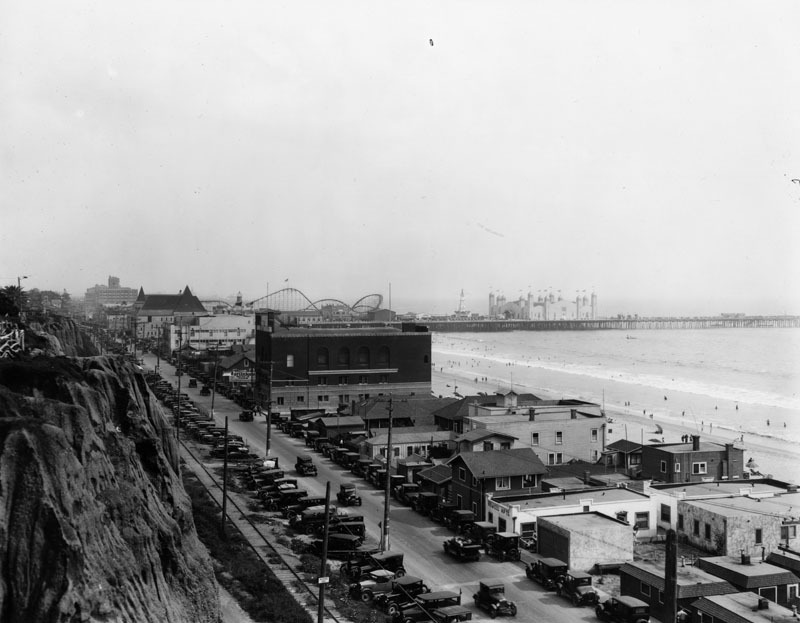 Standing on the balcony is Mrs. Margarita Bandini Winston, owner of the hotel. (ca. 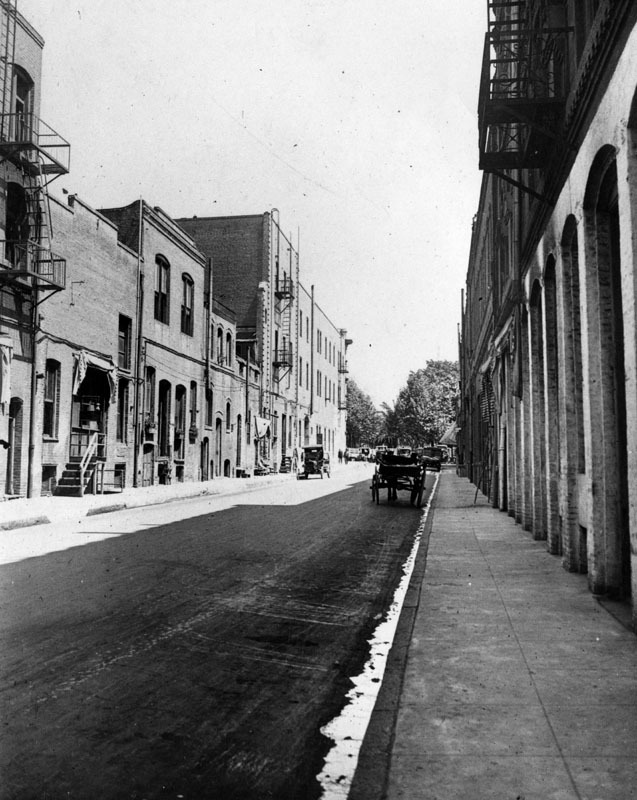 1920)^ - View of the buildings on the east side of Los Angeles Street, in Chinatown. Address shown is 434 Los Angeles Street. (ca. 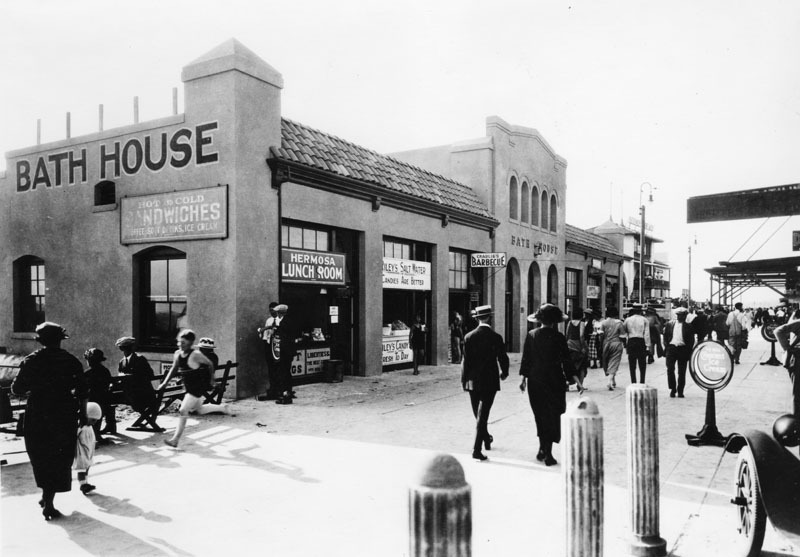 1920)^ - Shops on Los Angeles Street at Marchessault. 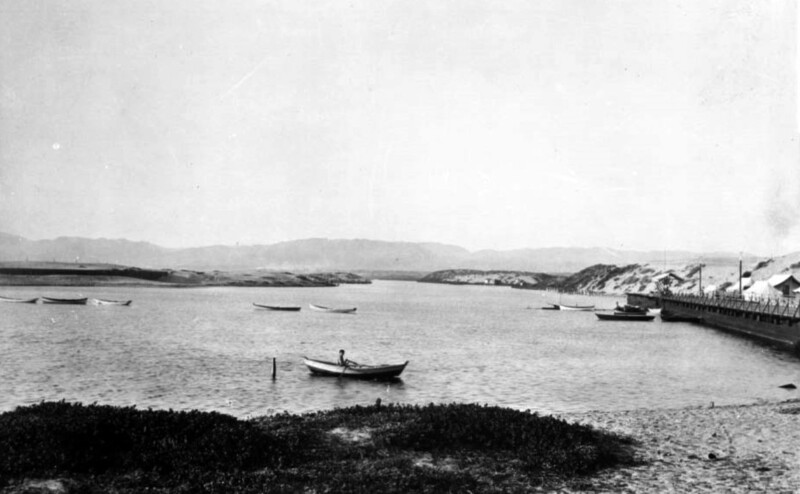 Shown are the Fook Wo Lung Curio Co., at 526-528, next to Houng On Company, at 524, and Chew Fun and Company, Chinese herbs in the old Vincent Lugo Adobe at right. 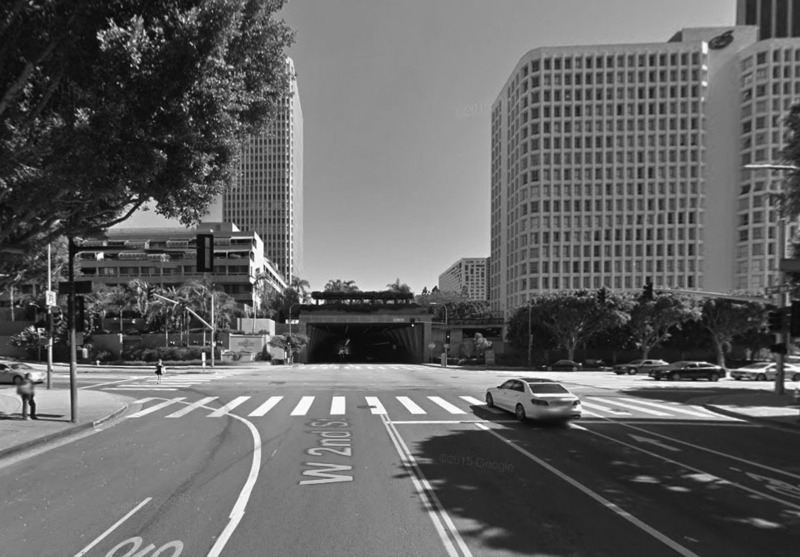 The LA Plaza is out of view to the right, on this side of Los Angeles Street. 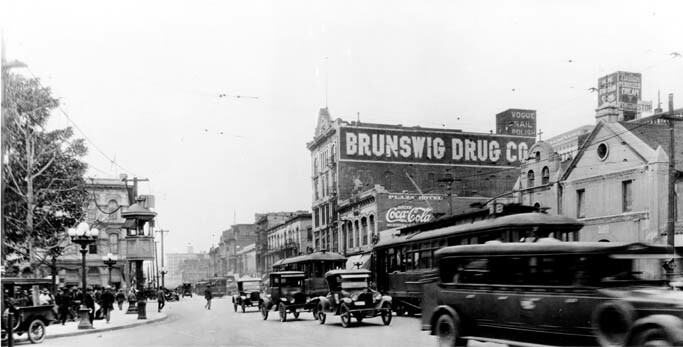 (1920)*#^^ - View of Main Street, includes the Old Plaza Church and Brunswig Building (Brunswig Drug Company) on the right and the Plaza and Pico House on the left. 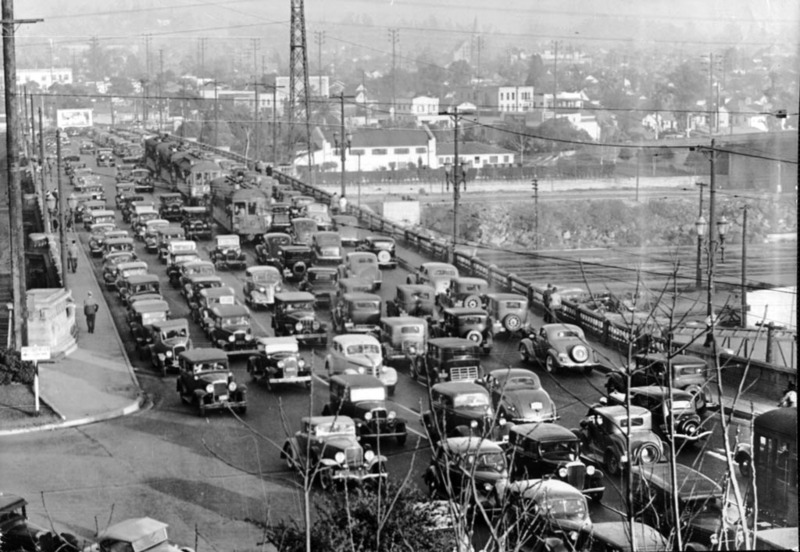 Heavy traffic, antique cars and trolley cars. (ca. 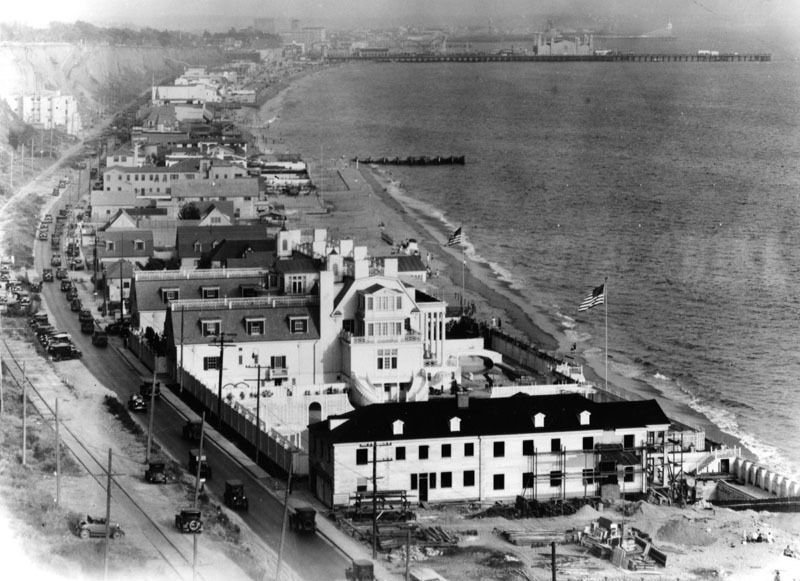 1920)*#^^ - View of the Pico House as the National Hotel from the Plaza circa 1920. 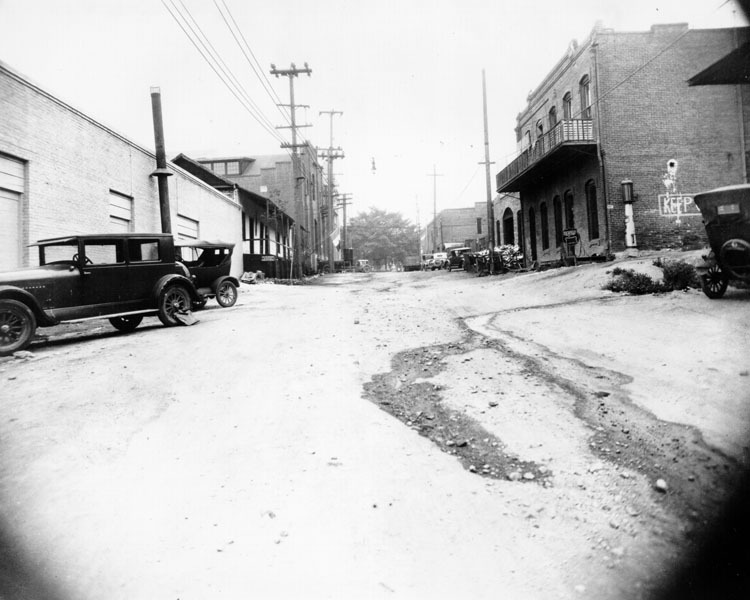 (1921)^ - View of Sanchez Street, lined with brick buildings, looking north toward the Plaza in 1921. 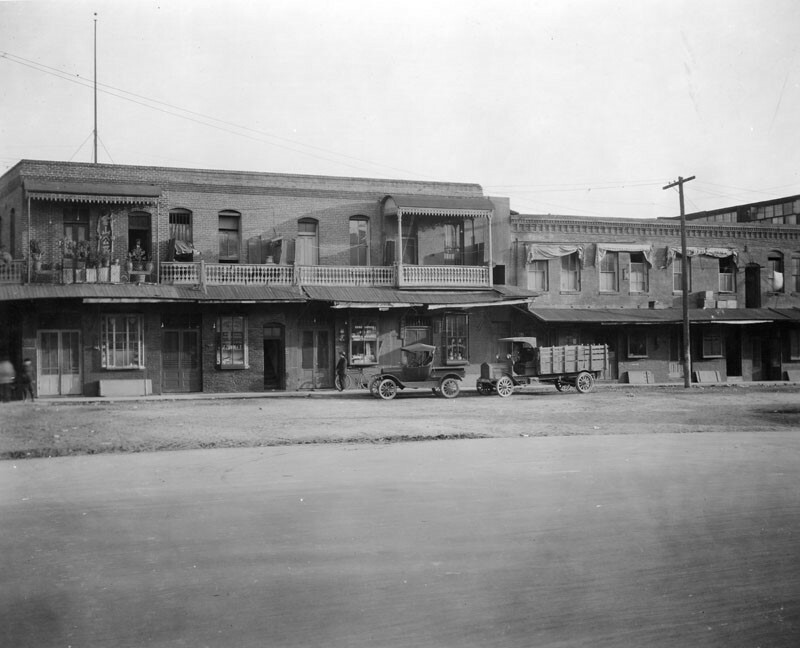 The first building at far left is the rear side of the Pico House and the rear side of the Merced Theater. 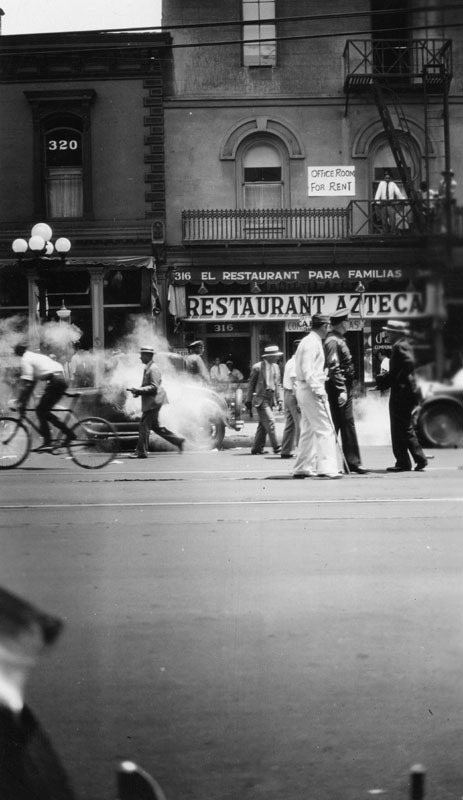 Sanchez Street juts south from the plaza, opposite its more famous twin, Olvera Street, on the north side. It's just a block long, but it's seen a lot of history. 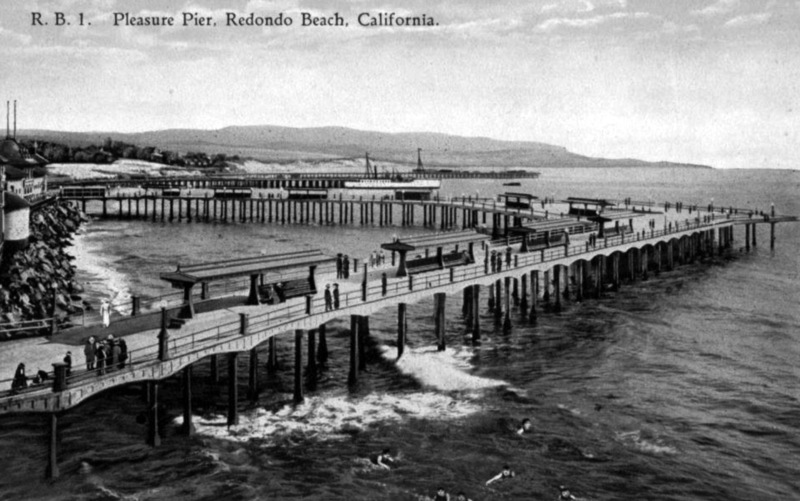 In the 1880s and '90s, it was the scene of several crimes reported in The Times. 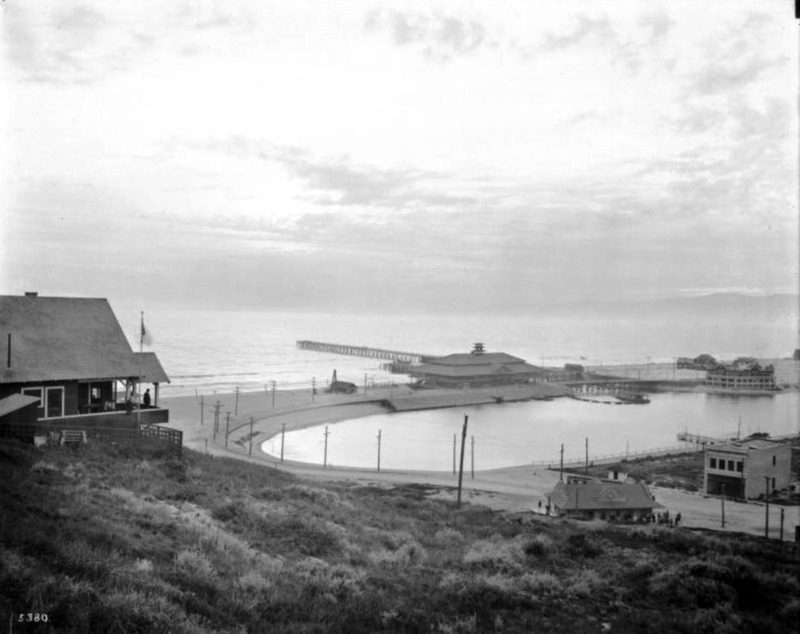 Most involved the local saloons and Chinese gangs of the day, including the 1889 shooting death of the "Peruvian Princess," a woman whose tortured life took her from Lima to China to San Francisco and finally to her death in a Sanchez Street boarding house. 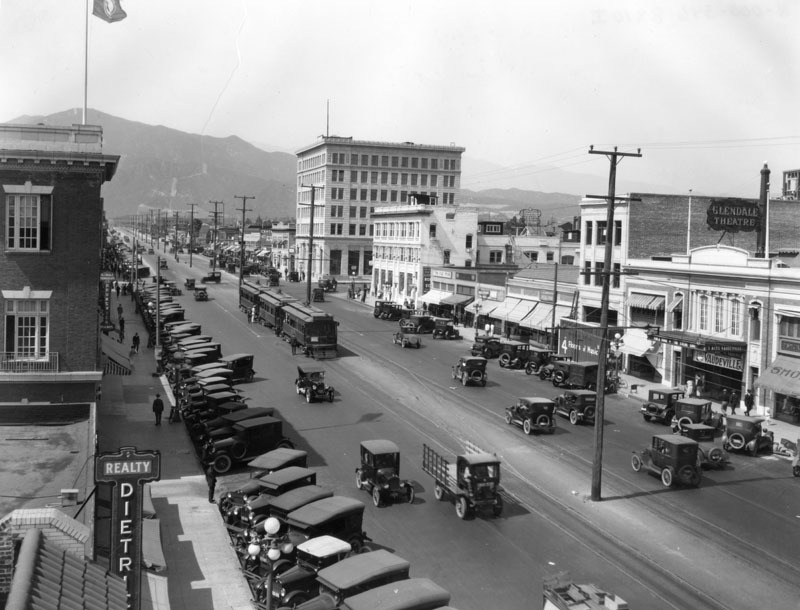 (1920s)** - View looking south toward the L. A. Plaza on Olvera Street before improvement. 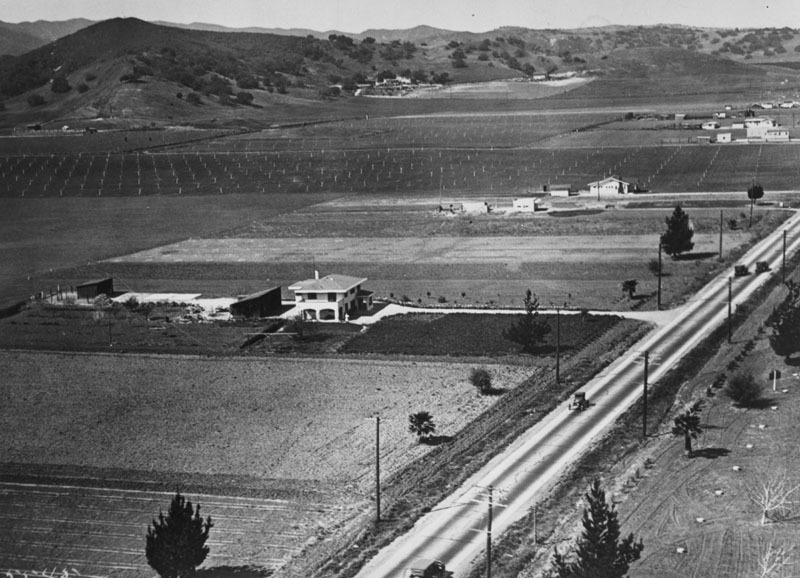 On the left the Avila Adobe is seen. 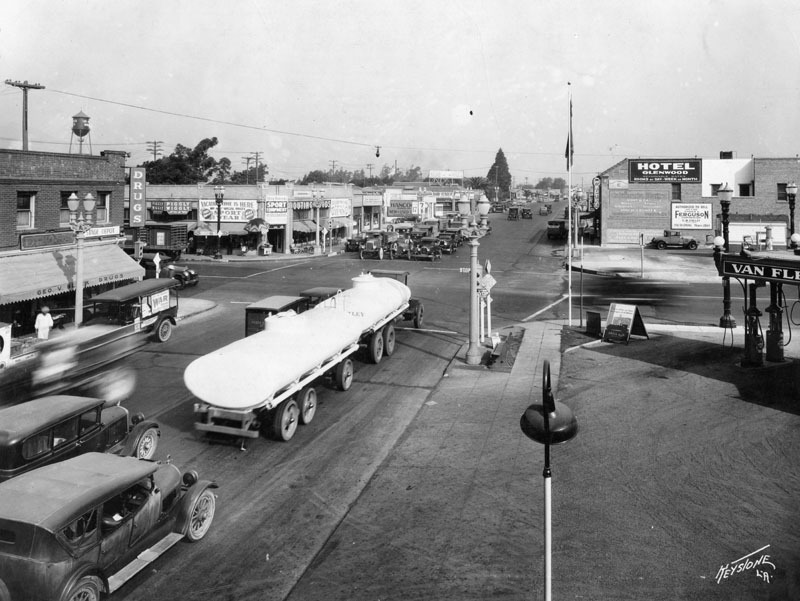 To the right is the Sepulveda House with a gas pump on its side. The Avila Adobe was built ca. 1818 by Don Francisco Avila, alcalde (mayor) of Los Angeles in 1810. 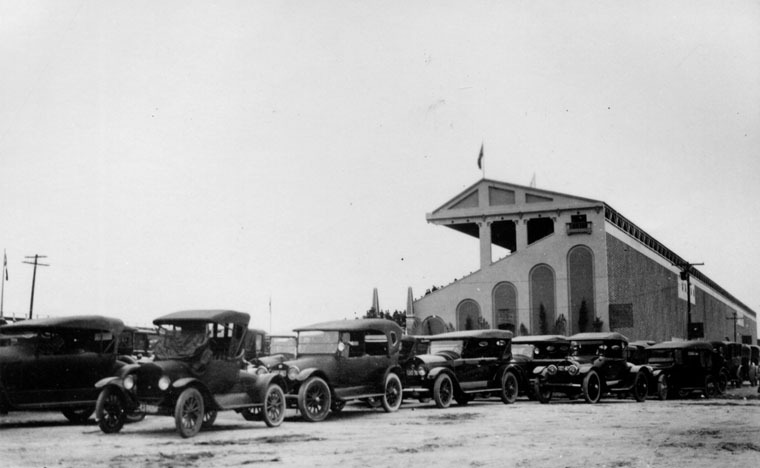 Used as Commodore Robert Stockton's headquarters in 1847, it was repaired by private subscription in 1929-30 when Olvera Street was opened as a Mexican marketplace. It is the oldest existing house in Los Angeles. (ca. 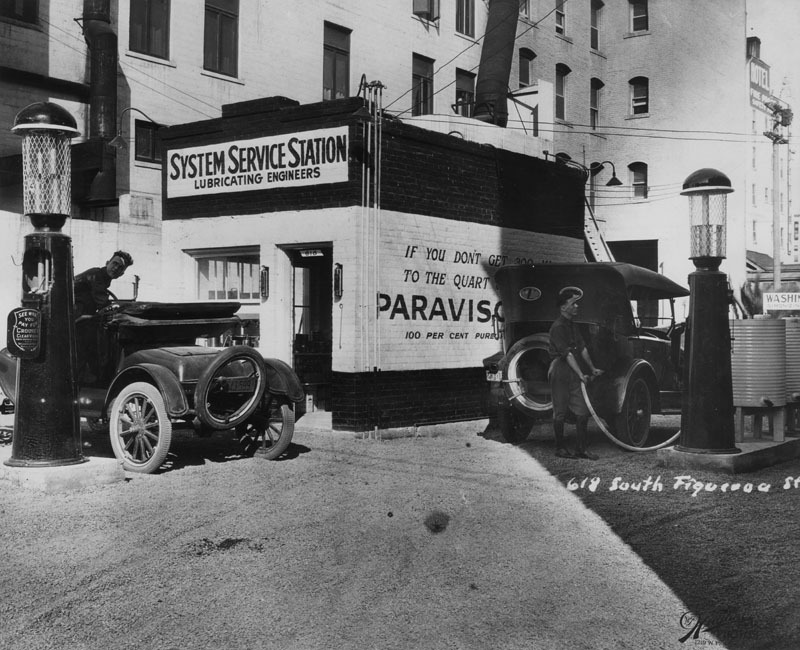 1920)^ - Two men are pumping gas into their cars from "Crouse Clear Vision: see what you pay for" pumps at the System Service Station at 618 South Figueroa St. One car, left, has its top down. 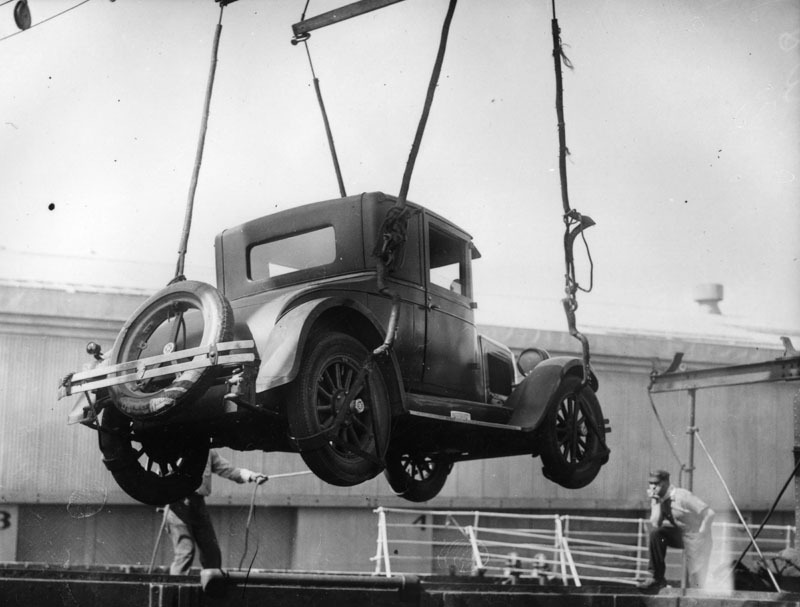 Both cars have spare tires attached to the back. The small, brick, one-story service station is painted in three stripes with "Lubricating Engineers" under the station name and a painted advertisment for "Paravision" on the side. The service area is paved in gravel and far right is a partial sign for "Simonizing". 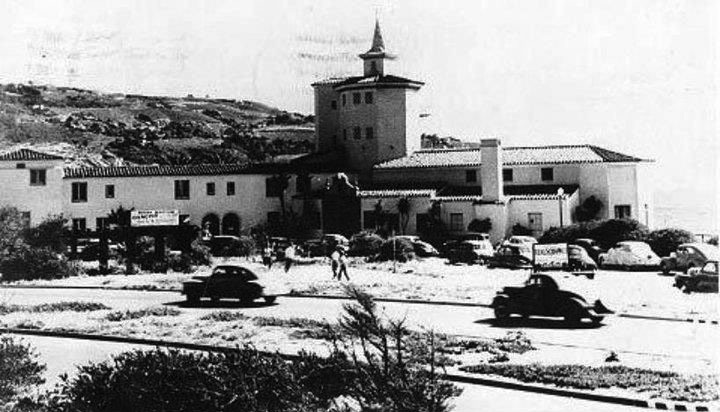 Multi-storied buildings are directly behind the station and in the background, left, is a hotel advertized as "fire proof". (ca. 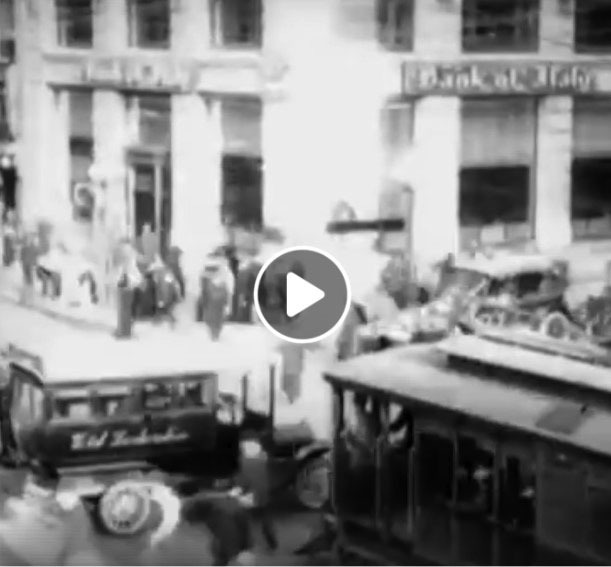 1920)^ - Pedestrians and a traffic cop face off at the intersection of Hill and 8th St. According to the Union Bank & Trust clock, it's 1:30 in the afternoon. 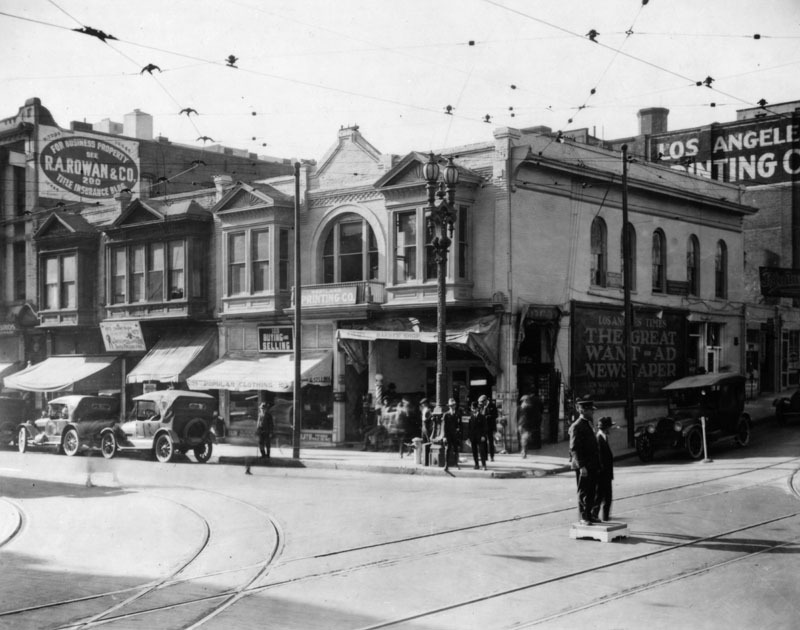 On the left, awnings from The Owl Drug Co., Van de Kamp's Bakery and Ted's Tie and Robe Shop shade the sidewalk. "Herberts Cafe" vertical sign edges the Jewelers Building, center. The Alhambra Theater in the Edward D. Silent Building advertises the "Love Doctor, a Talkie" in its marquee. Another vertical sign, this one for Birch and Smith Furniture Co., is just before the theater. (ca. 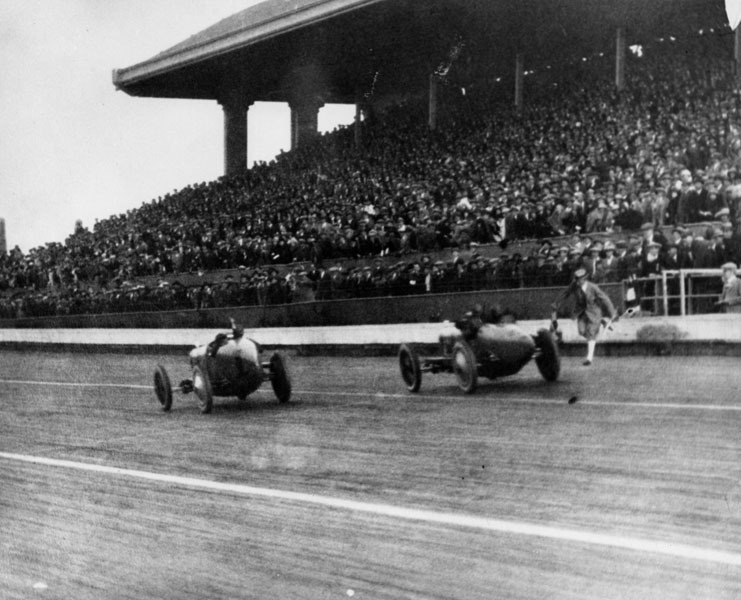 1920)^ - The Rueder Block No. 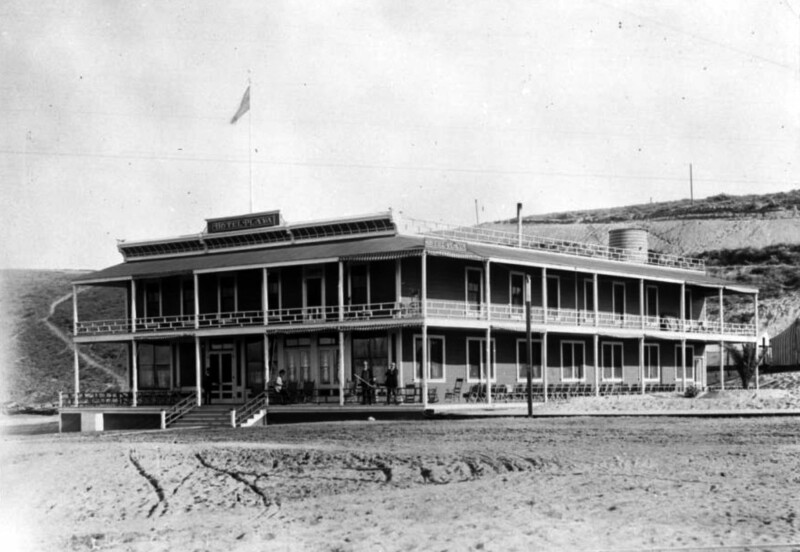 2, 1892, building houses the Salt Lake Hotel and various retail stores, such as Winsel Gibbs Seed Co. and M. Wright & Son, who claims "we buy & sell everything from a needle to a battleship". 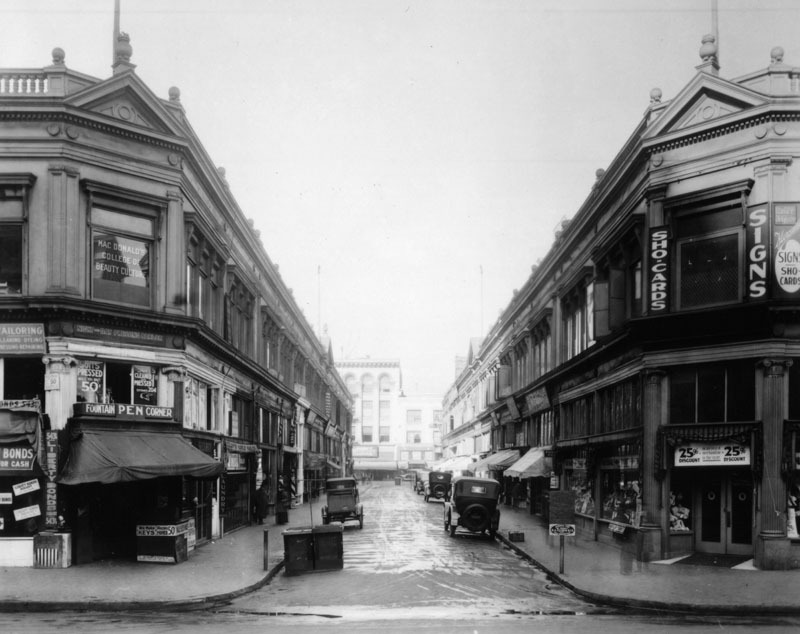 A shooting gallery, vaudeville theater (all seats 10 cents) and an auto park (entrance on 3rd) are some of the retail businesses active on this busy street. (ca. 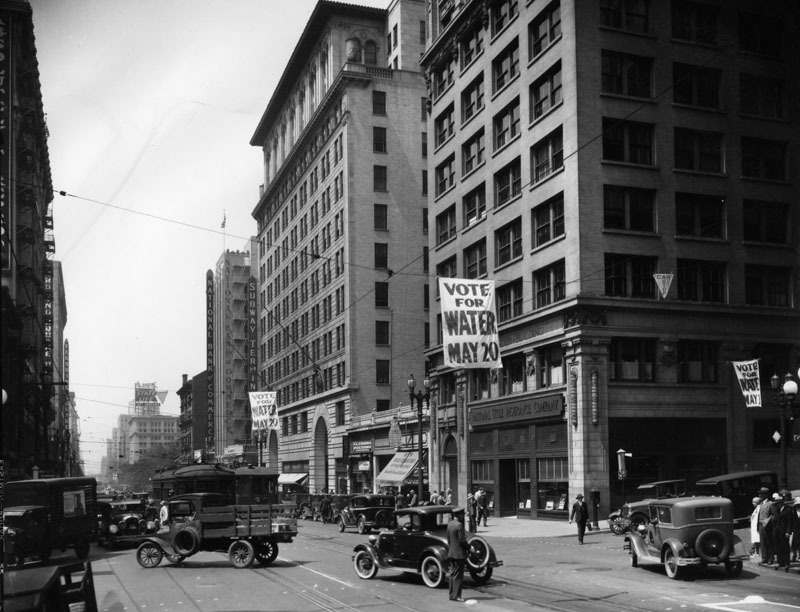 1925)^ - "Vote for Water, May 20" banners span Hill Street as a white-gloved cop waves traffic through Hill & 4th intersection. 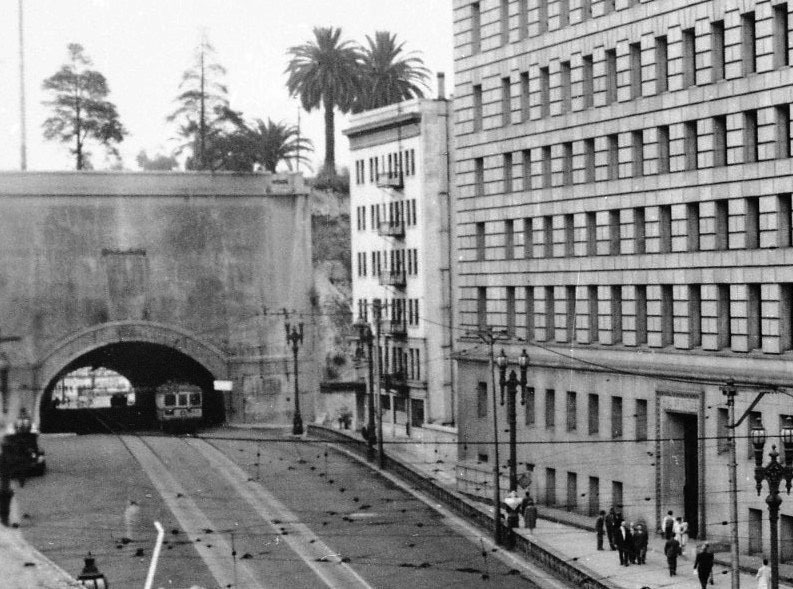 Buildings are: Pershing Square Building, left; Subway Terminal Building, center; National Bank of Commerce Building next to Subway. 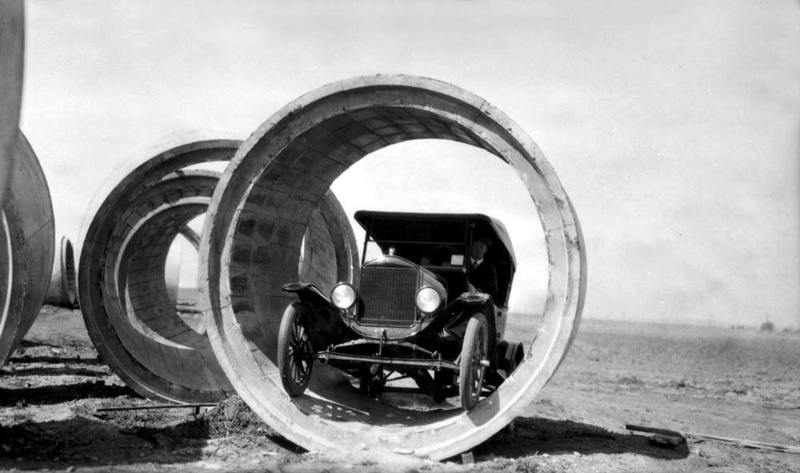 In 1913 the Los Angeles Aqueduct was completed and the City had a new source of water. 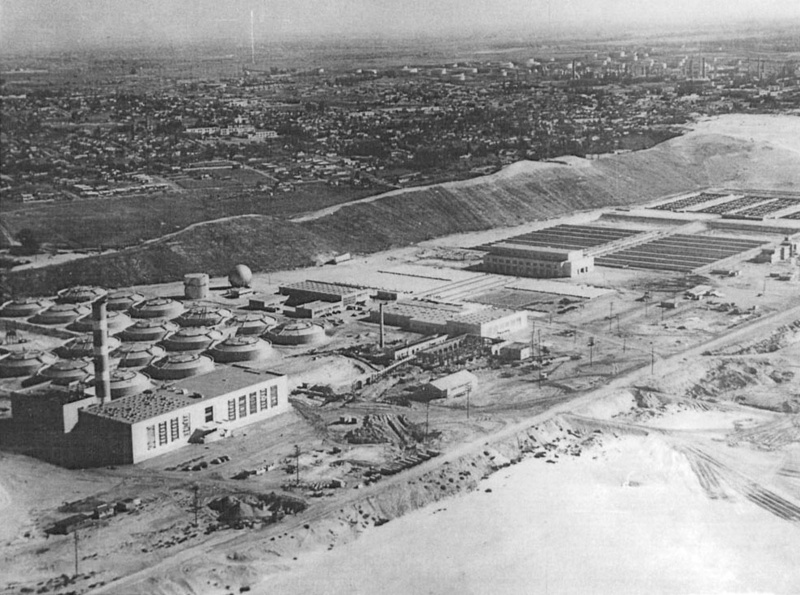 L.A. proceeded to annex outlying communities attracted by the promise of an abundant water supply. 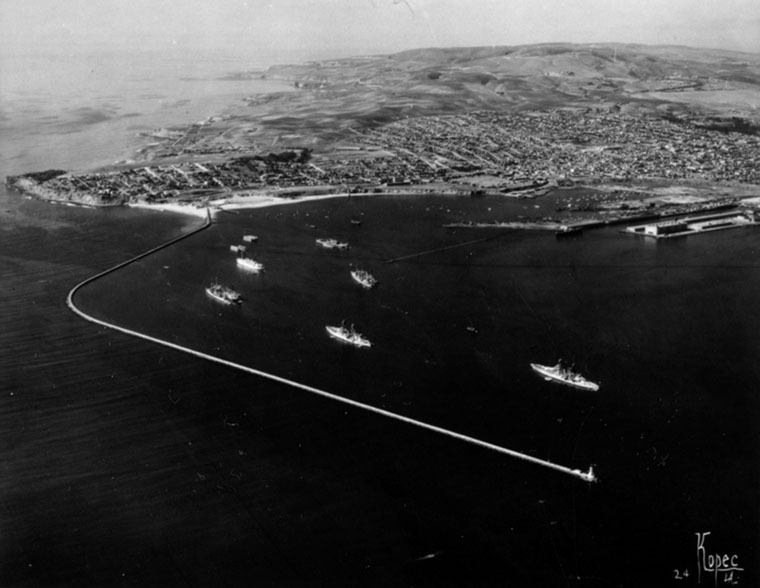 The flurry of annexations began even before the aqueduct was complete. (ca. 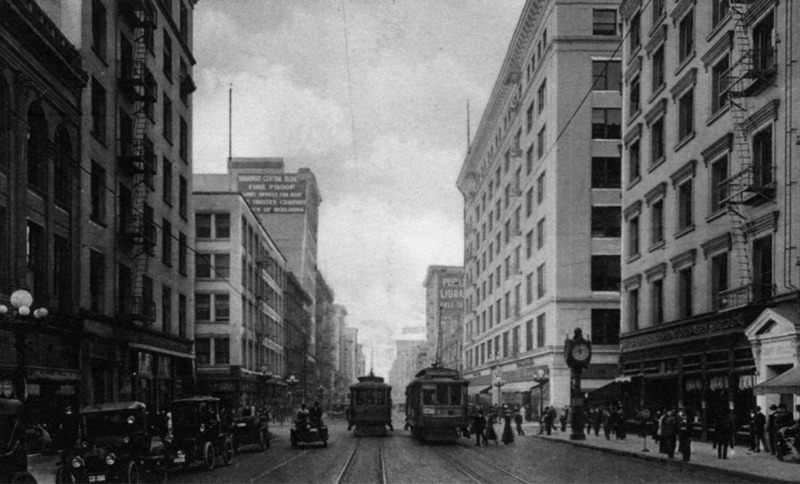 1920)^ - Streetcars, automobiles, horse-drawn carriages, and pedestrians clog the intersection of Broadway and 7th Street. 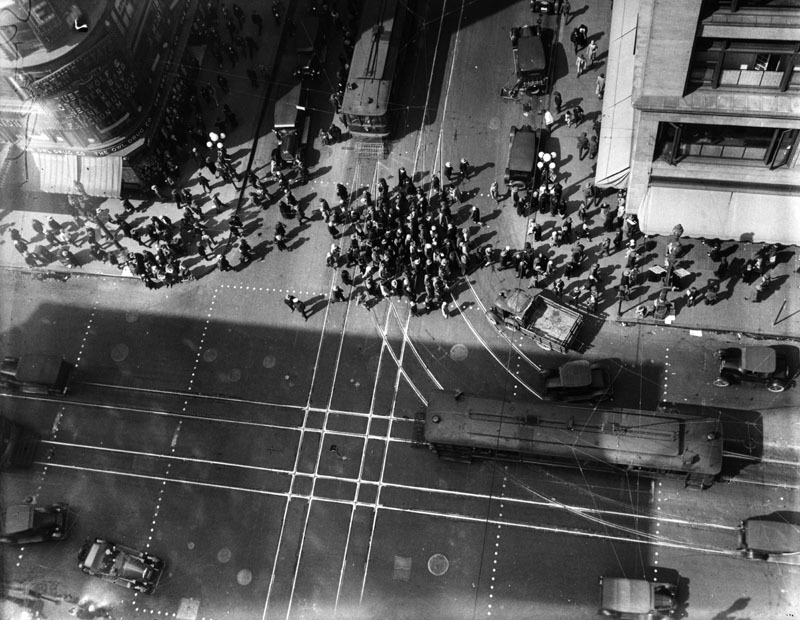 (1920s)^ - A view of the intersection of 7th and Broadway taken from directly overhead showing throngs of people crossing the street. 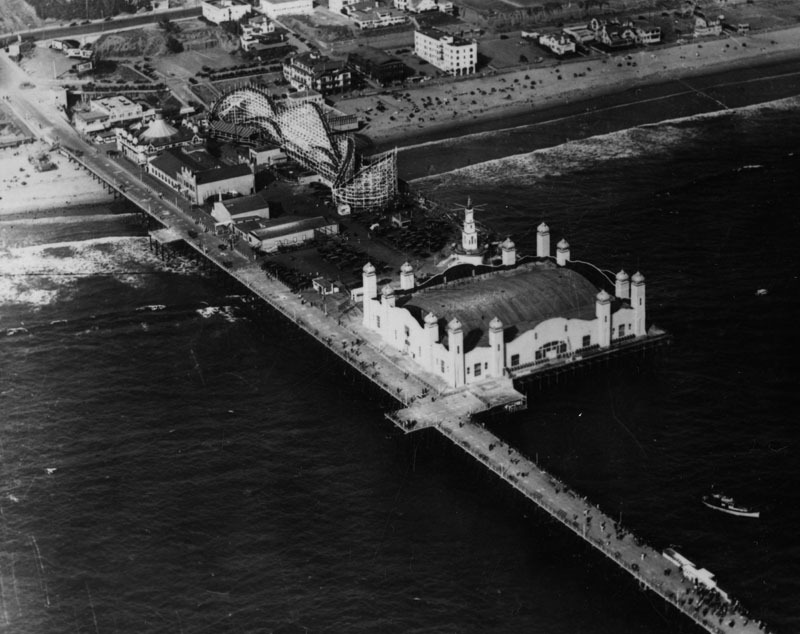 On the top left (southwest) corner is the Loew's State Theatre. (ca. 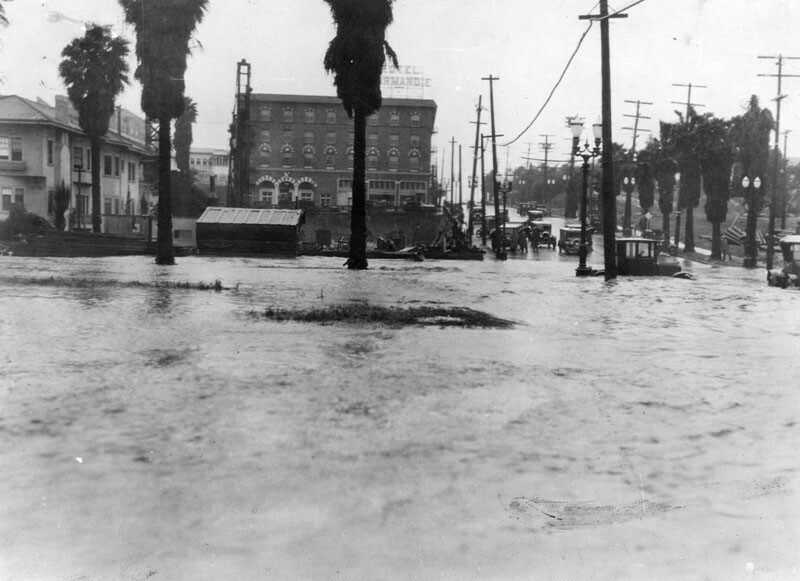 1922)^ - View of 6th Street and Mariposa Avenue, looking toward the Hotel Normandie, across a lake of water. 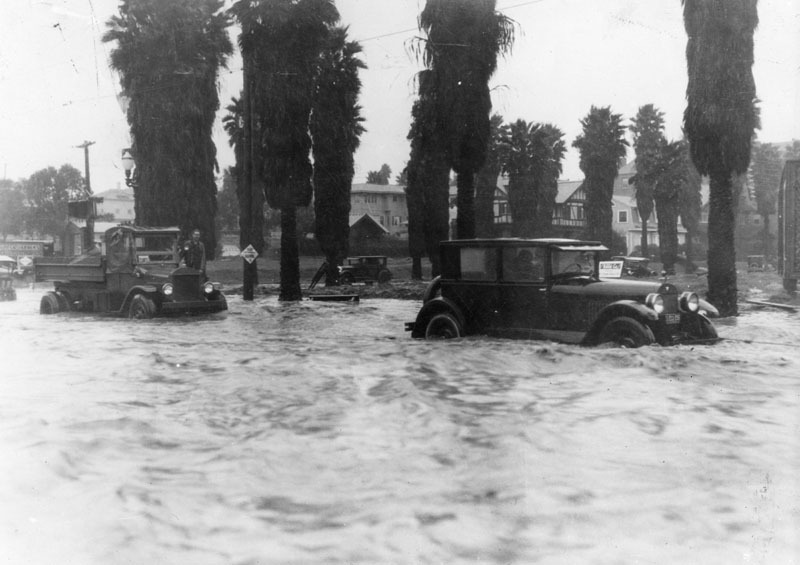 (1920s)^ - Vehicles in the flooded intersection of 6th Street and Mariposa Avenue before the building of a storm drain. 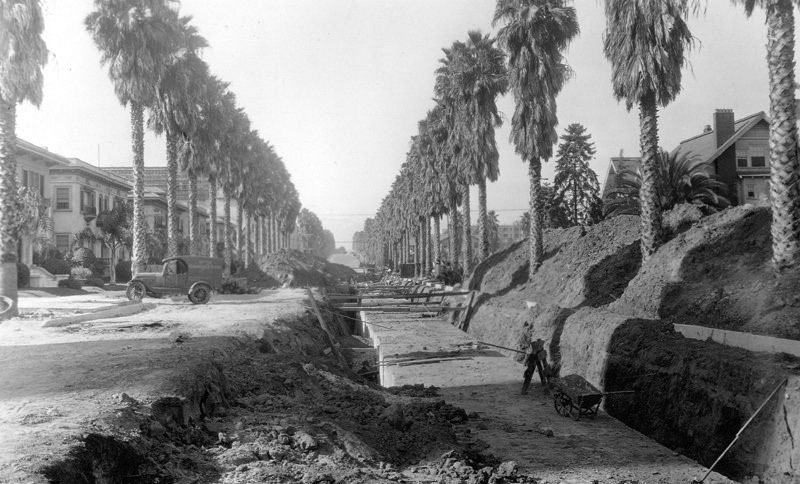 (1927)^*^** – View showing the construction of a storm drain on Mariposa Avenue, looking north from Wilshire Boulevard. (ca. 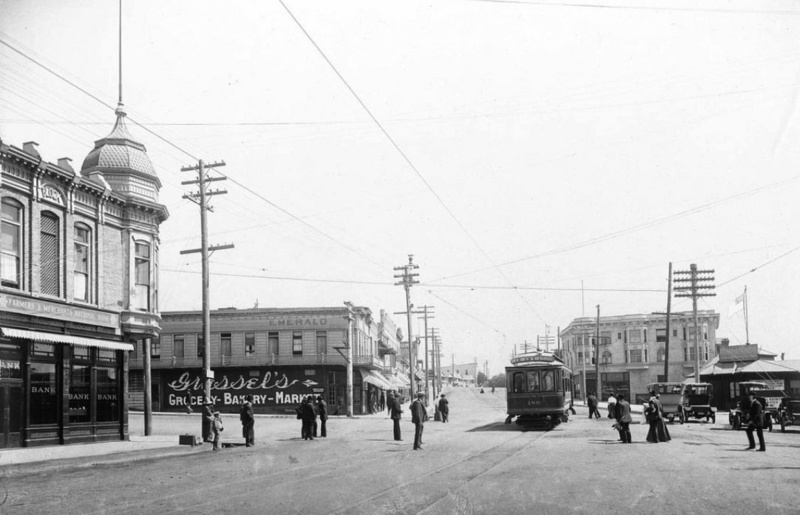 1920s)^ - Panoramic view of the intersection of Olive and 7th Streets, looking south. At right is the building originally built as the Ville de Paris Department Store circa 1917, then remodeled in 1940 as the Merchandise Mart to accommodate various wholesale businesses. 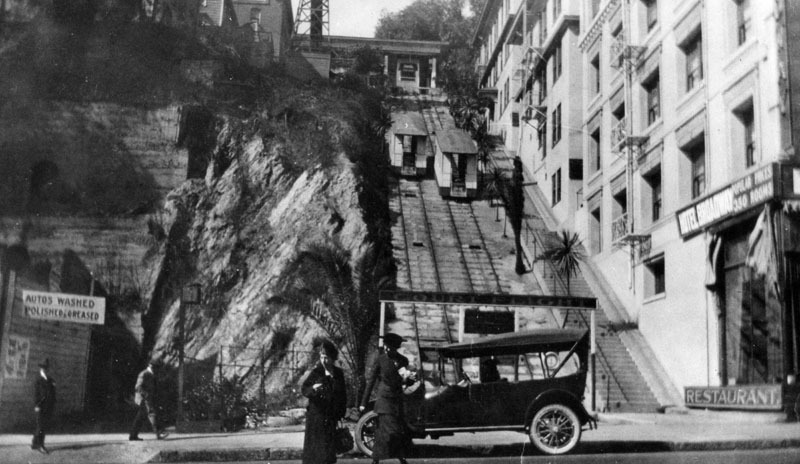 At left is the Los Angeles Athletic Club building. 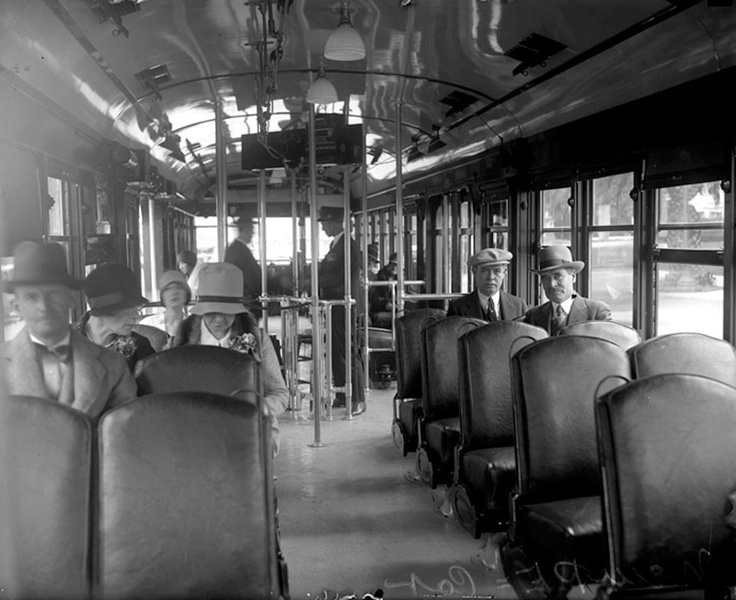 A number of streetcars, as well as cars, are on the street. 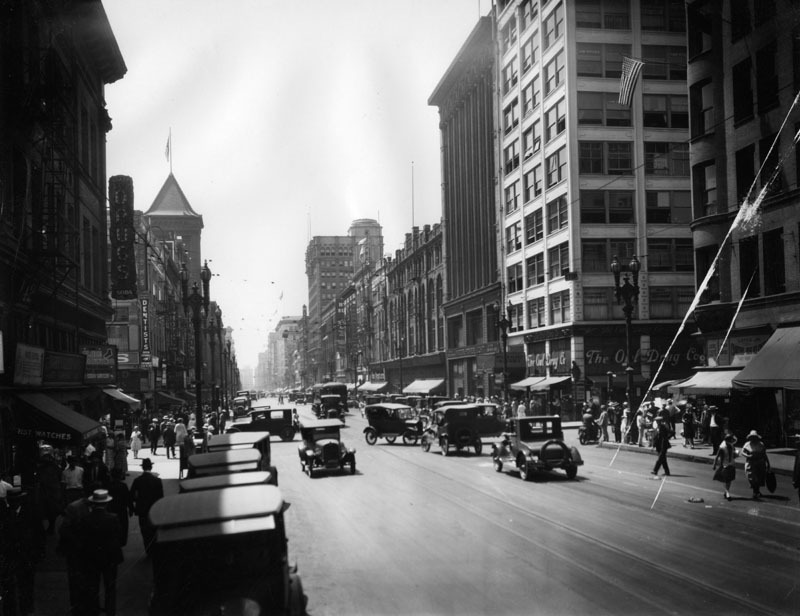 (1922)^^ - View looking south on Olive between 7th and 8th streets. 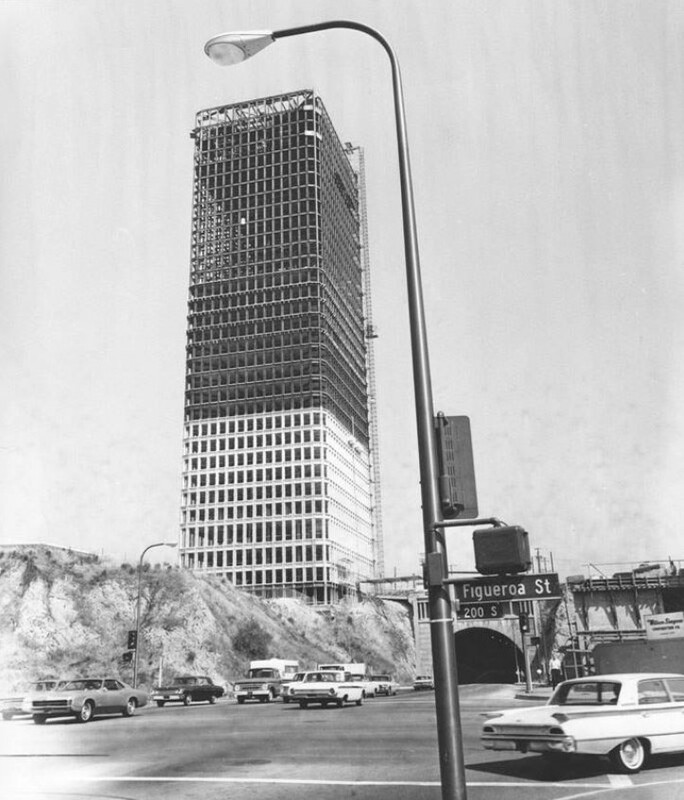 The new Pacific Telephone Co. building is under construction on east side of Olive Street. 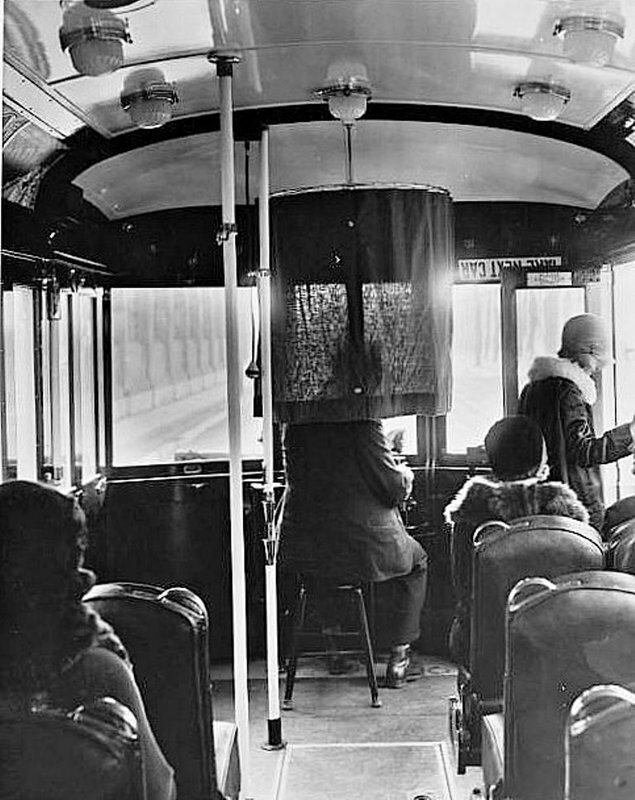 (1930)*^^* - “Operator, may I help you". 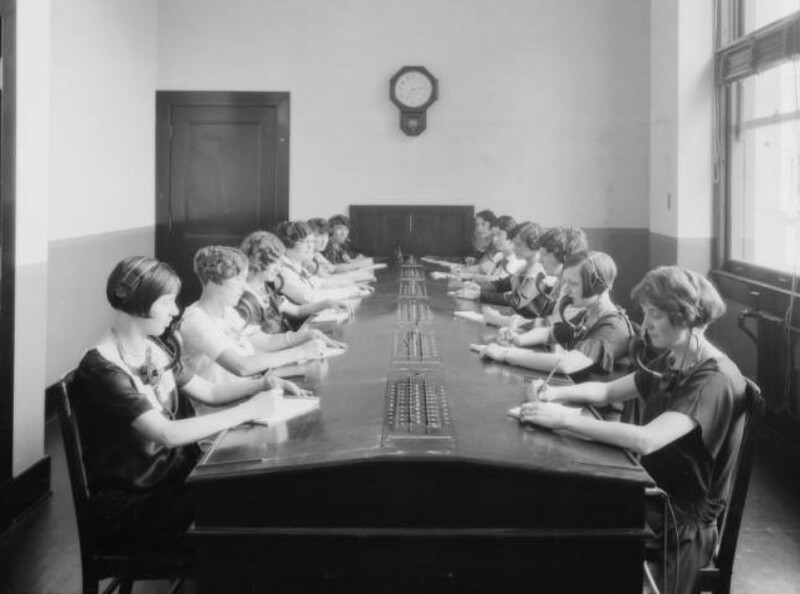 Before you had to press a zillion buttons to get through to a human, these women did it for you on a switchboard! 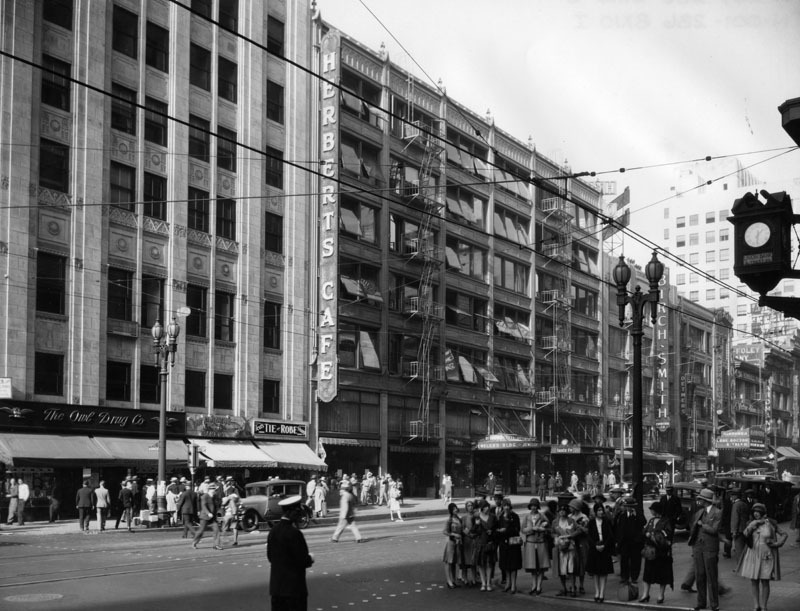 View is of the switchboard at Pacific Telephone Company in Los Angeles located at 716 S. Olive Street. (ca. 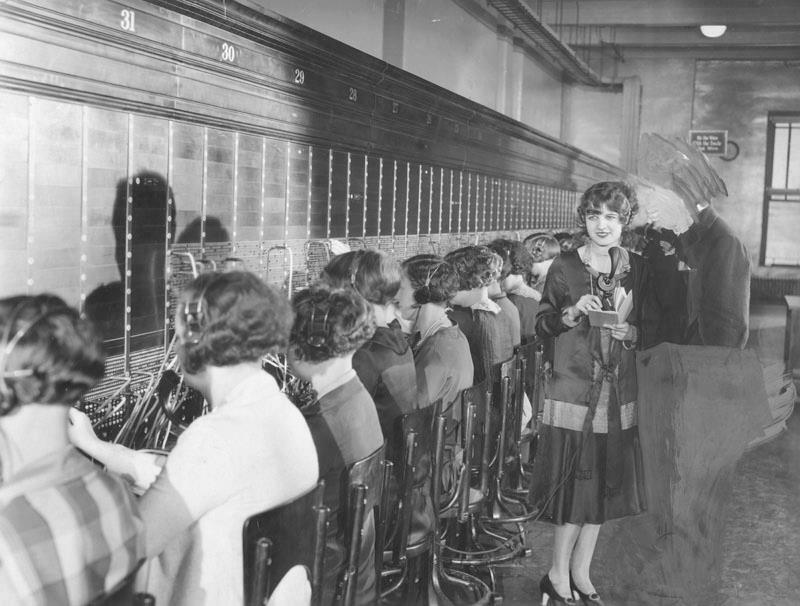 1925)^^ - Photograph of women operating the communication switchboard at The Broadway Department Store located on the corner of 4th and Broadway. (ca. 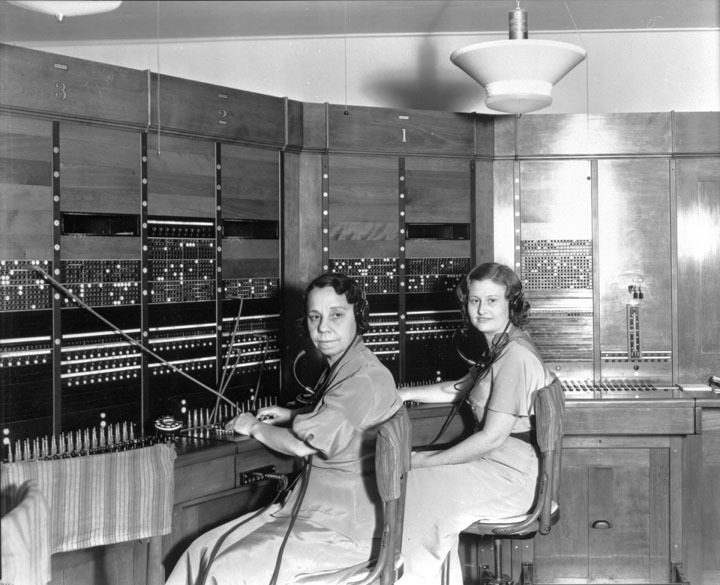 1930s)* - Early Telephone Exchange in the Bureau of Power and Light commercial building in downtown L.A., with telephone operators Alma McKnight (left) and Doris Scott (right). (ca. 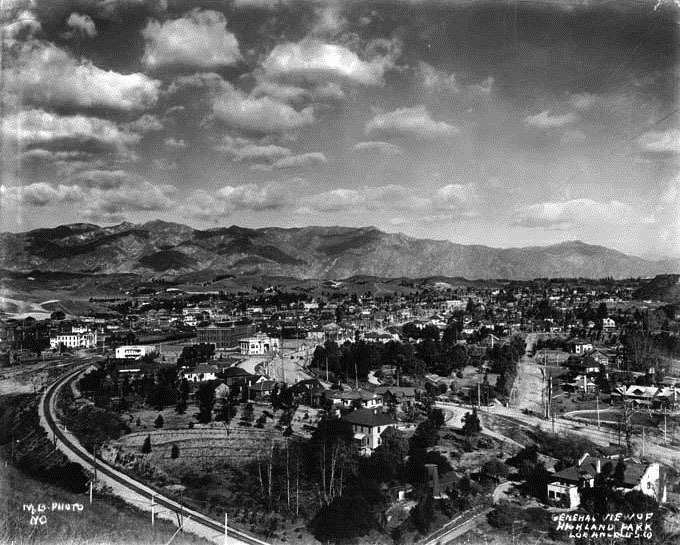 1920)^ - View of Ventura Boulevard in Sherman Oaks, in the San Fernando Valley. (ca. 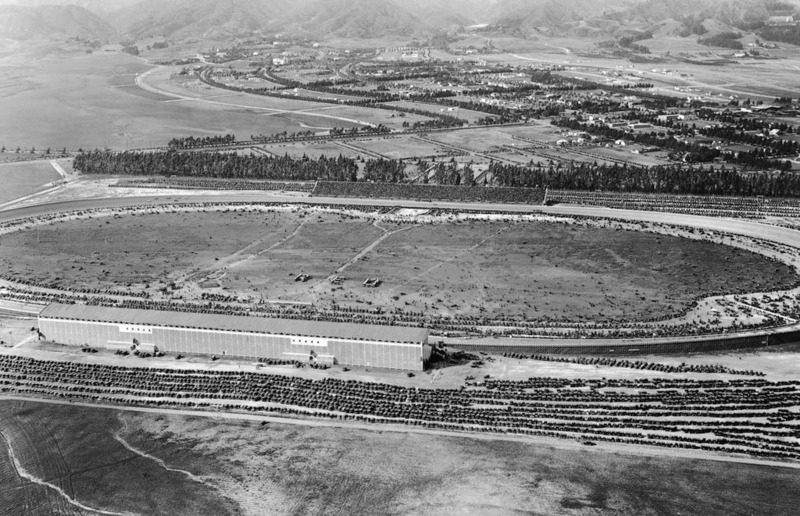 1920s)^ - Aerial view of farms and fields in Canoga Park in the San Fernando Valley. (ca. 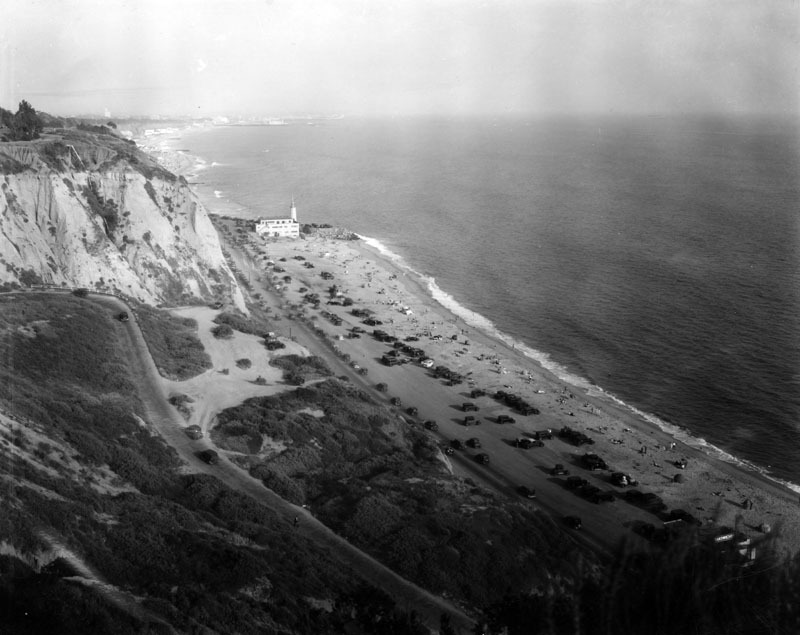 1915)#^# - View from the Palisades looking toward Malibu showing Inceville, the famed motion picture studio founded by Thomas Ince. 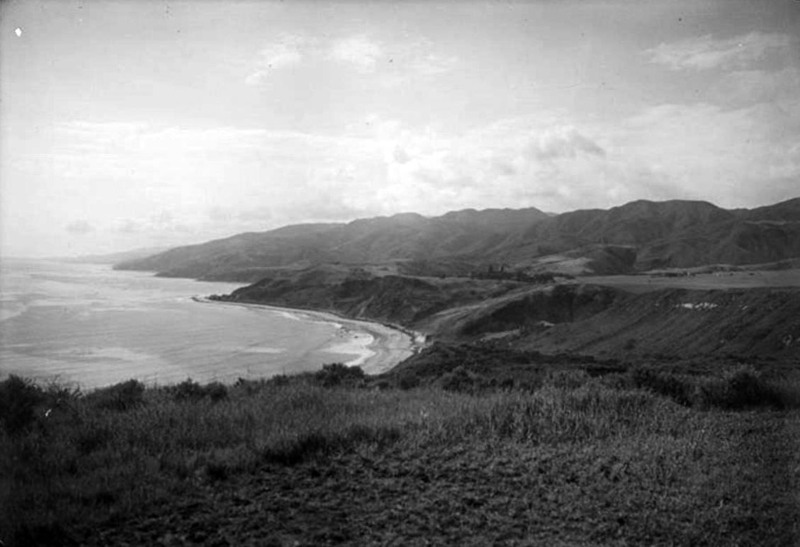 (1915)^ - View of Inceville, on Sunset Boulevard (Santa Ynez Canyon) at the Pacific Ocean, where Ince Studios filmed location scenes. (ca. 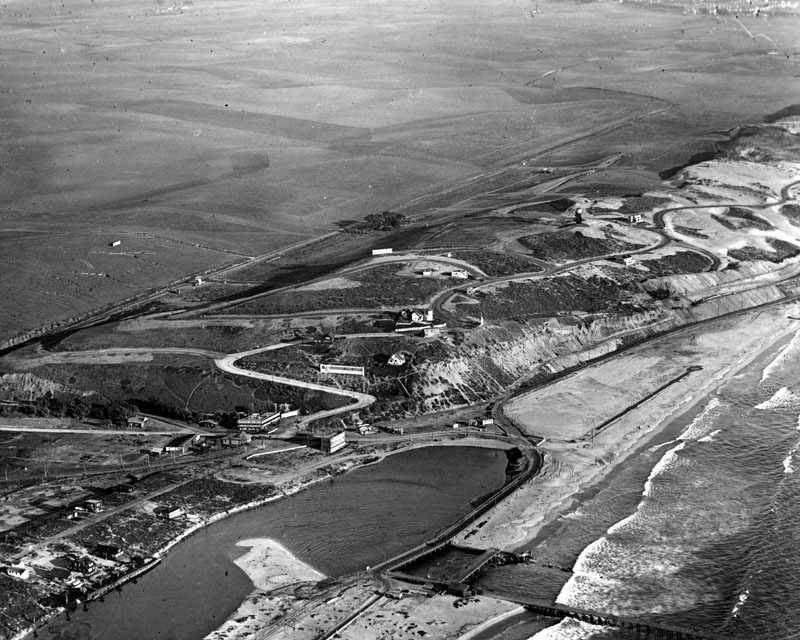 1916)^#^ - The mouth of Santa Ynez Canyon at the Pacific Ocean was once home of Inceville, an early 1900s film studio built by film director Thomas Ince. 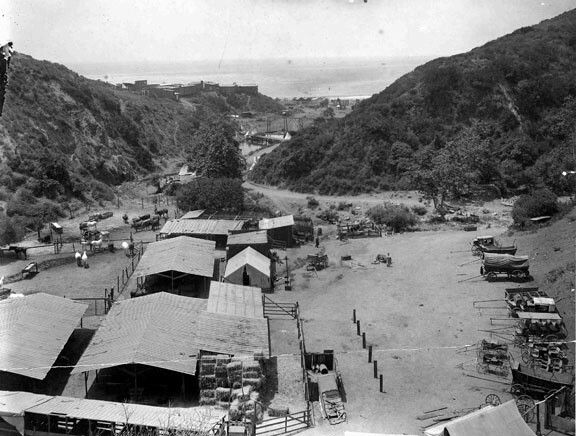 (1916)#^# – View showing the Inceville Studios built by silent film producer Thomas H. Ince at the mouth of Santa Ynez Canyon. 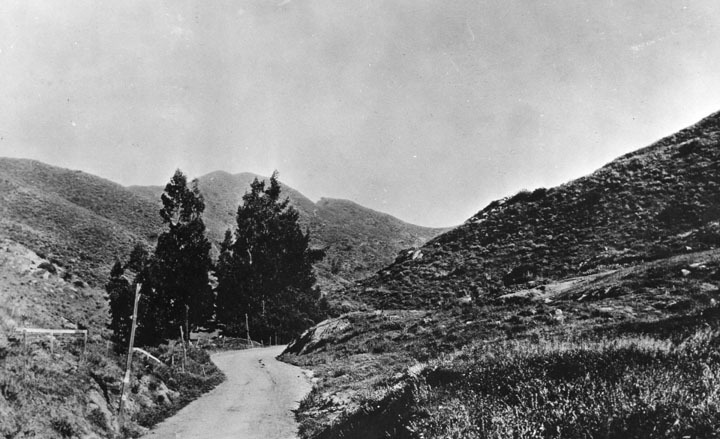 (1916#^# - Looking down Sunset Boulevard with a view of silent film producer Thomas Ince's Inceville Studios in Santa Ynez Canyon. 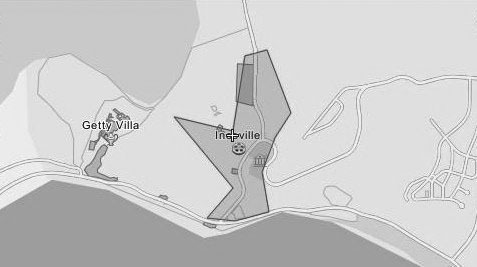 (n.d.)*^ - Map showing the location of Incville relative to where Sunset and PCH are situated today. (ca. 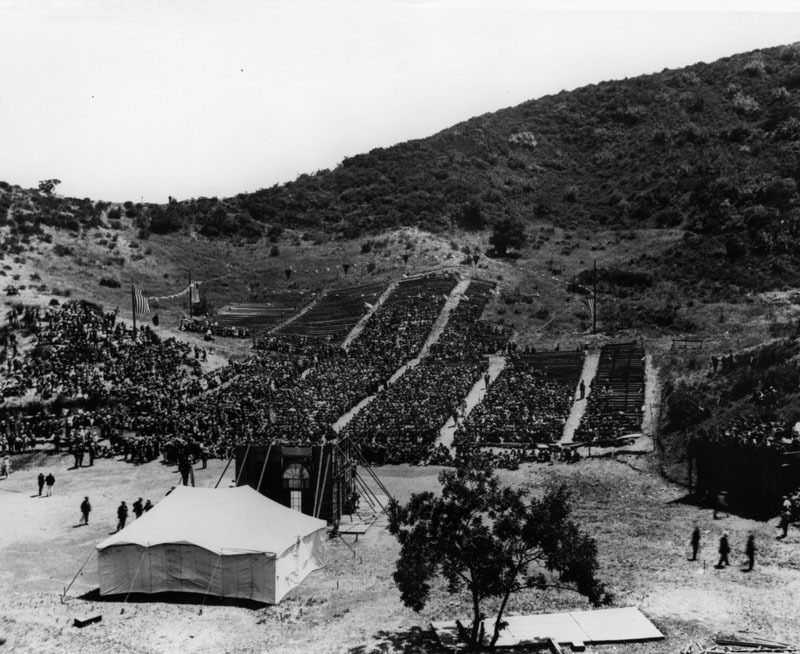 1916)*^ - View of houses and stage sets at Incville. 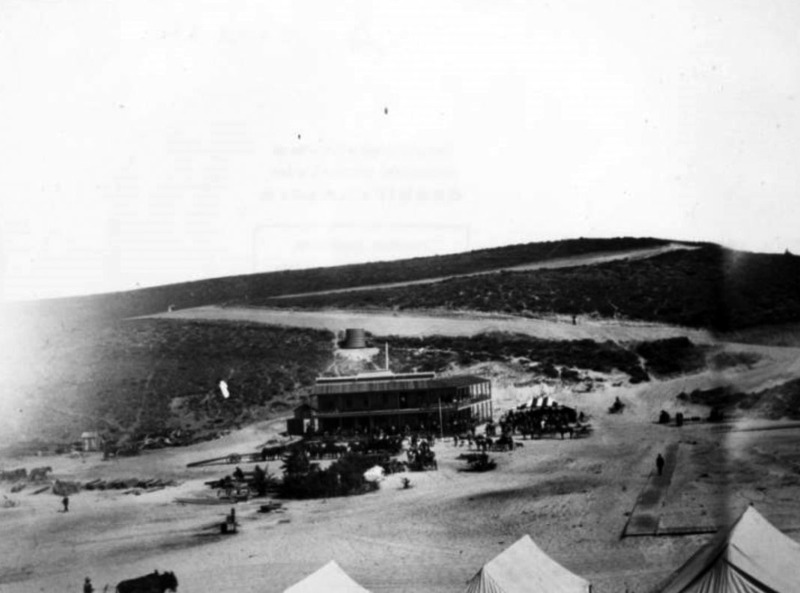 Large sign on one of the buildings reads: Triangle Ranch. Incville's cost continued to rise as moviegoers enjoyed the more expensive feature films, which used five reels or more. 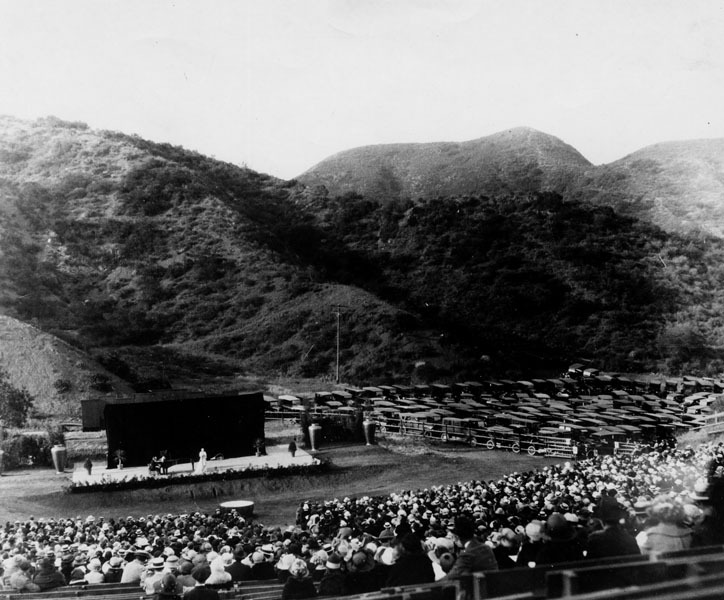 Ince, through his alliance with Triangle, a production company founded by D. W. Griffith and Mark Sennett, built a new studio in Culver City to use for indoor movies, while retaining Inceville for outdoor locations and Westerns. (ca. 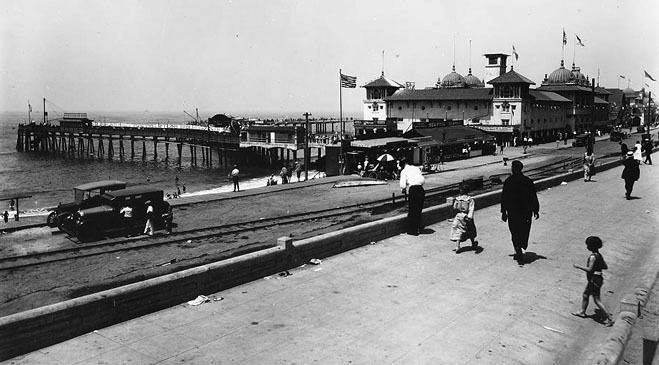 1915)*^#^ - View showing a man standing on a bridge leading to Inceville Movie Studio village on the beach at Pacific Palisades in Santa Monica. 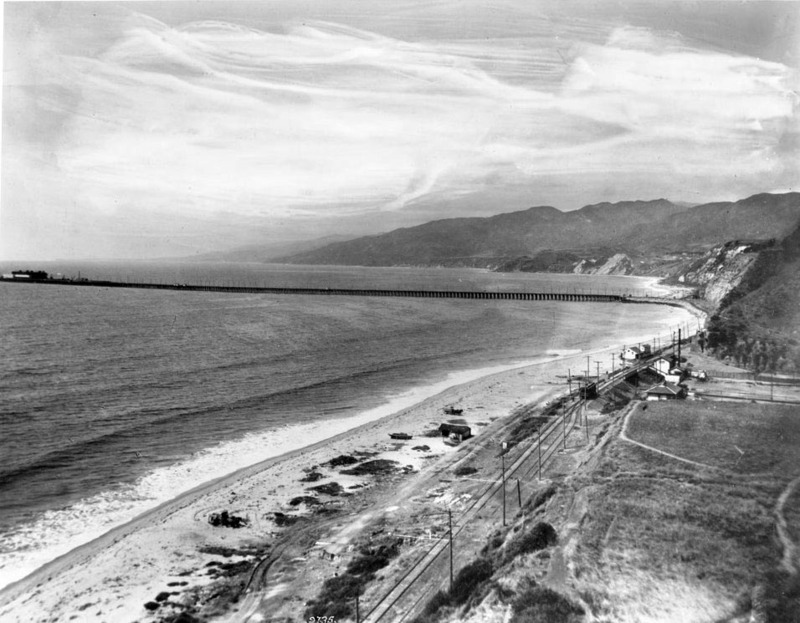 A sign on the bridge reads "Take this newly completed scenic drive Santa Monica Los Angeles." 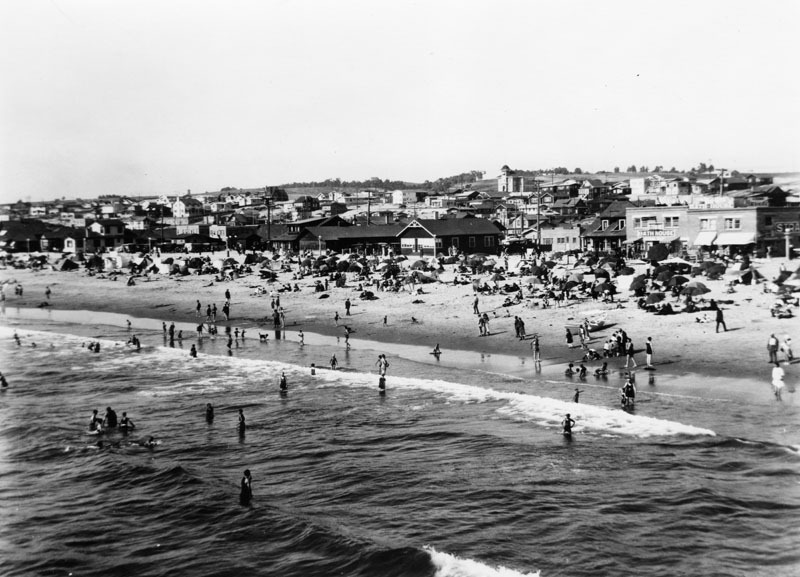 See more in Early Views of Santa Monica and/or Early Views of San Pedro and Wilmington. 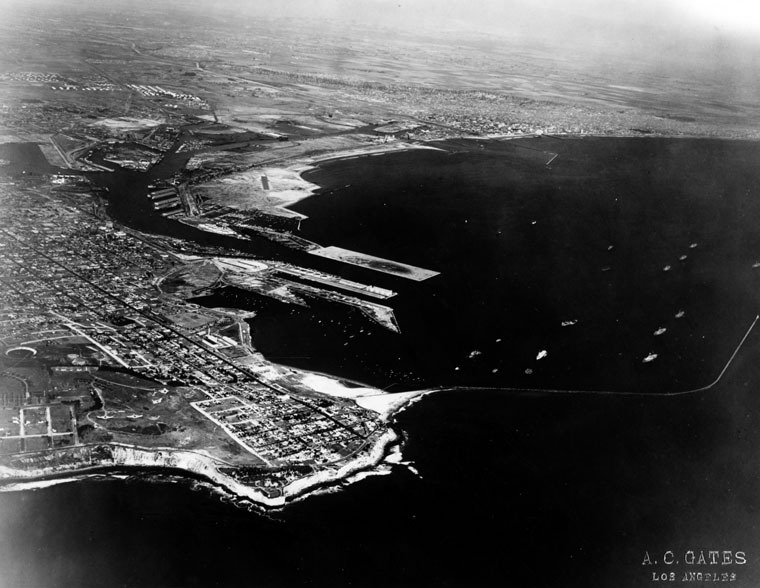 (1921)**^*# - Aerial view showing Playa del Rey, Bluffs and Playa Vista. 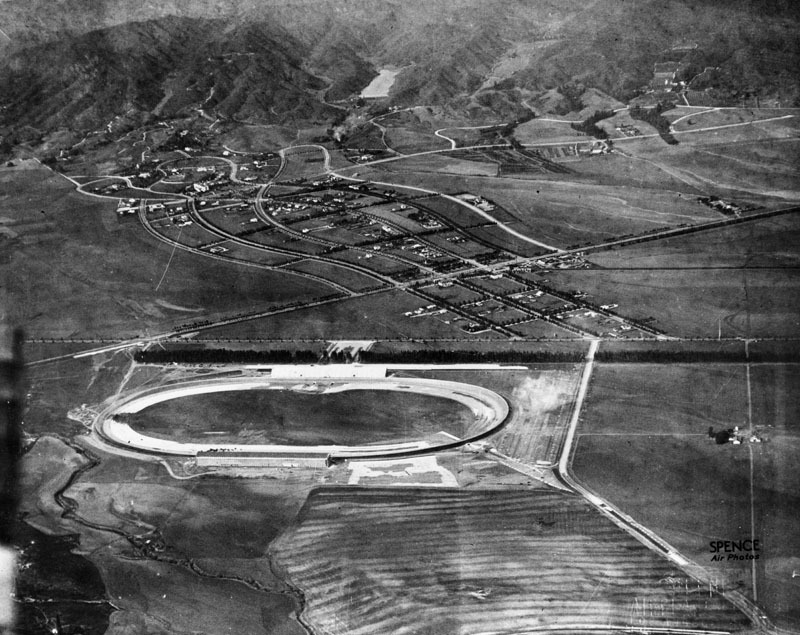 The center-right area became Mines Field and later LAX. 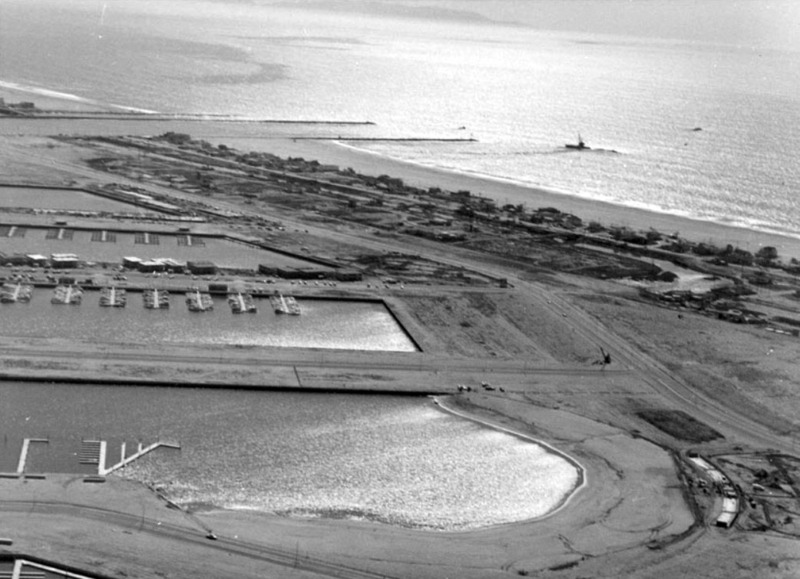 The beach area at botom would become a new housing development called Surfridge.